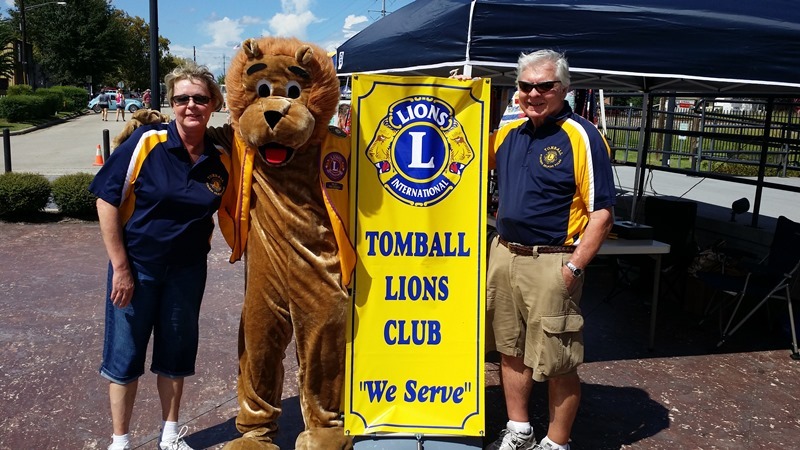 The Tomball Lions Club participates in the Annual Tomball German Fest to promote Lionism in the community. 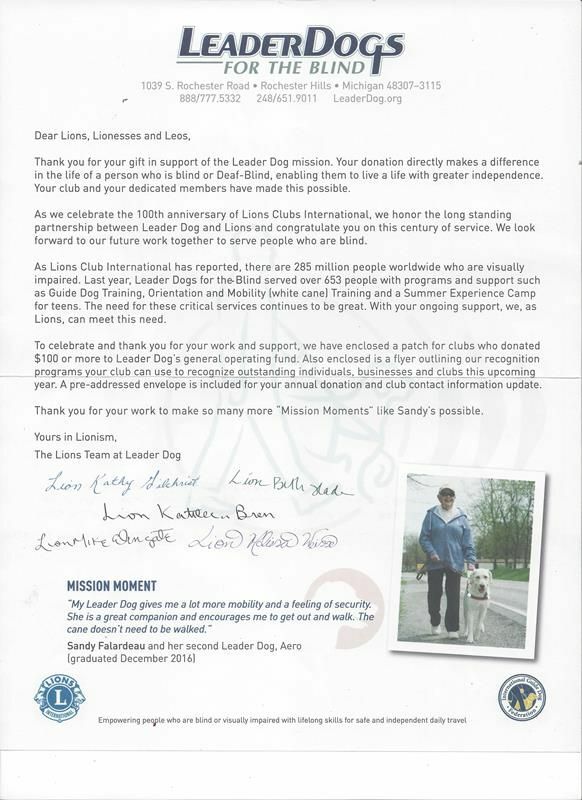 We provided information and requested donations for the Lions White Cane Day. 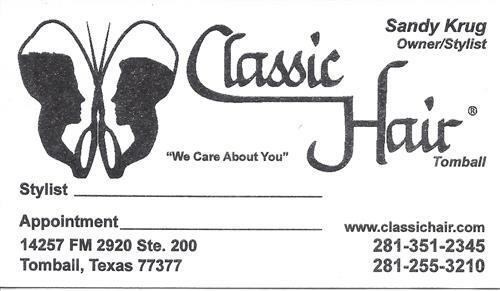 We were able to raise $157 to give to Lions Eye Bank of Texas. In two days we were able to do seventy three (73) eye screens with only three referrals. We provided membership information to promote bringing new Lions into our club. 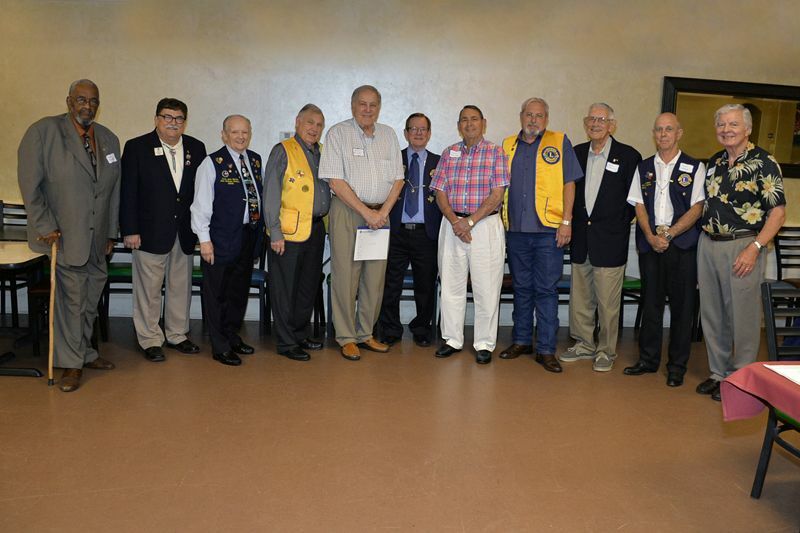 The Tomball Lions Club participated in the March 26, 2019 LSC Sponsors SCholarship Reception. Pictured above from left to right are: TBLC 1st Vice President Bob Ervin, TBLC 2nd Vice President Reyna Sirias-Ortiz, one of the students receiving a scholarship from TBLC and TBLC Director Erin Stapleton. 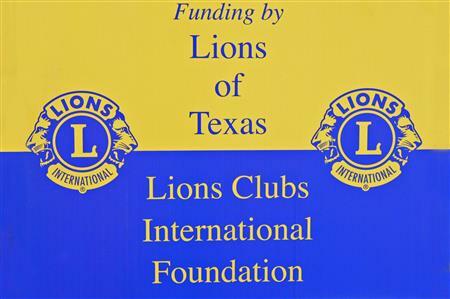 Lion Treasurer Al Gerhardt of the Tomball Lions Club has been contacted by Heart for Texas Hurricane Harvey Relief Group to assist them with bedding for approximately 70 families in District 2-S2. Lion President Bubba Hardee welcomed guest speaker, Dr. Lee Ann Nutt, President of Lone Star College – Tomball. Pictured from left to right are 1st Vice President Bob Ervin, Dr. Lee Ann Nutt, Treasurer Al Gerhardt and President Bubba Hardee. Photo provided by Lion Al Gerhardt. 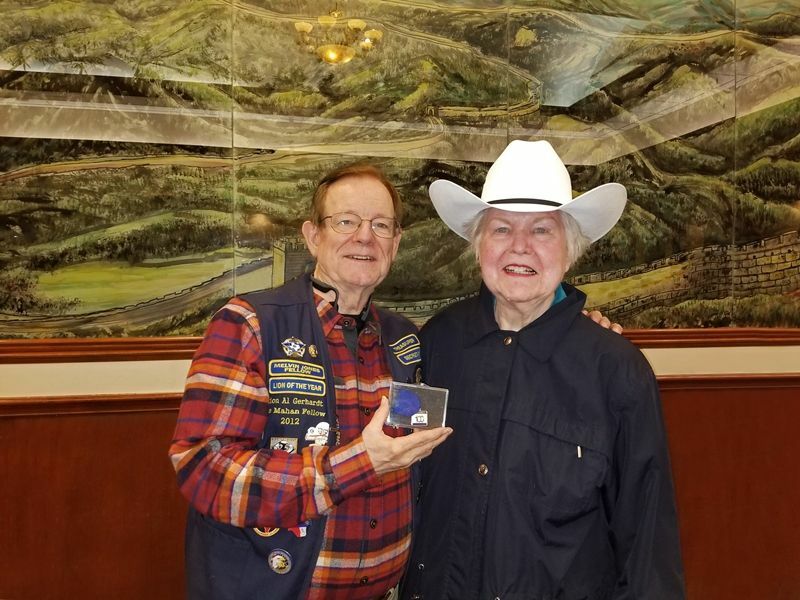 Lion Past District Governor Betty Ezell (District Governor 2017-2018) presented to Tomball Lions Club Lion Treasurer Al Gerhardt the Centennial (1917-2017) Blue Ribbon Award for Excellence for going above and beyond to follow the Lion Motto “WE SERVE” in providing aid to people during Hurricane Harvey. Pictured from left to right are Lion Treasurer Al Gerhardt and Lion Past District Governor Betty Ezell. Lion President Bubba Hardee welcomed guest speaker, Dr. Penner Schraudenbach, Texas Urology Specialists, with offices in Tomball and Willowbrook. 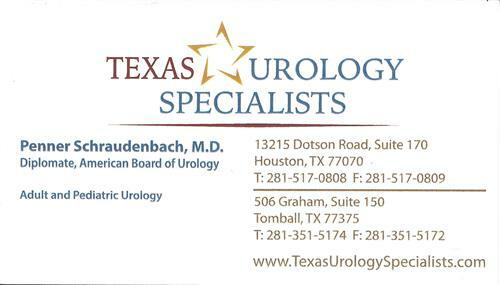 Dr. Schraudenbach is Board certified in urology and specializes in pediatric and adult urology. 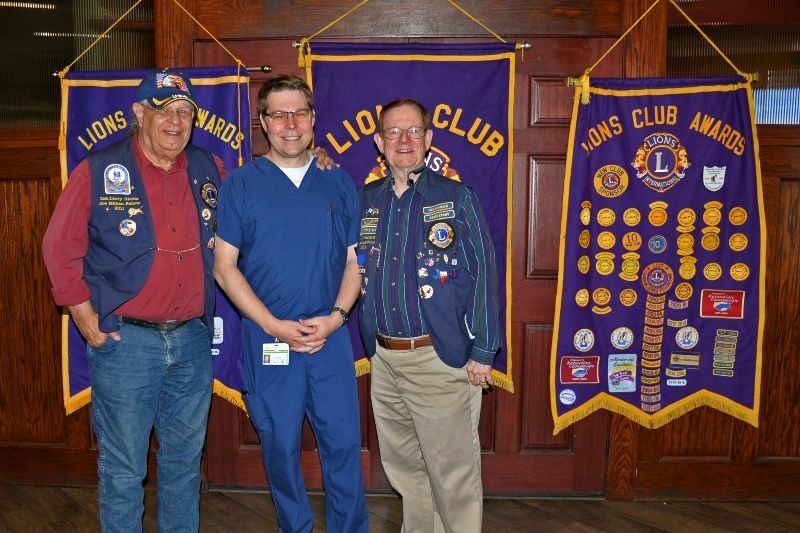 Pictured from left to right are Lion Larry Grotts, Dr. Penner Schraudenbach, and Lion Treasurer Al Gerhardt. Photo provided by Lion Al Gerhardt. 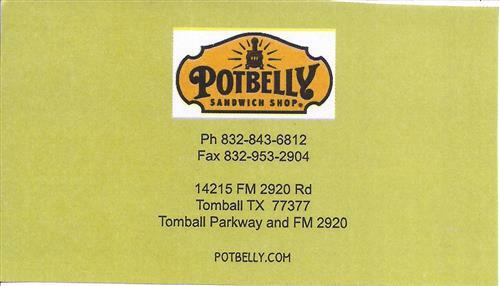 On 3/1/2019, Tomball Mayor Gretchen Fagan gave an update on happenings in the City of Tomball. 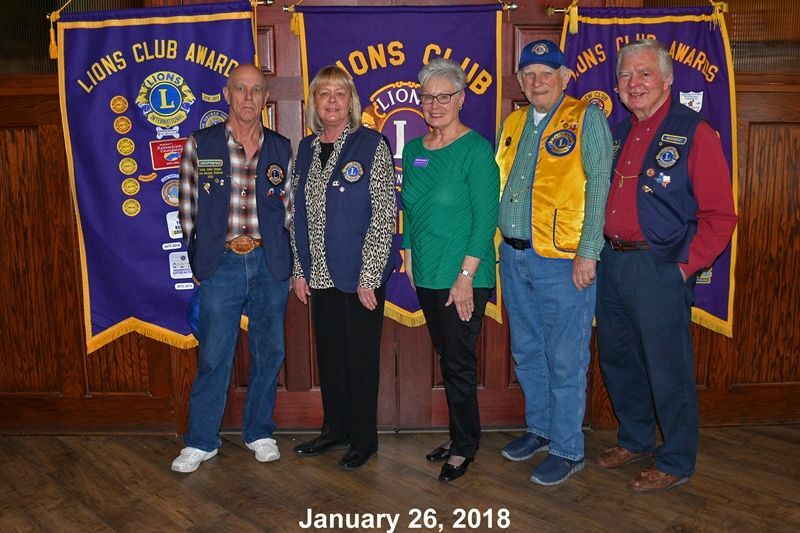 Pictured left to right are: Lion John Phillips, Lion President Bubba Hardee, Tomball Mayor Gretchen Fagan, Lion Karen Halbach, and Lions Past President Bob Ervin. Photo provided by Lion Al Gerhardt. 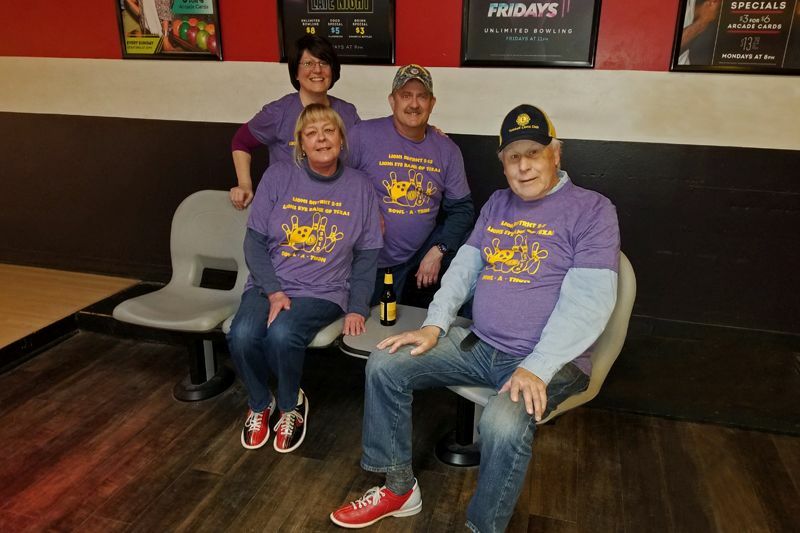 The Tomball Lions Club participated in the Annual 2019 Multi-District 2-S2 Bowl-A-Thon. The Tomball team members were from left to right: Front Row Lion Director Karen Halbach, Lion Director Allen Eckhardt, Back Row Lion Member Tania & Jon Hall. 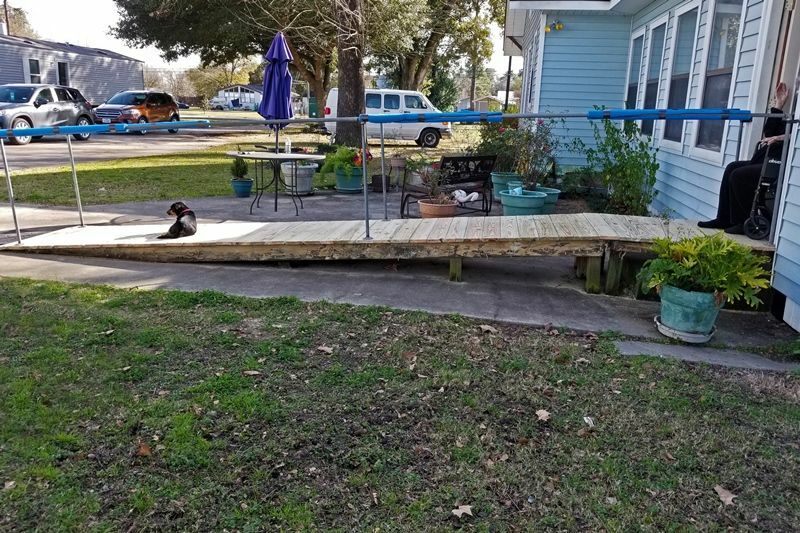 The Tomball Lions Club Board of Directors approved a Handicap Ramp Replacement Project for recipient Ms. Flo Langston (Friend of Lion Treasurer Al Gerhardt) of Tomball, Texas. 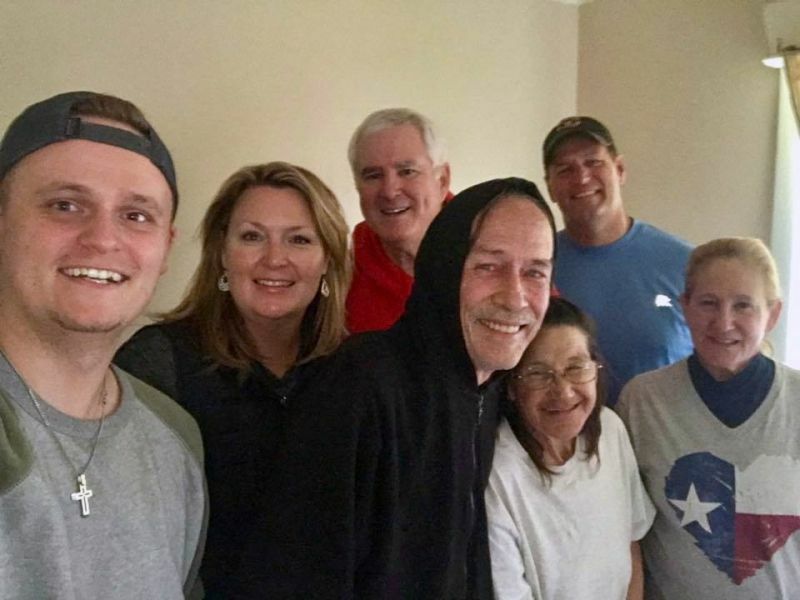 Tomball Lions Club Member Lion Ron Luedke of Luedke Drywall had his crew go out to the residence of Ms. Flo Langston and replaced her existing old handicap ramp with a brand new ramp. The old ramp was very dangerous for Ms. Flo Langston to use. 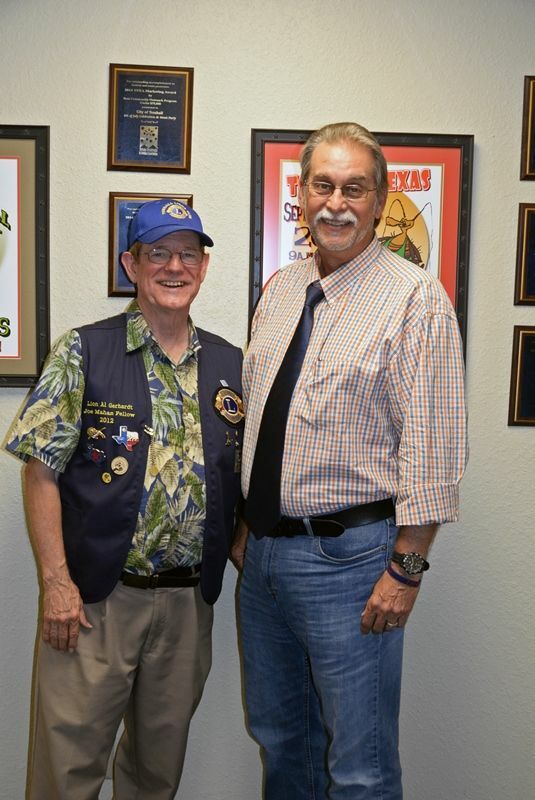 Tomball Lion President Bubba Hardee introduced special guest, Past District Governor Eddie Risha, member of the Conroe Noon Lions Club and MD-2 Committee Chair for the Texas Lions Museum and Office. Pictured from Left to Right are: Lion Director Erin Stapleton, PDG Eddie Risha, Lion HRF Director and wife Diana Risha and Lion President Bubba. Photo provided by Lion Al Gerhardt. 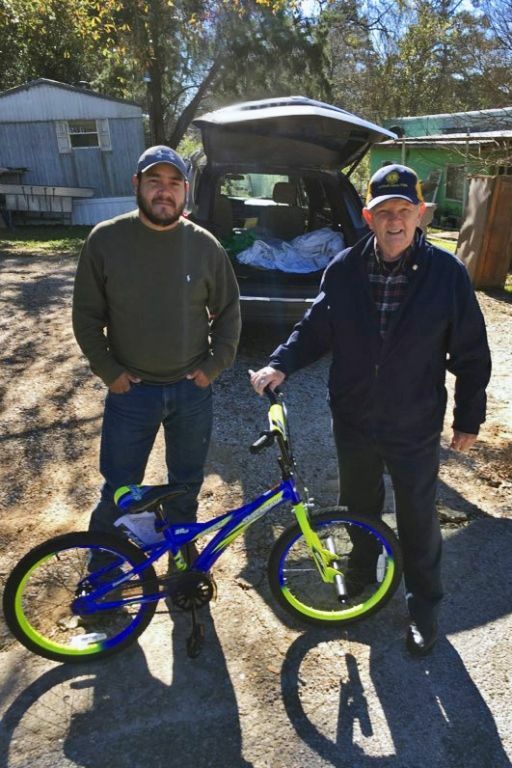 Tomball Lion Vice President Bob Ervin, on behalf of the Tomball Lions Club, presented a bicycle to Jose Diaz Junior, son of Jose and Martha Diaz. 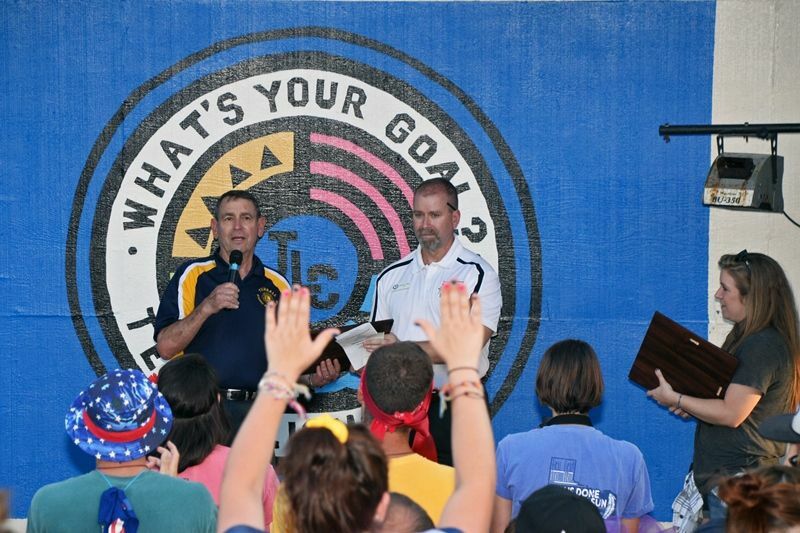 Pictured Left to right are: Father Jose Diaz and Lion Vice President Bob Ervin. Photo provided by Lion Al Gerhardt. Tomball Lion Treasurer Al Gerhardt Presented a Fund Assistance Check to the Tomball – Magnolia – Waller (TOMAGWA) Health Care Ministries. 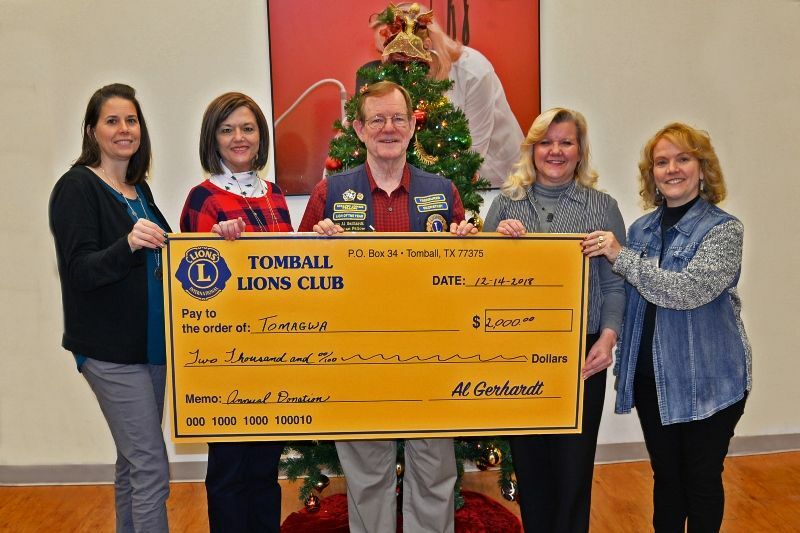 Pictured from left to right are: Senior Analyst Amber Guindon, Grants Manager Ginni Whitten, Tomball Lions Club Treasurer Al Gerhardt, Executive Director Lee Ann Kroon and Development Coordinator Ruth Cotter. Lion Al Gerhardt provided the Web Site with the photo. Lion President Bubba Hardee introduced guest speaker, Leslie Bonnie, Pre-Planning Advisor & Licensed Funeral Director for Dignity Memorial Providers of Houston. 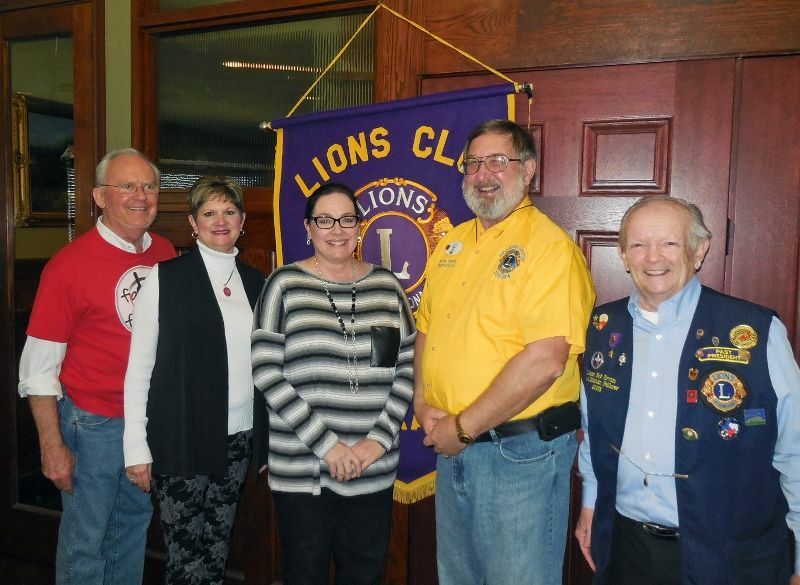 Lions & Guest pictured from left to right are: Lion Director Erin Stapleton, Lion Treasurer Al Gerhardt, Guest Speaker Leslie and President Bubba Hardee. Photos provided by Lion Al Gerhardt. 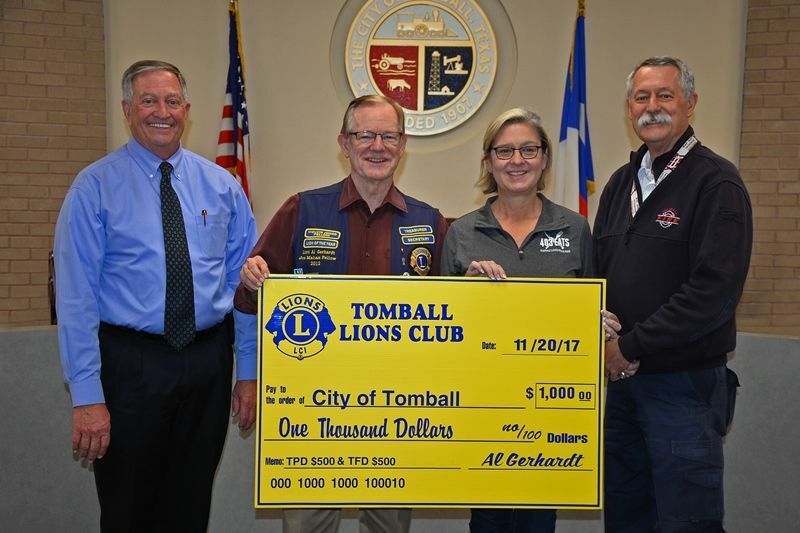 Tomball Lion Treasurer Al Gerhardt Presented a Fund Assistance Check to the City of Tomball Police & Fire Department for Christmas Aid in the Tomball Community. 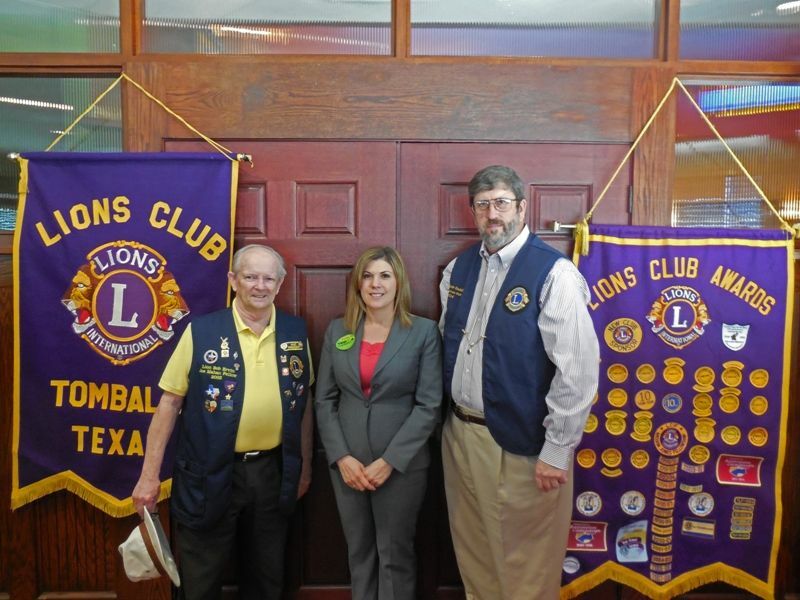 Pictured from left to right to right are: Tomball Mayor Gretchen Fagan and Tomball Lion Treasurer Al Gerhardt. Photo provided by Lion Al Gerhardt. 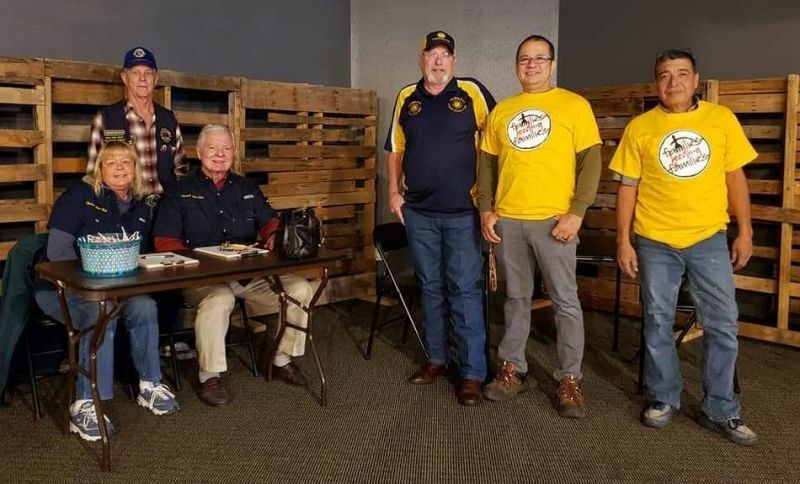 The Tomball Lions Club was at the Families Feeding Families event on November 21, 2018 performing vision screening for children. 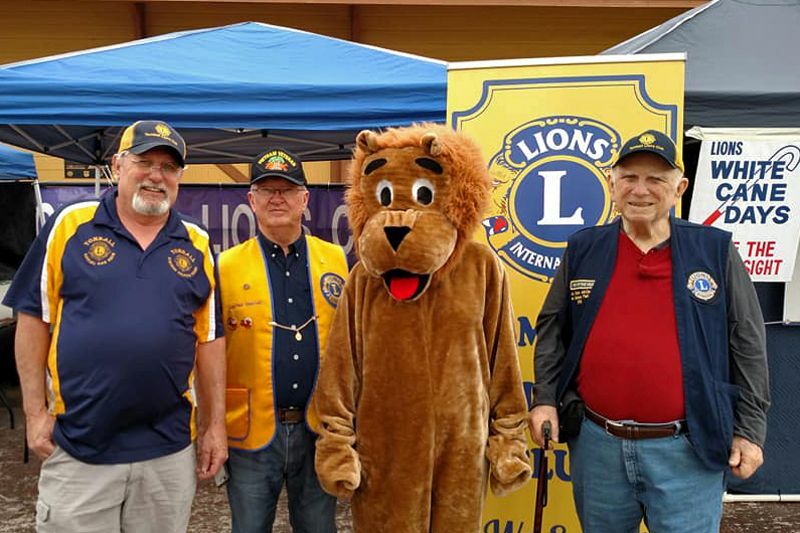 The Tomball Lions Club members doing the screening shown above are from left to right: Lions Karen Halbach, John Seber, Mike Halbach, Bubba Hardee and two volunteers. 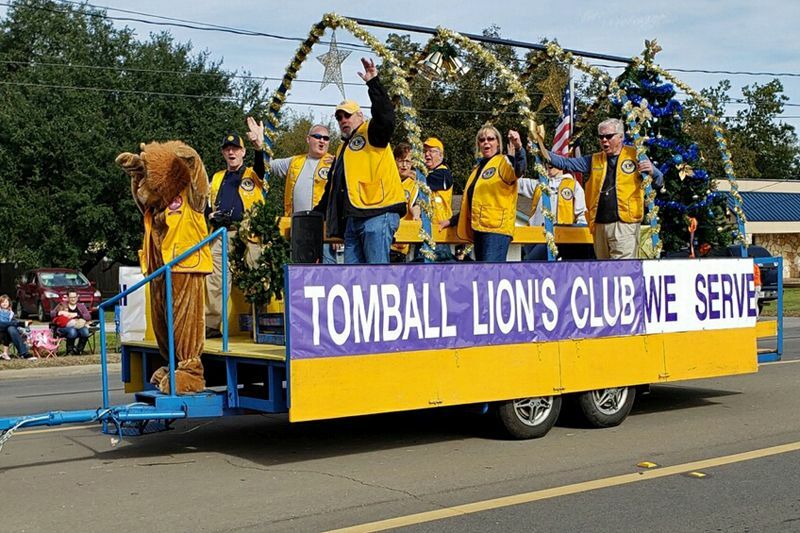 The Tomball Lions Club participating in the 2018 Tomball Chamber Holiday Parade. Our lions club had another successful club event. We were blessed to have 12 Lions help decorate the Dist. 2-S2 Lion Float for the Chamber Parade. Pictured above from left to right are: Lion Mascot Haley Straub, Lions Al Gerhardt, Erin Stapleton, Bubba Hardee, Eva Gerhardt, Jerome Teichmiller, Karen Halbach, Beth Straub and Mike Halbach. Photo taken by Rotarian Camille Hamilton. 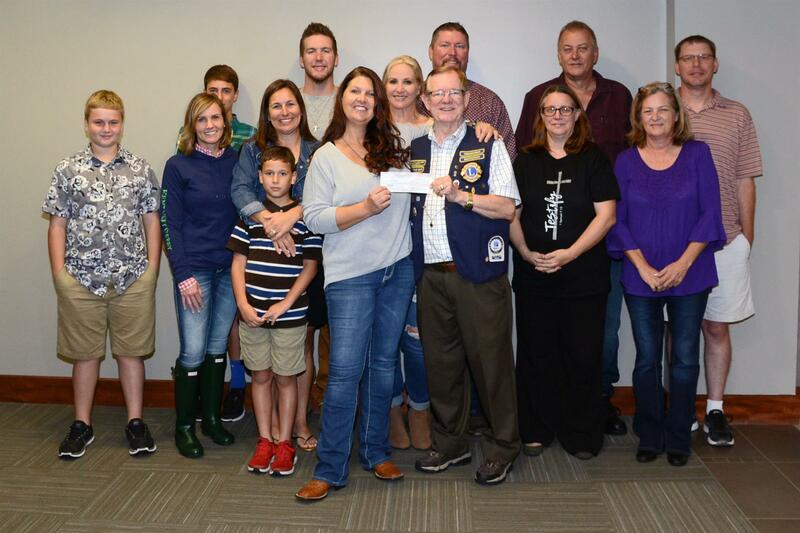 The Tomball Lions Club with funding provided by the Lions of Texas Lion International Foundation provided bedding for the Horton family who survived Hurrican Harvey. Pictured from left to right are: George Holleway, Lauri Holleway, Chris Reynolds, Mr. & Mrs Horton, Trey Holleway and Kathy Terry. Lion President Bubba Hardee introduced guest speaker Maria Ines Flores. She is a past gymnast who trained at the Bela Karolyi Gym near Huntsville, TX (1983-1985) with Mary Lou Retton. 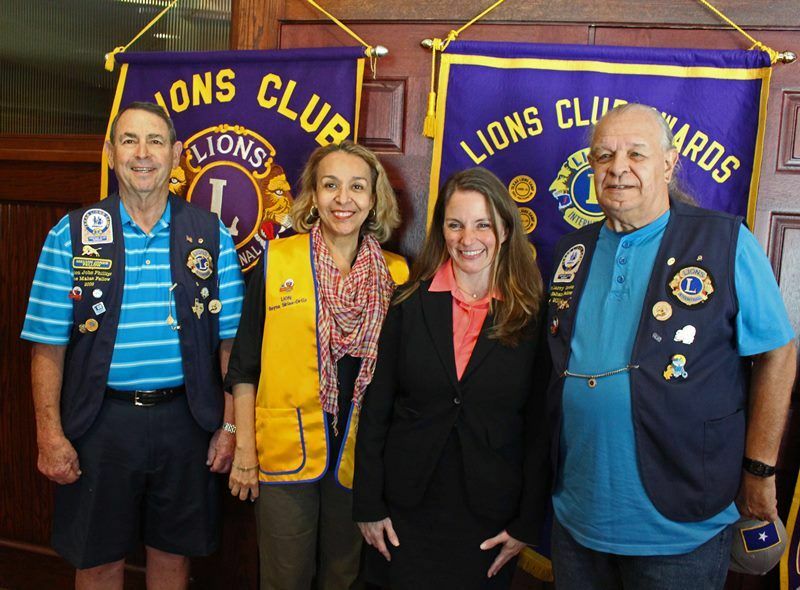 Lions & Guest pictured left-right are: Lion President Bubba Hardee, Special Speaker Maria Ines Flores, Maria assistant Karina Eisner and New Lion Member Erin Stapleton. 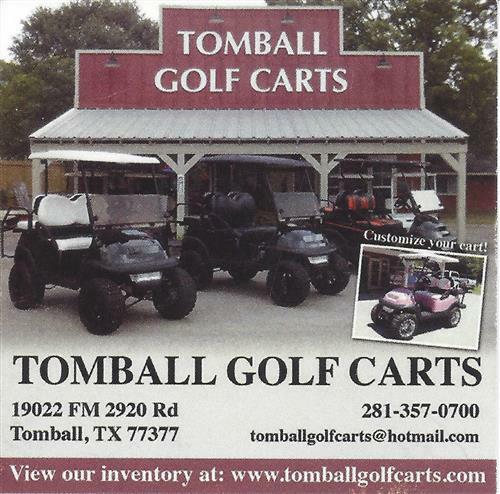 The Tomball Lions Club Hosted the very successful 2018 Golf Tournament on October 18, 2018 at High Meadow Ranch Golf Course in Magnolia. We had 17 teams and 75 sponsors signed to help raise funds for the tournament. The Lions Banner photo pictured from left-right are: Lions Erin Stapleton, Jerome Teichmiller, Mike Halbach, Bob Ervin, Bubba Hardee, Karen Halbach, Ron Luedke, and Larry Grotts. Lions Major Sponsor photo pictured left-right, Lions Larry Grotts, Jerome Teichmiller, Bob Ervin, Bubba Hardee, Erin Stapleton and Mike Halbach. Lion Al Gerhardt provided the Web Site with the photo. 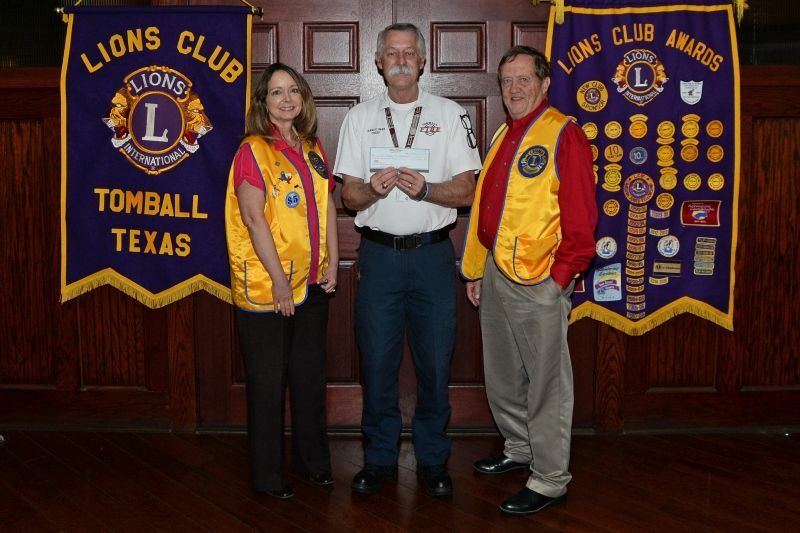 Lion President Bubba Hardee presented guest speaker Camille Hamilton with a $500 donation from the Tomball Lions Club to help fund the Families Feeding Families event on November 21. 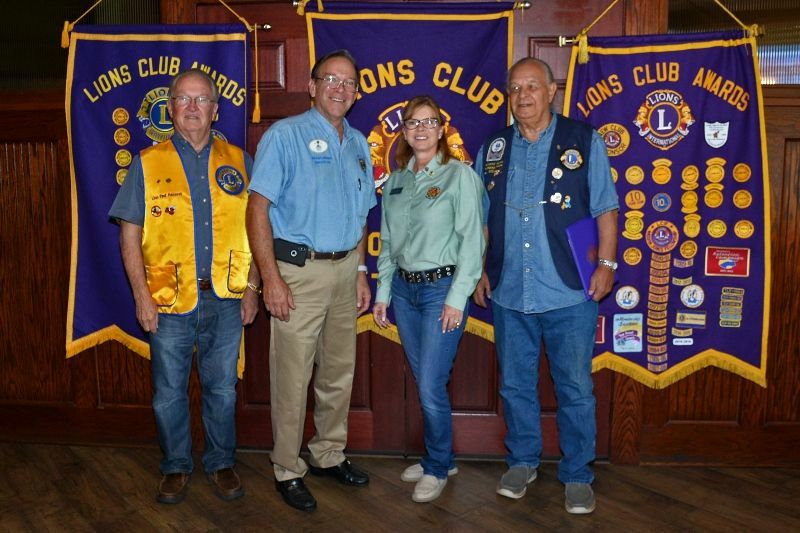 Lions and Guests pictured left-righ are: Lion Treasurer Al Gerhardt, Families Feed Families Speaker Camille Hamilton and Lion President Bubba Hardee. First Vice District Governor Tony Austin messaged that “changes are coming to 2-S2” as he introduced Speaker District Governor Karl Johnson. 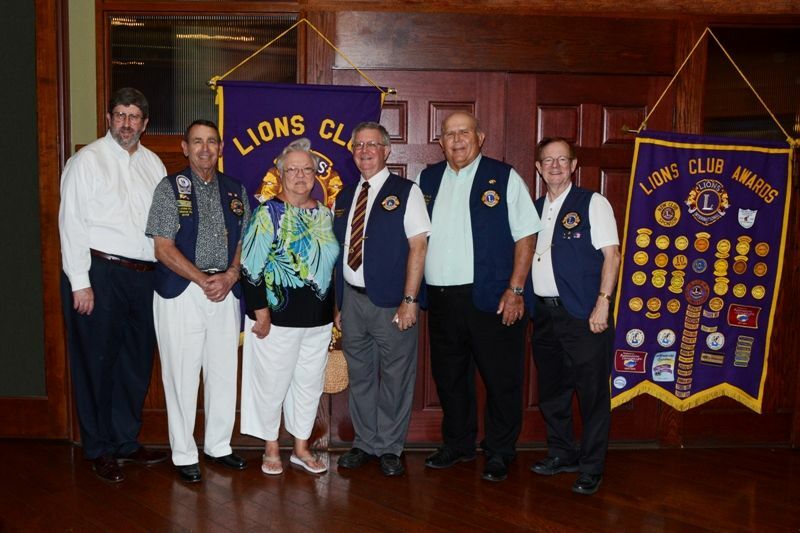 Lions and Guests pictured left to right are: Lion Member Erin Stapleton, District Governor Karl Johnson and First Vice District Governor Tony Austin. Photo provided by Lion Al Gerhardt. 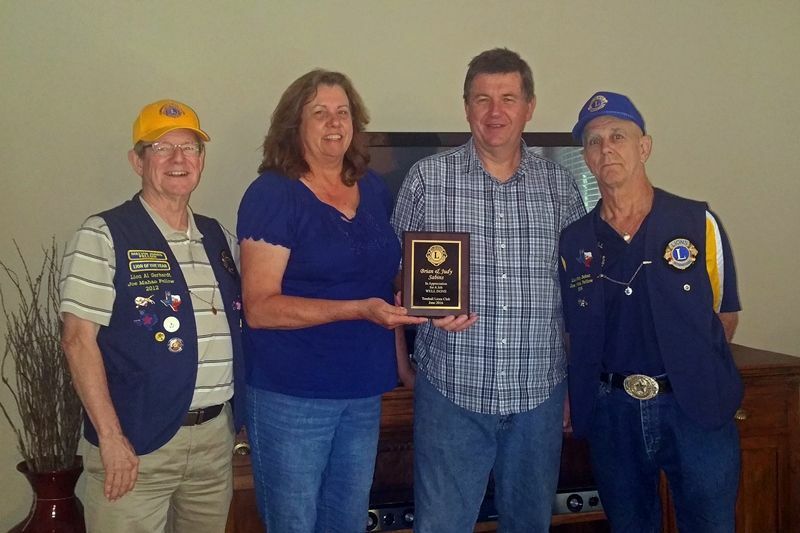 Texas Lions District 2-S2 and the Tomball Lions Club presented two Memorials to Larry Grotts and family respectively known as “Lion Joan Phillips-Grotts”. 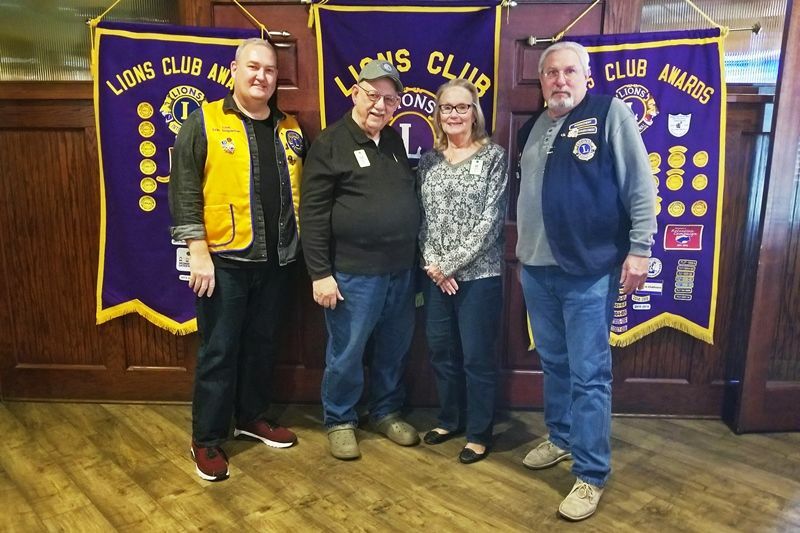 Pictured Left to Right are: Lion Treasurer Al Gerhardt, Lion Larry Grotts, Husband of Joan Phillips-Grotts and Lions President Bubba Hardee. Lion 1st Vice-President Bob Ervin introduced guest speaker Lion Lisa Free-Martin -- Zone Chair E2, District 2-S2 Lions Camp Director & current Magnolia Lions Club Treasurer. Lions and Guests pictured left to right are: Lion Director Paul Hancock, District 2-S2 Governor Karl Johnson, Lisa Free-Martin, District 2-S2 Zone Chair E2 - District 2-S2 Lions Camp Director & current Magnolia Lions Club Treasurer, and Lion Larry Grotts. Photo provided by Lion Al Gerhardt. 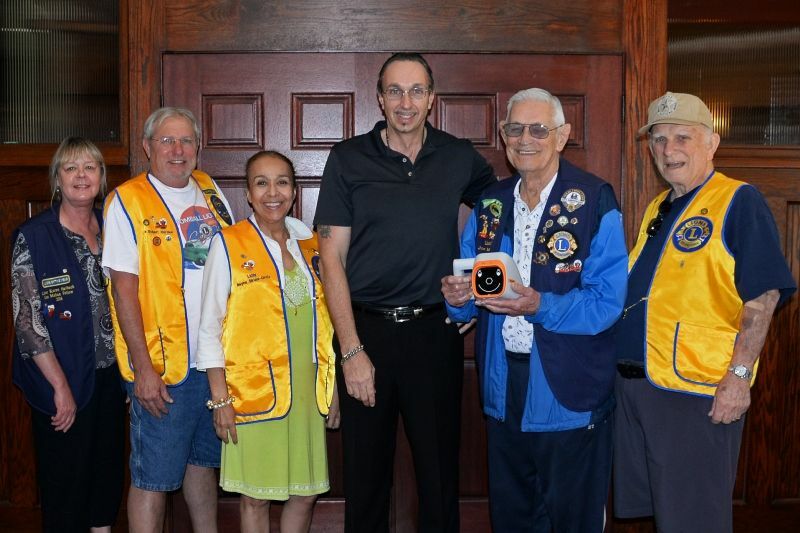 Lion 1st Vice President Bob Ervin presented to Lion Past President and Director, Lion Jerome Teichmiller, a plaque commemorating his 45 years of Lionism. 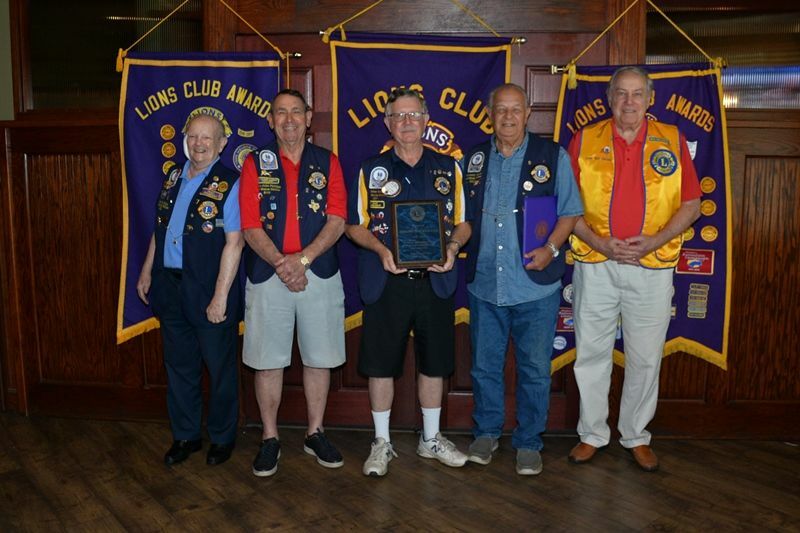 Lions pictured left to right are: Lion 1st Vice President Bob Ervin, Lion John Phillips, Lion Past President and Director Lion Jerome Teichmiller – 45 Year Award Recipient, Lion Larry Grotts, and Lion Bill Dillon. Photo provided by Lion Al Gerhardt. Tomball Lion Treasurer Al Gerhardt Presented a Fund Assistance Check to the Tomball Lone Star College. 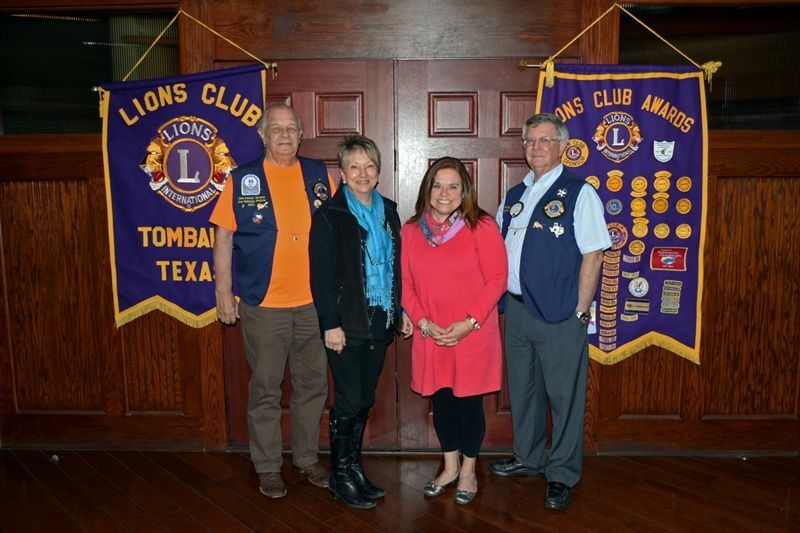 Pictured Left to right, Tomball Professor Ms. Robinson Gautier, LSC Foundation, Lion Reyna L. Sirias-Ortiz, Lone Star College (LSC) – Dr. Lee Ann Nutt, LSC-Tomball President and Lion Treasurer, Al Gerhardt. Photo provided by Lion Al Gerhardt. step up to provide all of the bedding for the same 200 plus families. 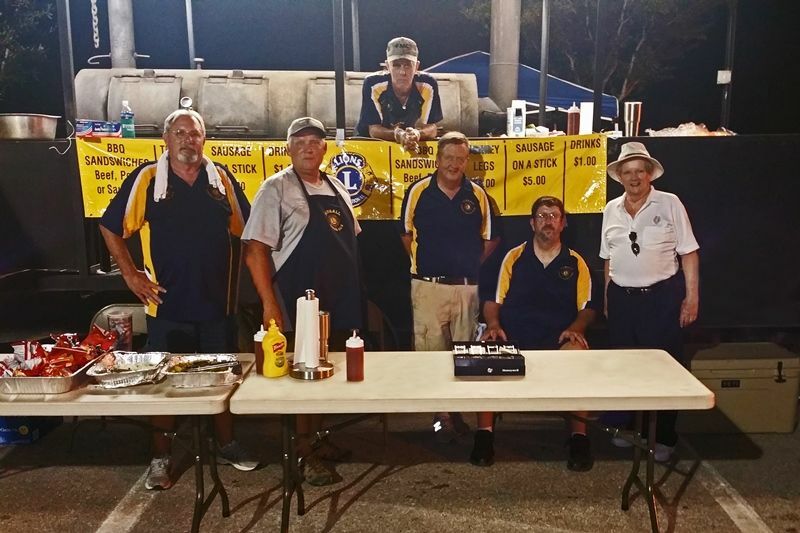 Pictured above from left to right are: Lion President Bubba Hardee and Lion Treasurer Al Gerhardt with several volunteers in the background. Lion President Hardee introduced special guest speaker, Lee Ann Kroon, Executive Director of TOMAGWA HealthCare Ministries. Lions & Guest pictured left-right are: Lion President Bubba Hardee, Lee Ann Kroon, Executive Director of TOMAGWA HealthCare Ministries and Lion Allen Eckhardt. 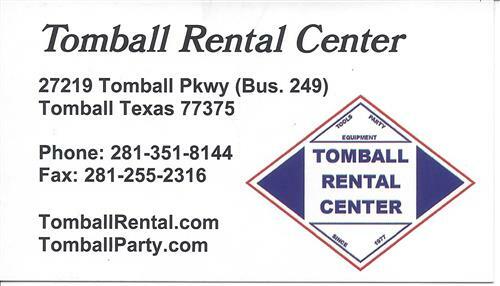 The Tomball Lions Club was blessed to be a part of Tomball Night on August 03, 2018 located at the Railroad Depot in Tomball Texas on August 03, 2018. 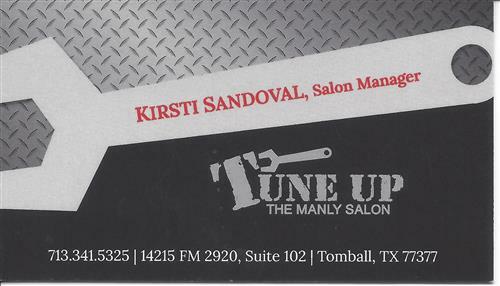 There were many Tomball Lions and their wives present to participate in working this annual fund raiser for the club. We were serving BBQ Sandwiches, Sausage on a Stick and Turkey Legs. We would really like to thank all of those who came to help support us. 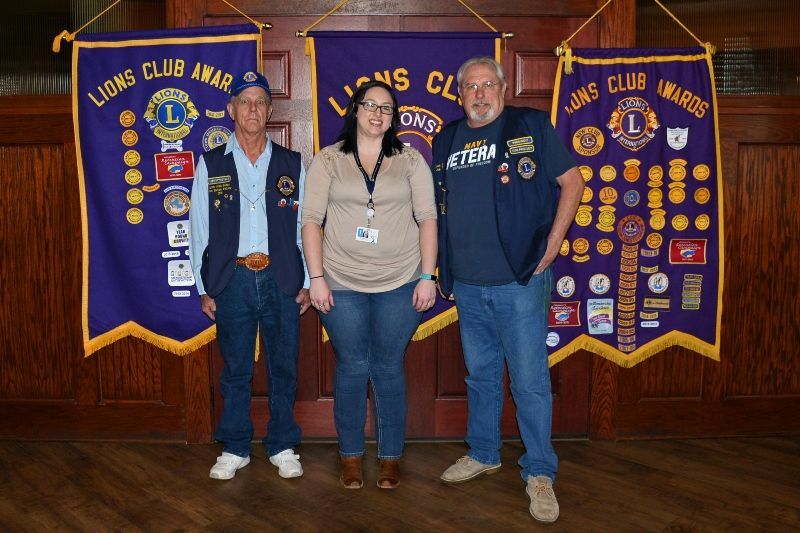 Lion President Bubba Hardee introduced guest speaker Ms. Idalia Avezuela, MS-LS, Assistant Branch Manager for Adult Services at Lone Star College – Tomball Community Library. 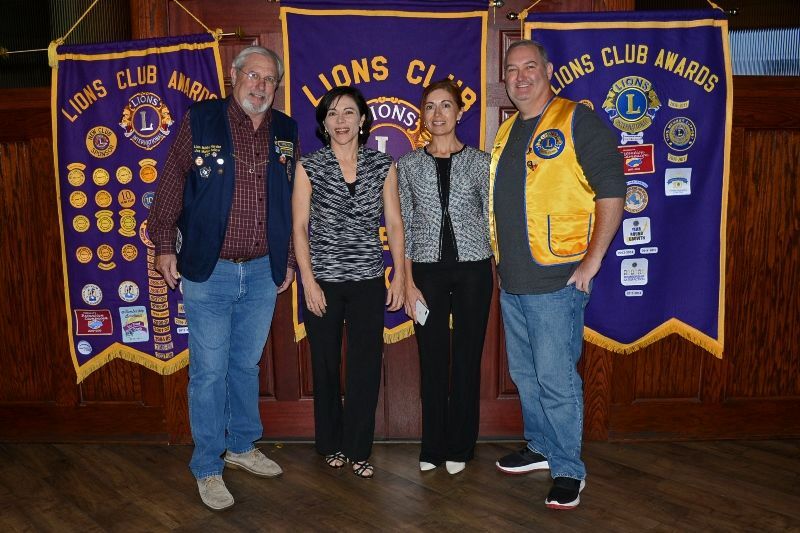 Lions & guest pictured left-right are: Lion Director Karen Halbach, Ms. Idalia Avezuela and Lion Bruce Smith. Photo provided by Lion Al Gerhardt. 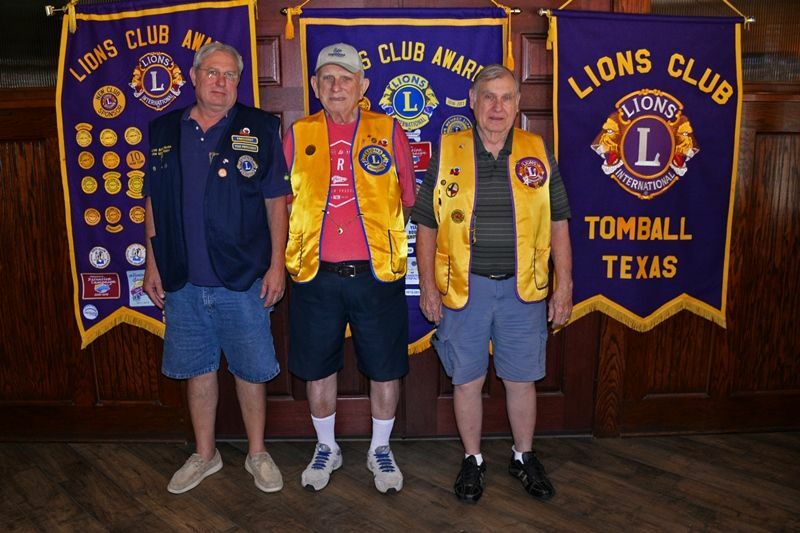 Texas Lions District 2-S2 and the Tomball Lions Club presented two Memorials to Mark Paulson and the family of Albert David Paulson respectively known as “Lion David Paulson”. 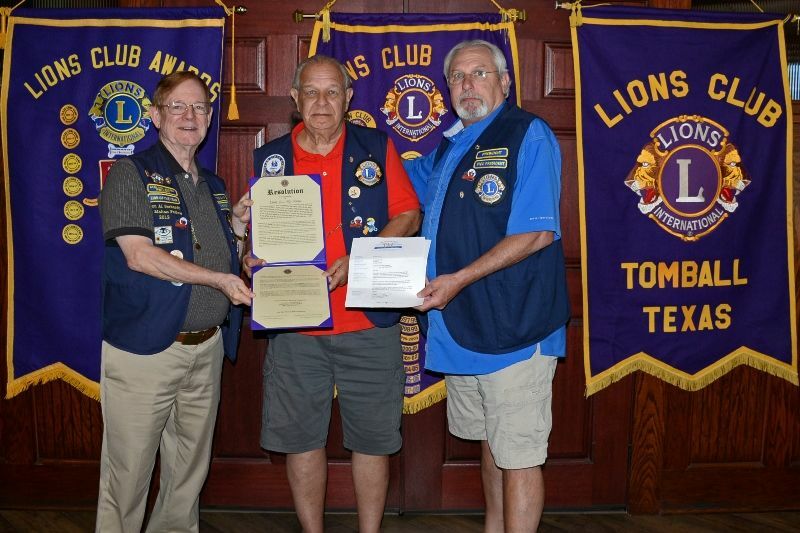 The Texas Lions District 2-S2 presented a special Resolution in Loving Memory of “Lion Albert David Paulson”. 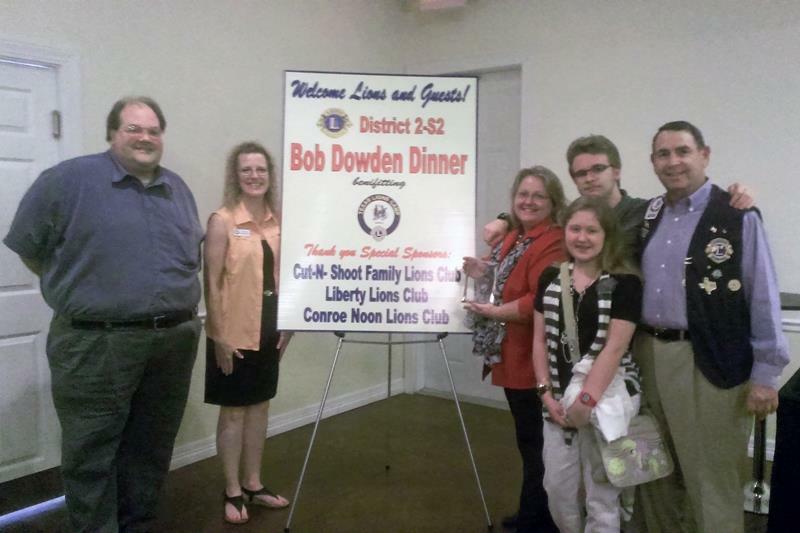 The Tomball Lions Club of District 2-S2 presented a special Texas Lions Camp “Endowment Brick” in memory of Lion Albert David Paulson. There will be a “Commemorative copy of the Memory Brick giving to Mark Paulson, son of David Paulson. Lion President Hardee introduced special guest speaker, Judge Laryssa Korduba, Justice of the Peace for Harris County Precinct 4, Position 2. Judge Korduba was accompanied by her Chief Clerk, Ms. Tracy Hobson. 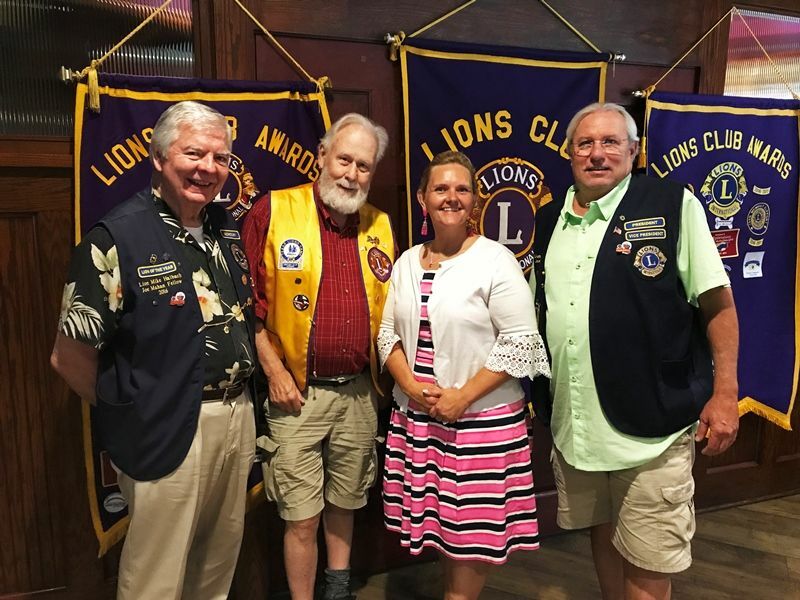 Lions & Guest pictured left to right are: Lion Secretary Mike Halbach, Lion Director Allen Eckhardt, Judge Laryssa Korduba, and President Bubba Hardee. The Texas Lions Camp held the Awards Week from 06/18/18 – 06/22/18 for Scholarship Awards. The Tomball Lions Club presented three $1,000 Scholarships to the Camp Counselors Recipients. The photo shows the recipients. 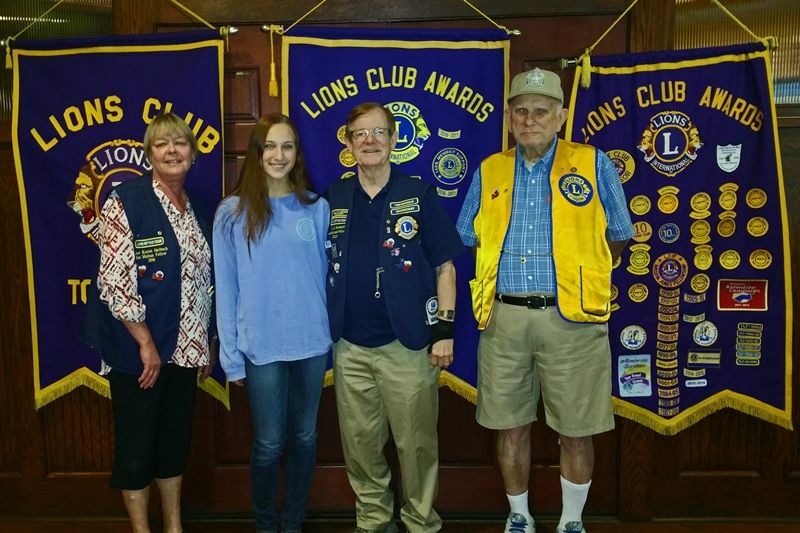 Left to Right are: Shelby Dearbonne, Gabrielle Luper, Tomball Lions Club Treasurer Al Gerhardt, and Savanna Ramsey. 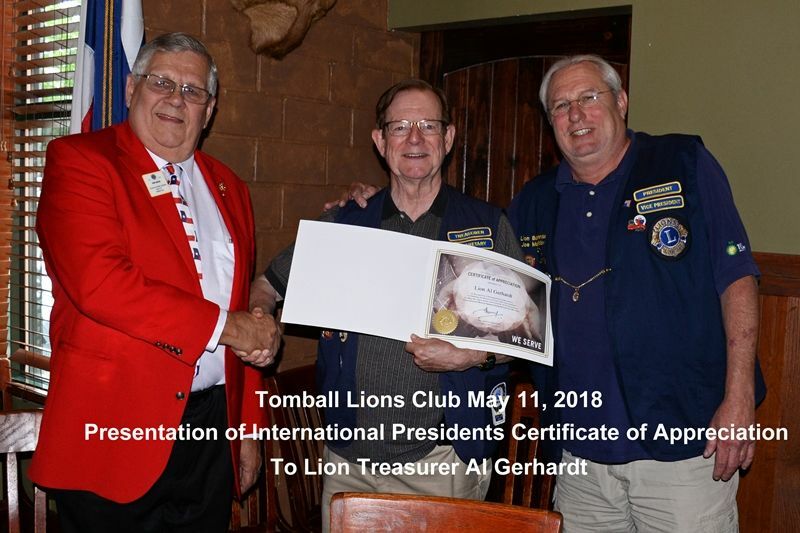 The Tomball Lions Club presenter was Lion Al Gerhardt. 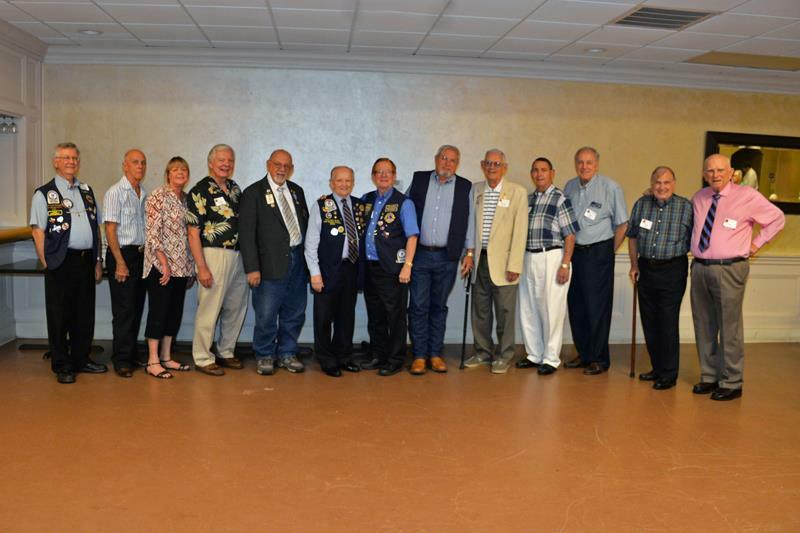 The Tomball Lions Club Annual Officer Installation Banquet was held on June 13, 2018 at Valley Ranch Grill & Barbecue. 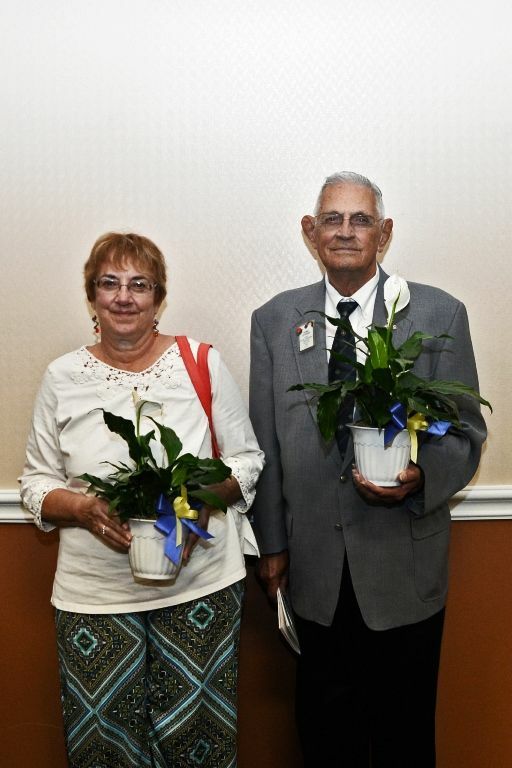 Past District Governor Eddie Risha and his wife Diana were in attendance to do the Installation of Officers, Directors and New Members and special awards. Lion Dale McCarty received the prestigious Lion of Year Award for 2017-2018. In addition he received the Tomball Lions Club coveted Joe Mahan Blue Vest which was named after the founder of our club. 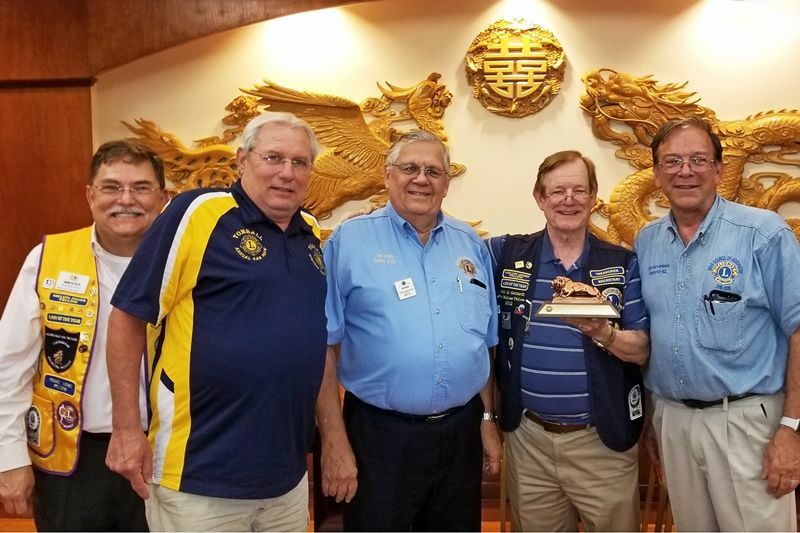 At the 2017 / 2018 Multi-District 2-S2 Presidents & Secretary Meeting, Past District Governor Mark Roth presented the Multi-District 2-S2 Lion of the Year Award to Tomball Lions Club Treasurer Al Gerhardt. 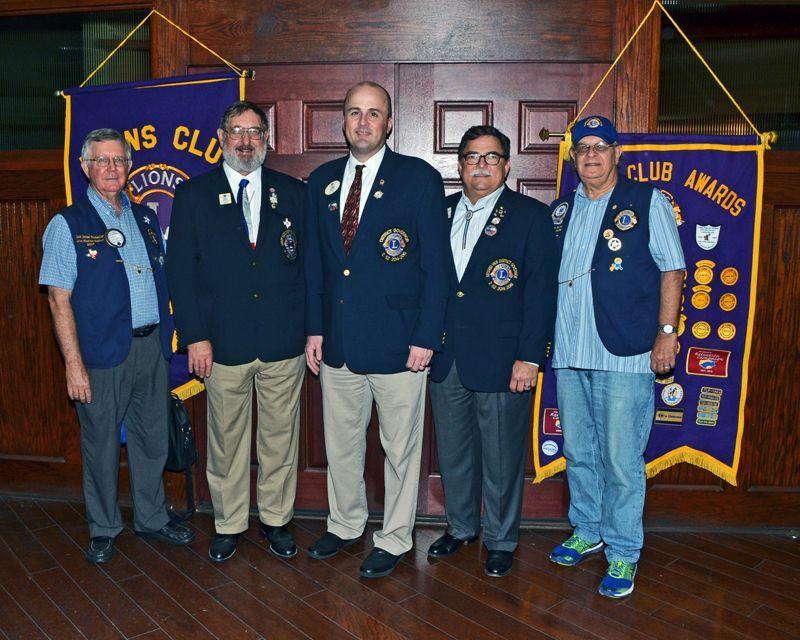 Pictured above from left to right are: Past District Governor Mark Roth, Tomball Lions Club President Bubba Hardee, First Vice District Governor Elect Tony Austin, Tomball Lions Club Treasurer Al Gerhardt and District Governor Elect Karl Johnson. Lion President Hardee introduced guest speaker Bruce Hillegeist, President of the Greater Tomball Area Chamber of Commerce who provided a very interesting update on residential, commercial, and mobility growth and positive changes in and around the Tomball community. 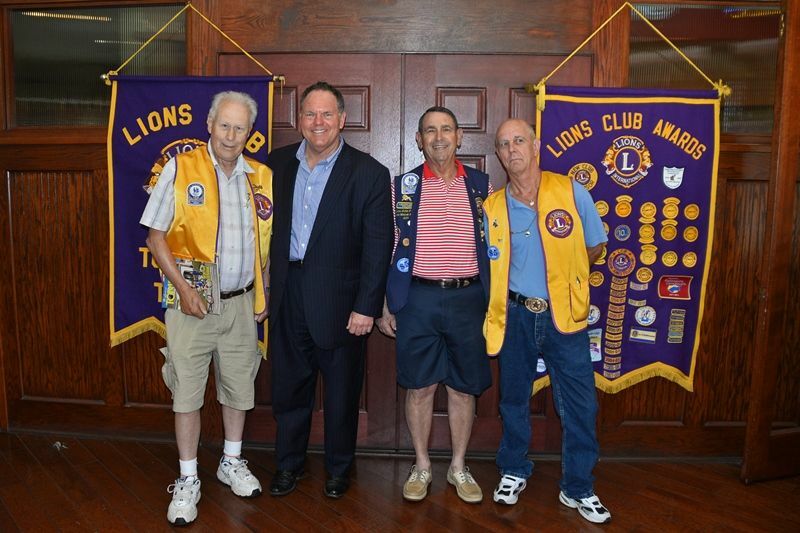 Lions & guest pictured from left to right are: Lion Tail Twister John Phillips, Chamber President Bruce Hillegeist, President Bubba Hardee and Past President Bob. Photo provided by Lion Al Gerhardt. 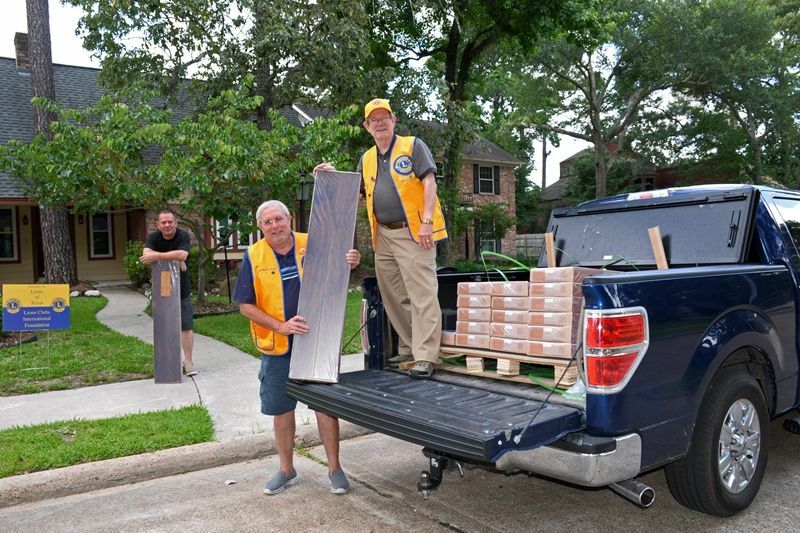 The Tomball Lions Club in conjunction with Texas Lions Multi-District 2-S2 Disaster funding provided flooring to families for Hurricane Harvey Relief. The Distribution of flooring will be done by the Tomball Lions Club and Heart for Texas volunteers. 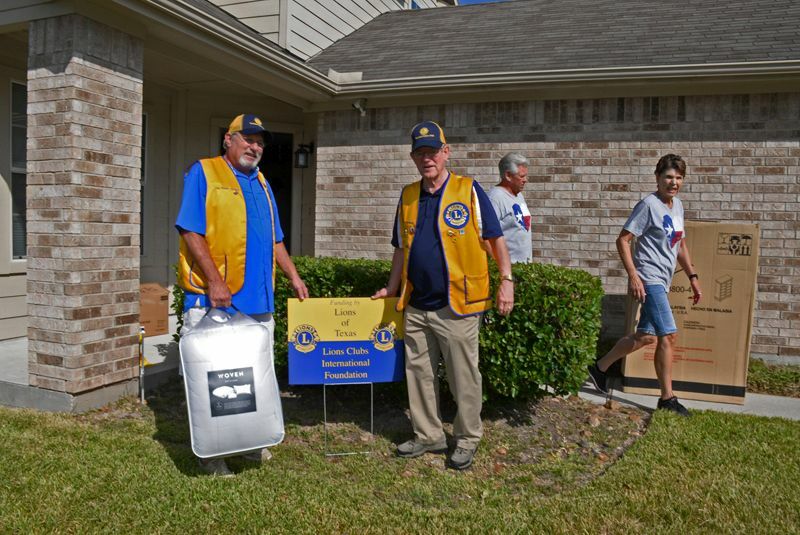 Pictured Left to Right are: Home owner Milton Stewart, Tomball Lions Club President Bubba Hardee and Treasurer Al Gerhardt. Eva Gerhardt is taking the photo. The Tomball Lions Club in conjunction with Texas Lions Multi-District 2-S2, Houston Cy-Fair and Huntsville Lions Clubs and Other Lions Supporters providing bedding for 200 families for Hurricane Harvey Relief. The Distribution of bedding will be done by the Tomball Lions Club and Heart for Texas volunteers. This is the bedding that has been provided to families provided by MD-2S2 and the Tomball and other Lions Clubs. Shown above from Left to Right are: Heart for Texas volunteers Christy Lieder, Laurie Holleway and Tomball Lions Club Treasurer Al Gerhardt. 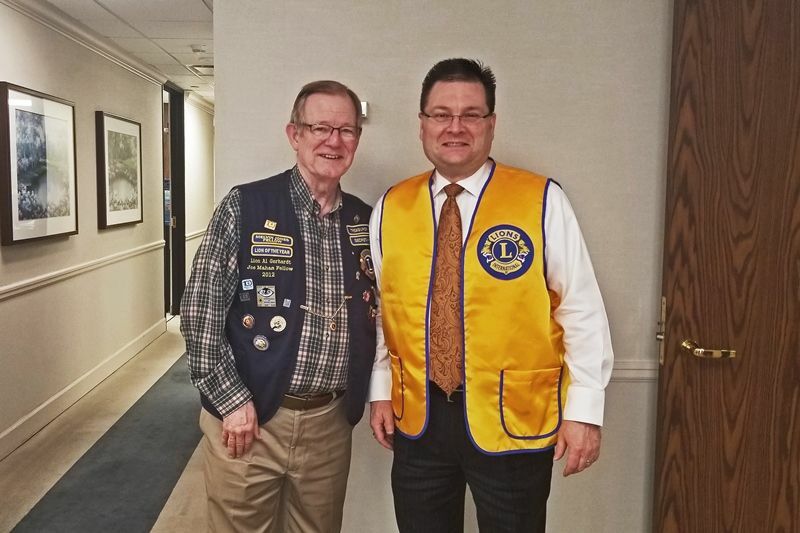 Lion President Bubba Hardee welcomed visiting Lions 2nd Vice District Governor Tony Austin. 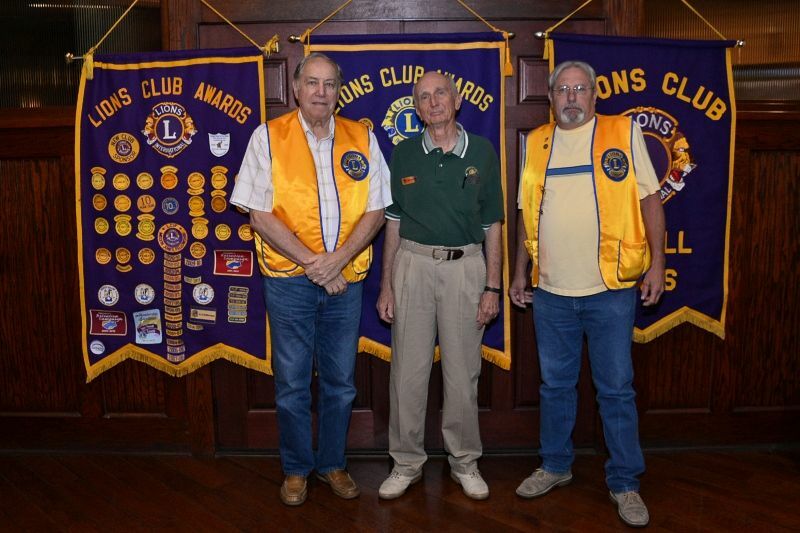 Lions & guest pictured from left to right are: Lions 2nd Vice District Governor Tony Austin, Lion Treasurer Al Gerhardt and Lion President Bubba Hardee. Photo provided by Lion Al Gerhardt. Lion President Bubba Hardee welcomed District 2-S2 Camp Director Lisa Free-Martin and her husband Lion Bob Martin. 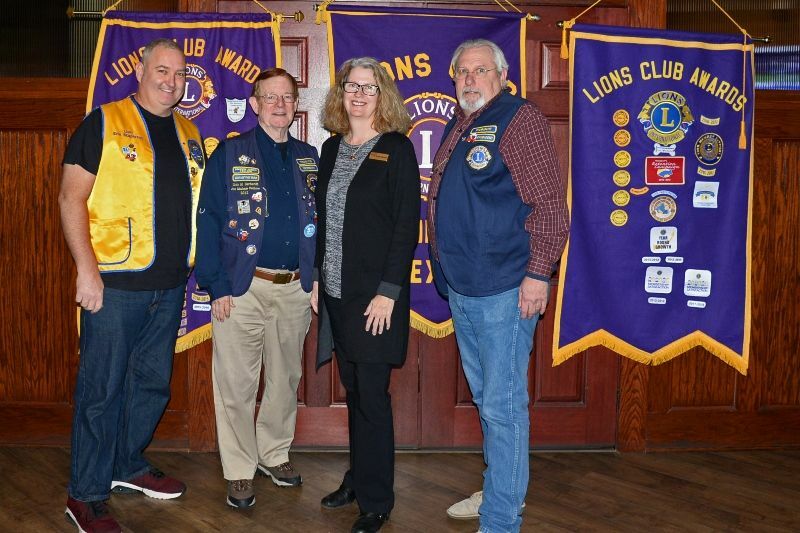 Lions & guest pictured from left to right are: Lion 2nd Vice President Reyna Sirias-Ortiz, District 2-S2 Camp Director Lisa Free-Martin, Lions 2nd Vice District Governor Tony Austin and Lion Treasurer Al Gerhardt. Photo provided by Lion Al Gerhardt. 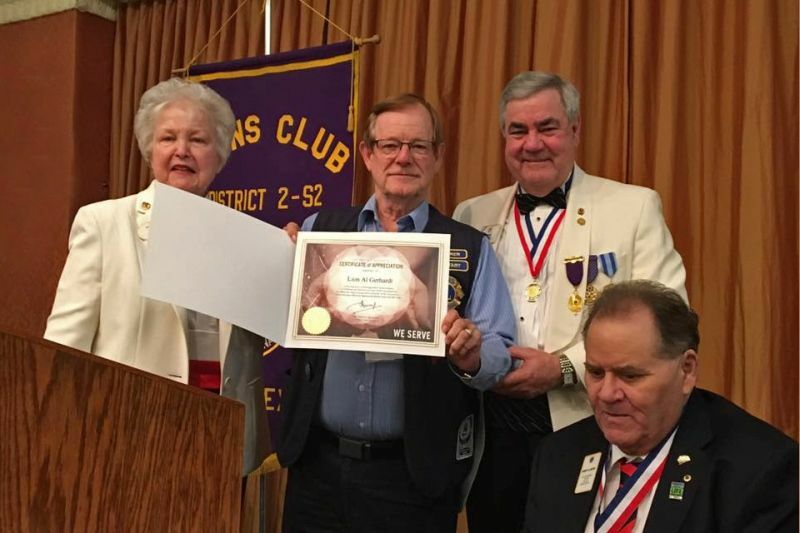 Our own Lion Treasurer Al Gerhardt was presented with the International President's Certificate of Appreciation award on Saturday evening, May 5th, at the District 2-S2 Convention Governor's Banquet at the Houston Hilton North Hotel. In the photo District Governor Betty Ezell and International Director Sam Lindsey are shown presenting the award to Lion Al. 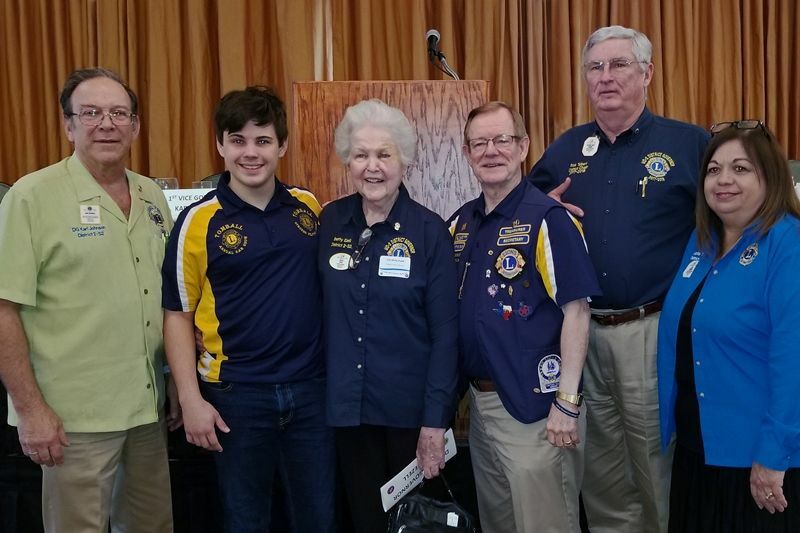 Shown above from Left to right are: District Governor Betty Ezell, Tomball Lions Club Treasurer Al Gerhardt, Lions International Director Sam Lindsey and PDG Ron Landers. 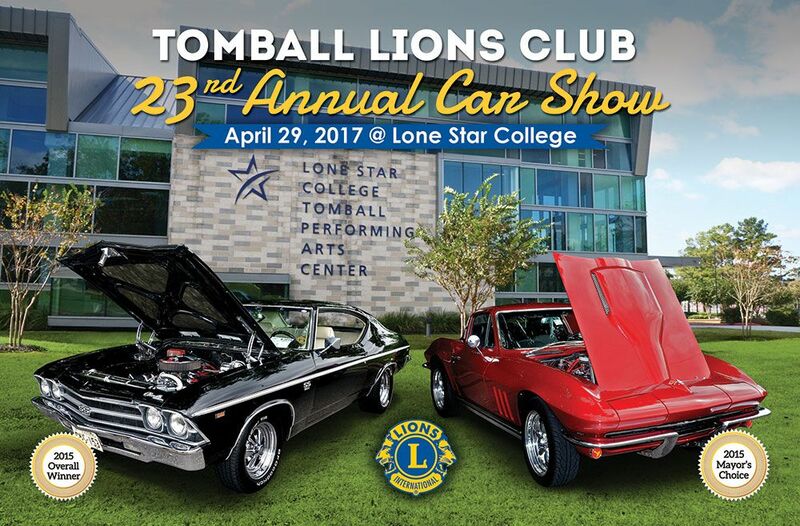 The Tomball Lions Club had their 24th Annual Car Show on Saturday, April 28th, at Lone Star College - Tomball Campus. A total of 155 vehicles were entered. In addition to the Chairman's Award, 32 additional trophies were awarded to the entrants. Contributing to the net proceeds were the vehicle entry fees, 45 individual and corporate sponsorships, BBQ pit sales, and visitor parking donations. 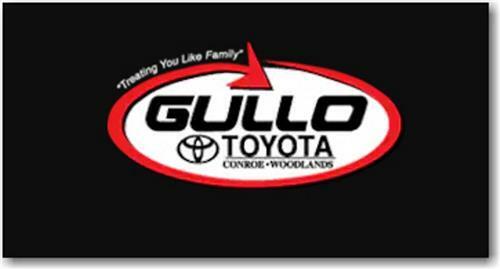 Major auto dealer sponsors display new vehicles in a special area between visitor parking and the Show vehicles. 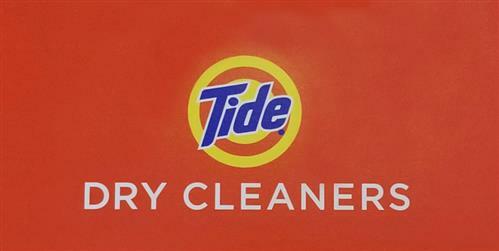 This is one of the Club's two major fund raisers each year." 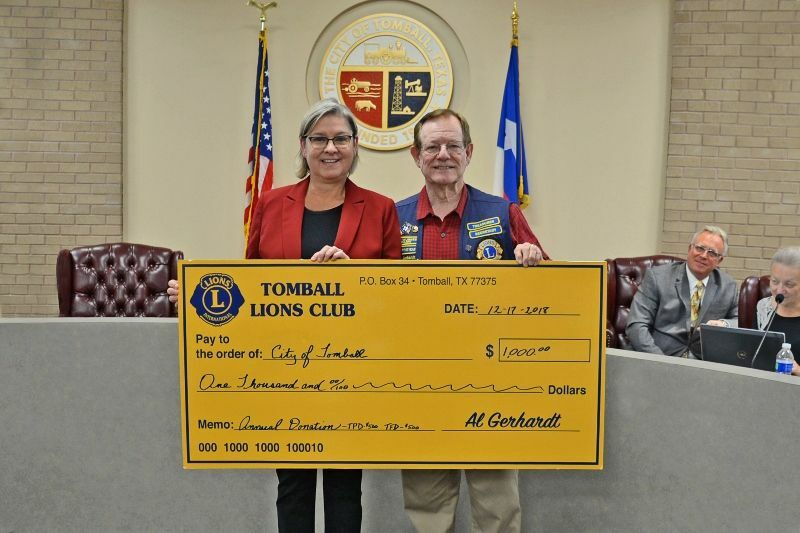 We were able to raise a little over $12,500 to help the Tomball Communities and other Tomball Lions Club charities. Lion Al Gerhardt introduced guest speaker, entrepreneur, Texas historian, and restaurateur Charlie Fogarty. 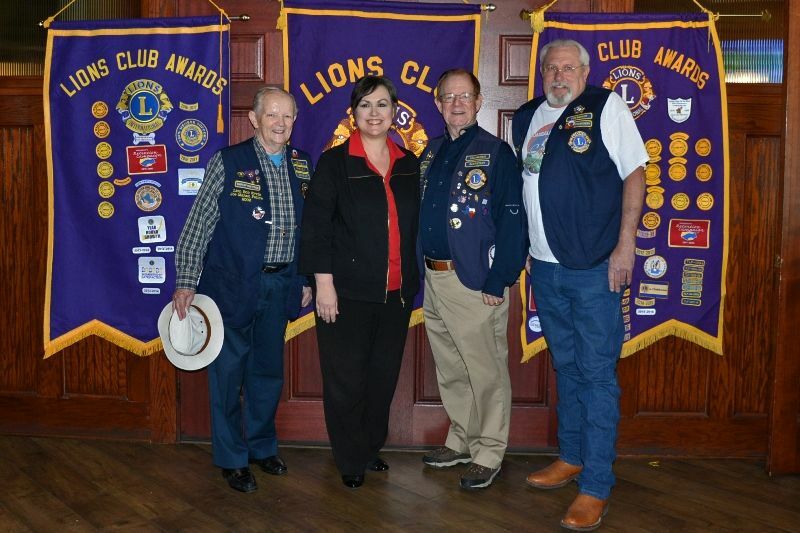 Lions & guest pictured from left to right are: Lion Vice President Reyna Siras, Texas historian, and restaurateur Charlie Fogarty, Lion Past President Tim Fowler and Lion John Phillips. Photo provided by Lion Al Gerhardt. Lion President Bubba Hardee introduced guest speaker Randy Parr, Tomball Fire Chief. 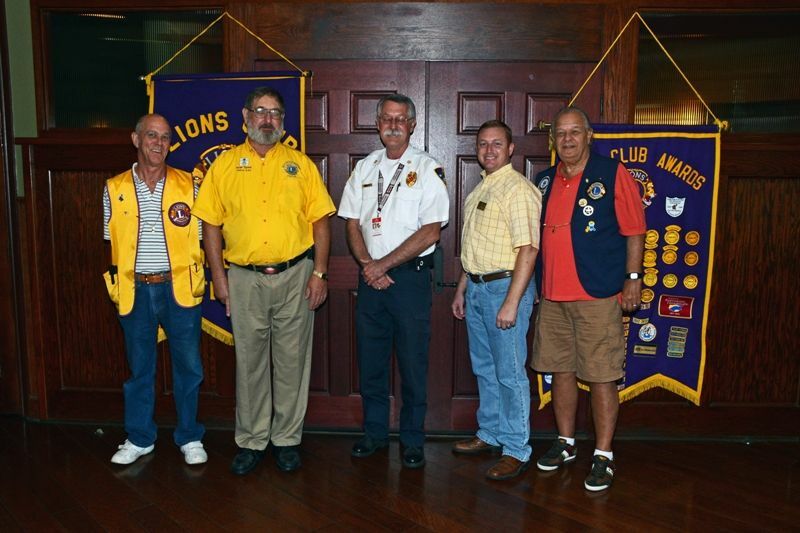 Lions & guest pictured left-right are: Lion John Phillips, Fire Chief Randy Parr, Lion George Shackelford (Retired Tomball City Manager) and Lion Allen Eckhardt. Photo provided by Lion Al Gerhardt. 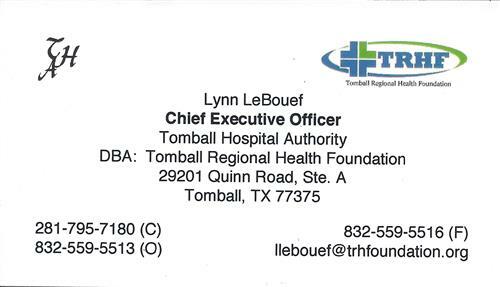 Lion President Bubba Hardee introduced guest speaker Cathy Pool, MSN, RN – Director of Health Services for the Tomball Independent School District. 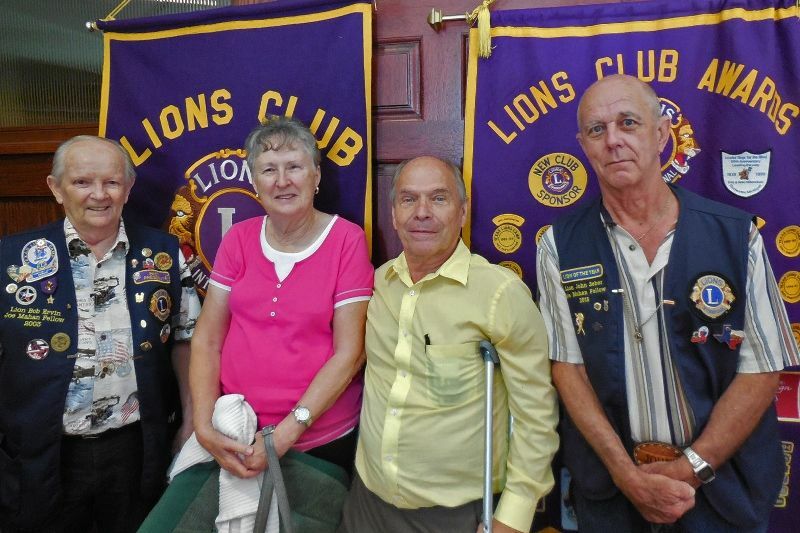 Lions & guest pictured from left-right are: Lion Jerome Teichmiller, Speaker Cathy Pool and Lion John Phillips. Photo provided by Lion Al Gerhardt. Lion President Bubba Hardee introduced guest speaker Elizabeth Young, Volunteer Coordinator for Harbor Hospice of Tomball. 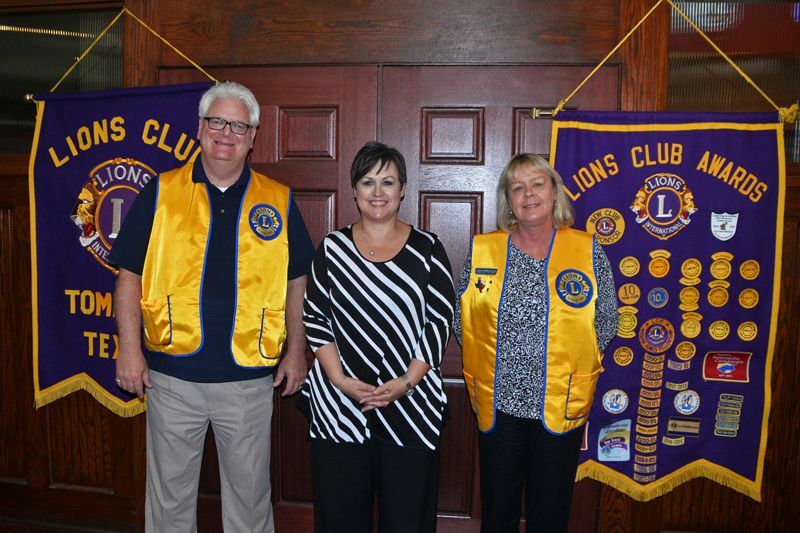 Lions & guest pictured left-right are: Lion John Seber, Speaker Elizabeth Young and Lion President Bubba Hardee. Photo provided by Lion Al Gerhardt. 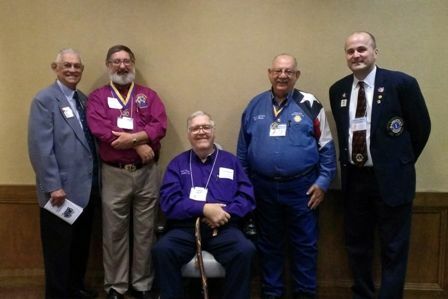 The Tomball Lions Club members President Bubba Hardee, Secretary Mike Halbach, Treasurer Al Gerhardt, Membership Chair Dale McCarty and newest Lion member Alex Mohnke attended the 2018 District 2-S2 Mid-Winter Conference. 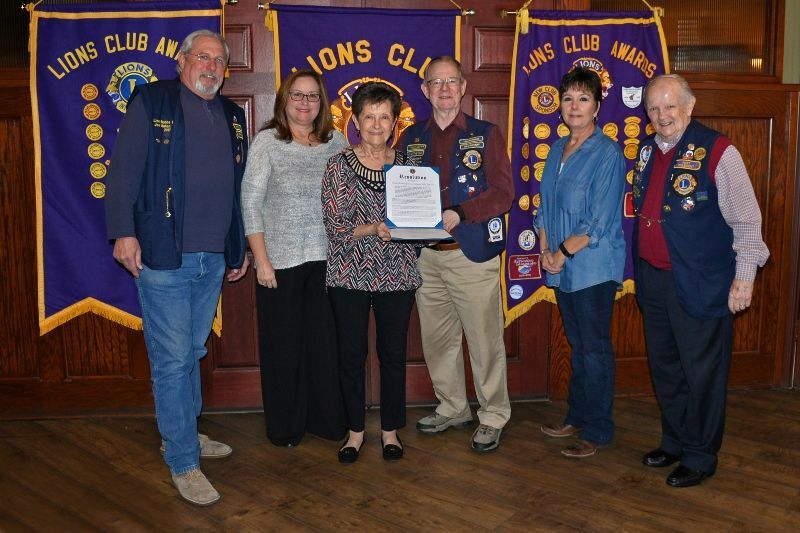 Lions pictured in the photo (l/r) Lion First Vice District Governor Karl Johnson, Tomball Lions Club new member Alex Mohnke, District Governor Betty Ezell, Tomball Lions Club Treasurer Al Gerhardt, Guest Speaker MD-2 Council Chair Rick Talbert and wife Lupita. Photo provided by Lion Al Gerhardt. 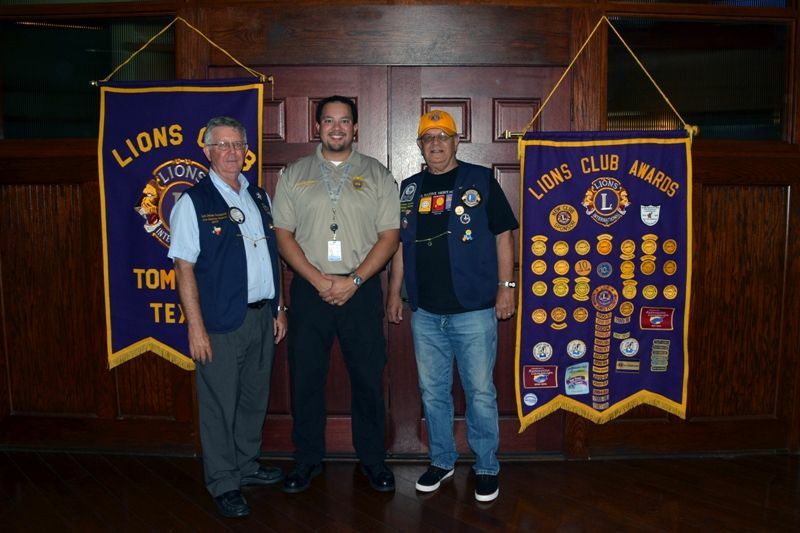 The Tomball Lions Club presented the Lion Vest to Lion Member Brett Kinman in the Club. 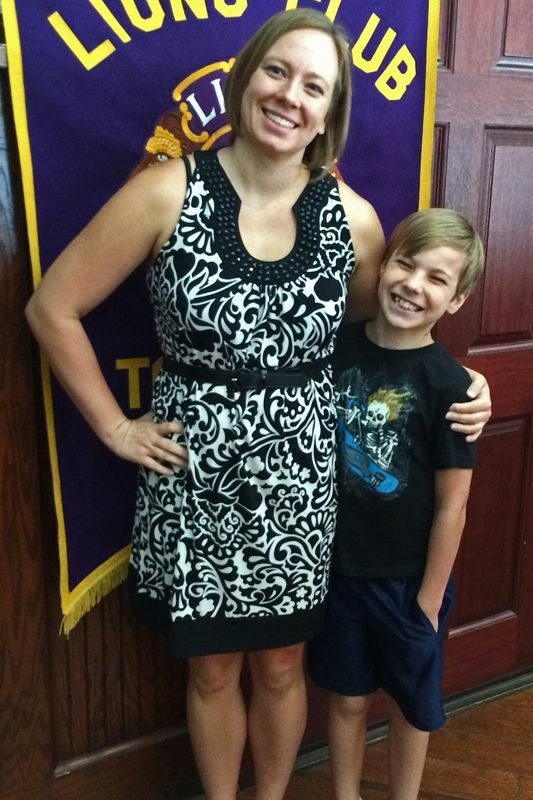 Brett is happy being a member of the Tomball Lions Club. 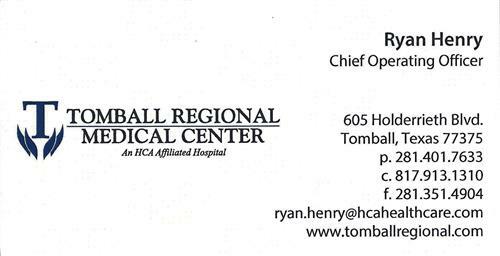 Brett plays a vital role in our club as he is the liaison between the Tomball Regional Hospital and the Tomball Lions Club. As his role at the hospital he has played a vital role in providing support for some of the club’s fund raisers. We are proud to have him in our Club. Pictured from left to right are Lion Treasurer Al Gerhardt and Lion Member Brett Kinman. Photo provided by Lion Al Gerhardt. 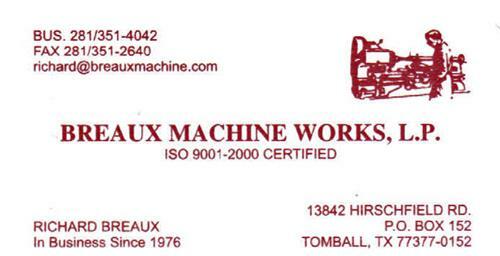 The Tomball Lions Club would like to welcome 18 year old Alex Mohnke as a new member in the Club. Pictured from left to right are: Michael Halbach, Alex Mohnke, Al Gerhardt, and Karen Halbach. Photo provided by Lion Al Gerhardt. Lion Al Gerhardt introduced special guests Vera Zitterich, wife of recently departed Past District Governor Lion Daniel “Danny Z” Zitterich, and her two daughters, Pam May and Becky Ponder. Lion & guests pictured left-right, Lion President Bubba Hardee, Pam May, Vera Zitterich (Wife of Danny “Zee” Zitterich), Lion Treasurer Al Gerhardt, Becky Ponder and Lion Past President Bob Ervin. Photo provided by Lion Al Gerhardt. 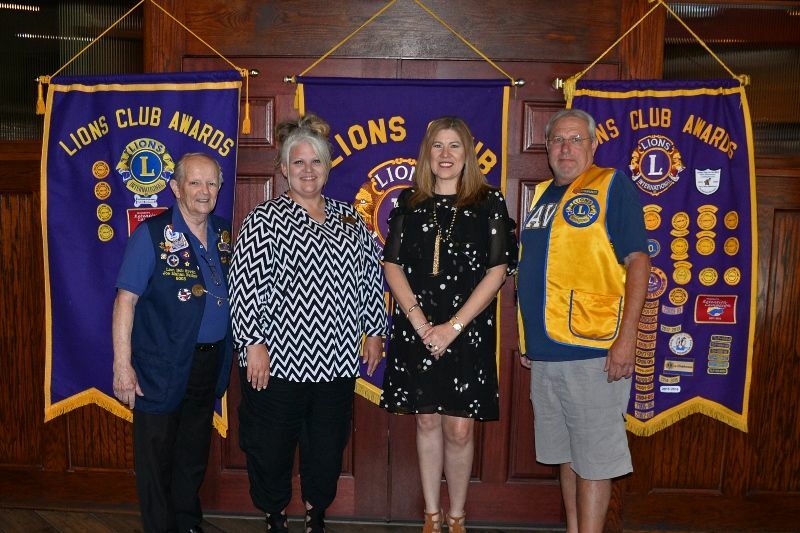 Lion President Bubba Hardee introduced guest speaker Karen Guiles, Tomball Benevolent Network (TBN) Community Liaison with the Tomball Emergency Assistance Ministries (TEAM). Lion & guests pictured left-right, Lion Tail Twister John Seber, Lion Director Karen Halbach, Speaker TBN Karen Guiles, Lion Membership Chairman Dale McCarty and Lion Secretary Mike Halbach. Photo provided by Lion Al Gerhardt. 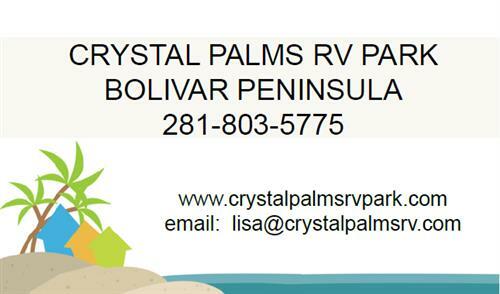 I would like to give an update on the Tomball Lions Club Harvey Relief for 2017. 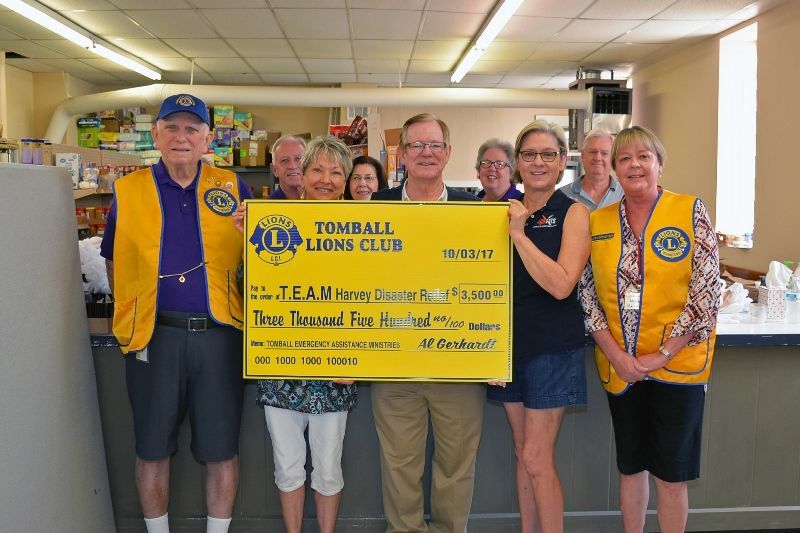 As of the end of 2017, The Tomball Lions Club gave out $17,200 to help Harvey Victims. 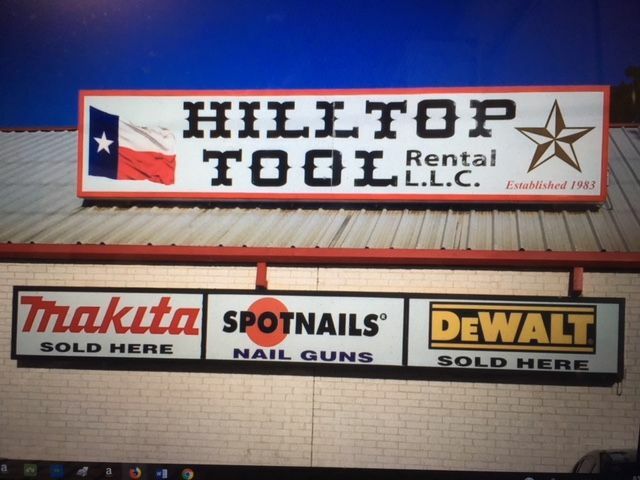 I want to give a special thank you for my good friend and Lion Club Sponsor Lion Pete Hildreth of Hilltop Rental in Tomball, Texas. He was the first person that gave funds and items to help Harvey Victims. He started by giving 14 cases of water. Before I left he gave me a check for $1000 to start the fund raising by our club to help Harvey Victims. 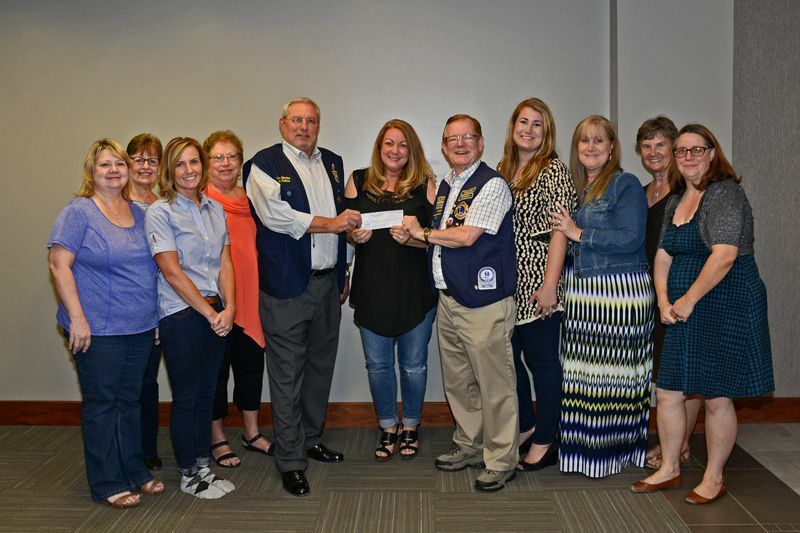 After that we had the Tomball Lions Club Joe Mahan disaster relief fund and other clubs, Lions Club International Foundation (LCIF), and many individuals to bring the total to the $17,200. 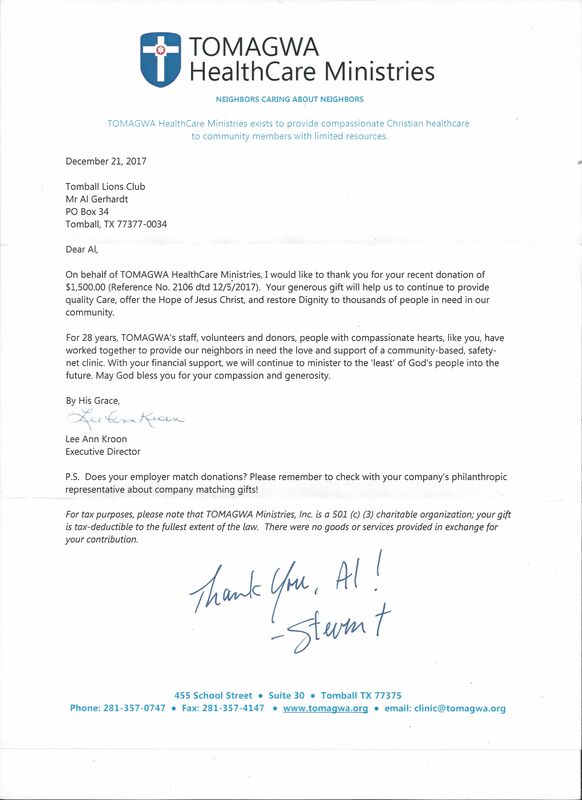 We distributed the funds to community organizations such as TEAM (Tomball Emergency Assistance Ministries) and many individuals. 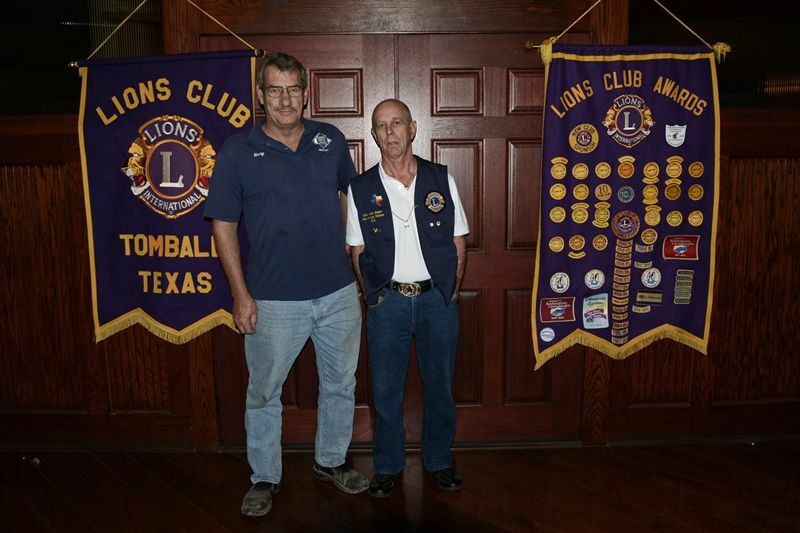 Lion President Bubba Hardee introduced Guest Lion Paul Moore to share fund raising activities/methods employed by the Conroe Noon Lions Club which currently has 300+ members. 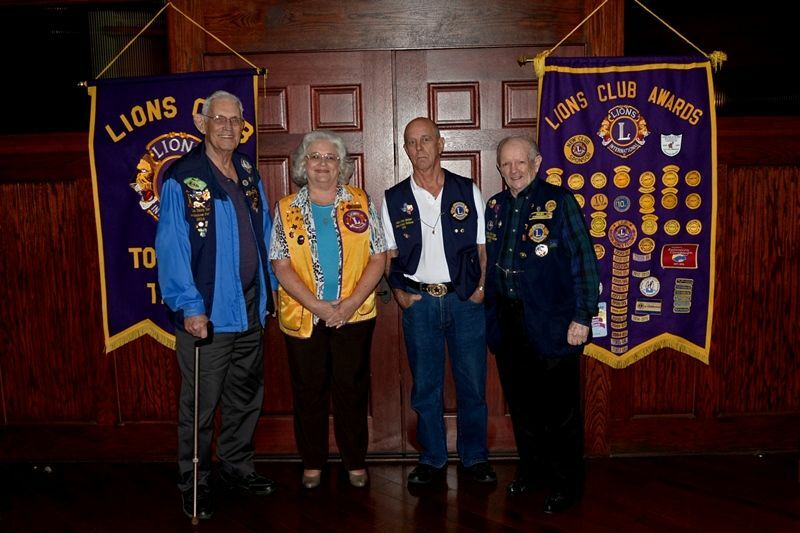 Lion & guests pictured from left to right are: Lion Past President Bob Ervin, Lion Secretary Karen Moore of the Montgomery Lions Club, Zone Chairmen Paul Moore, and President Bubba Hardee. Photo provided by Lion Al Gerhardt. Tomball Lion Treasurer Al Gerhardt Presented a Fund Assistance Check to the Community Action Teams Coordinator Wayne A. Bergeron. 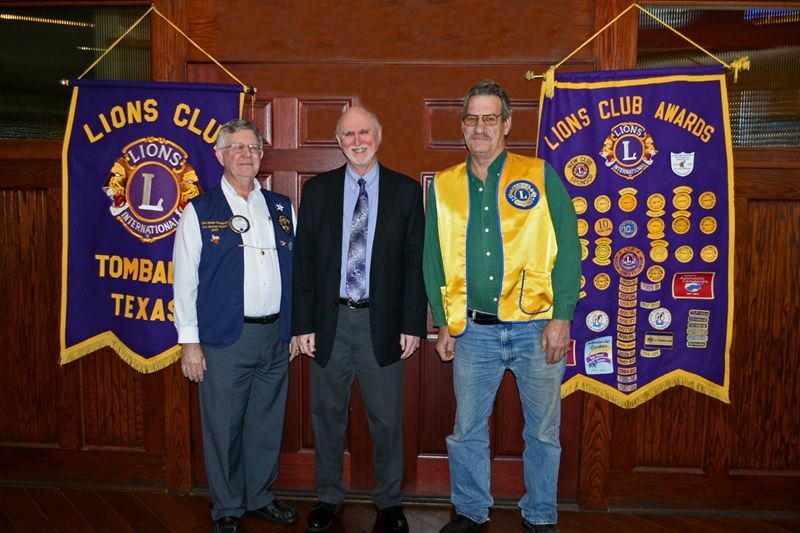 Pictured L-R Tomball Lion Treasurer Al Gerhardt, Community Action Teams Coordinator Wayne A. Bergeron and Tomball Lion President Bubba Hardee. Photo provided by Lion Al Gerhardt. 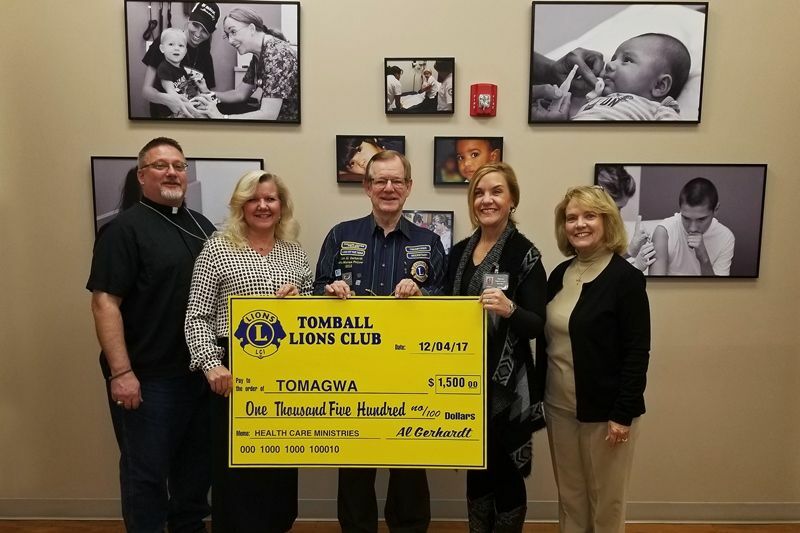 The TOMAGWA Group provided The Tomball Lions Club with an appreciation letter for the check of the $1500 allocation by the club to help TOMAGWA to continue providing medical assistance to families in need. 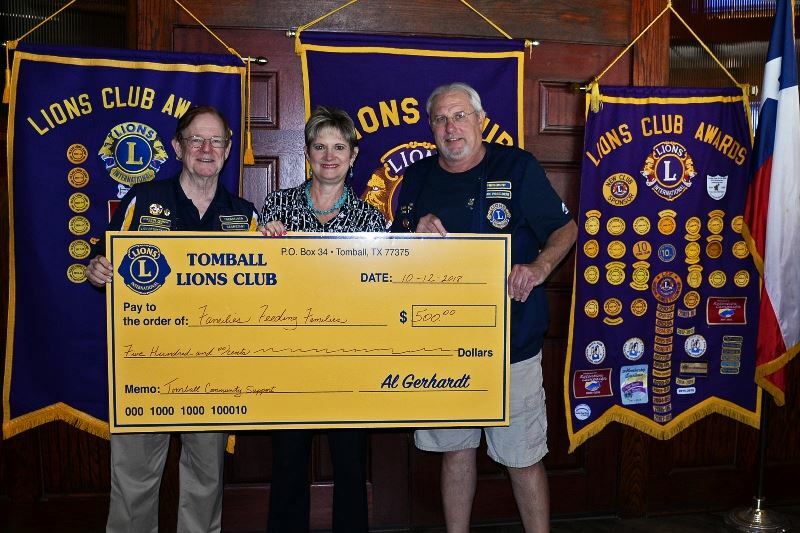 The Tomball Lions Club was so blessed this year to continue to provide the funds for them. 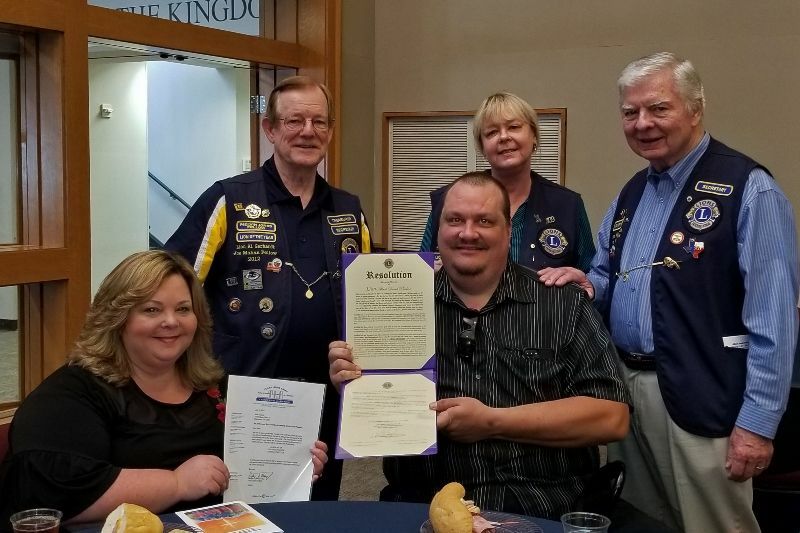 Pictured from left to right are: Reverend Steven Lightfoot – Senior Development Director, Executive Director Lee Ann Kroon, Tomball Lions Club Treasurer Al Gerhardt, Deanna Lowenstein - Patient Access Management and Tami Sabey – Administrative Assistant to Lee Ann Kroon. Photo provided by Lion Al Gerhardt. 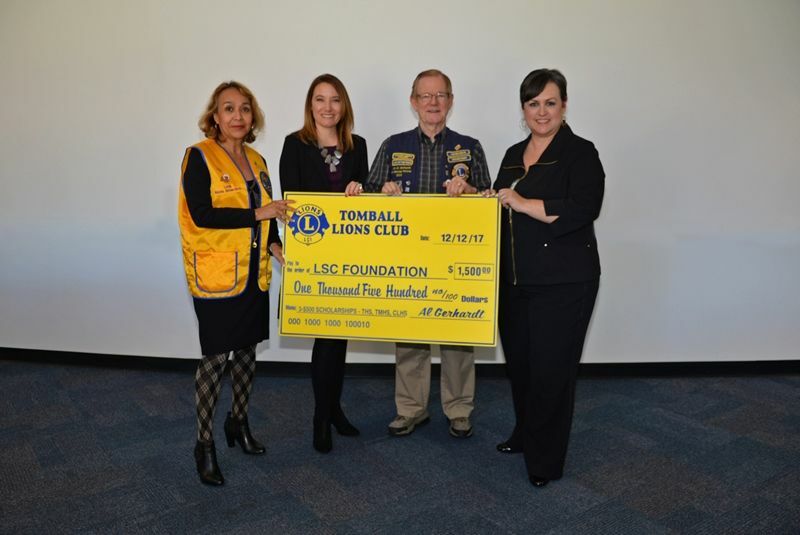 Tomball Lions Club Treasurer Al Gerhardt presented a $1000 Lions Club International Foundation (LCIF) Christmas Grant to families affected by the Hurricane Harvey Disaster. This is a family of 10 who were really thankful for the assistance to allow them to have a Merry Christmas. 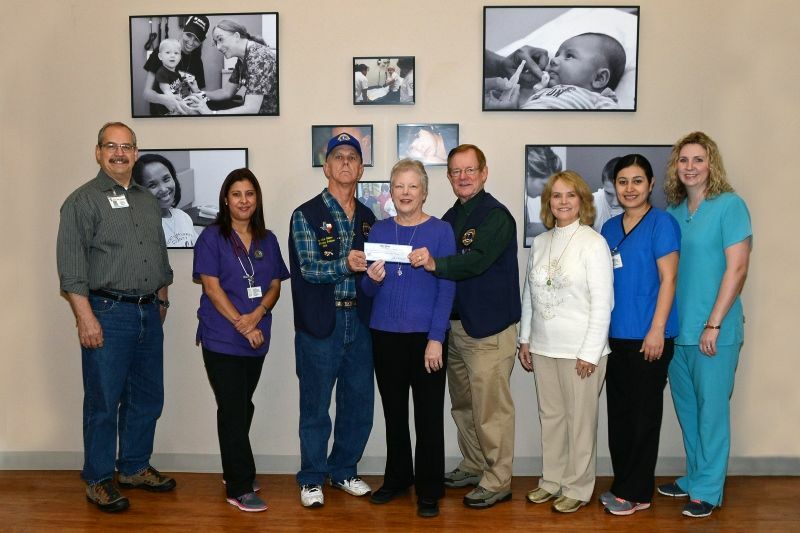 Pictured from left to right are: Bonnie, Dave, Elizabeth, Julianna, Felicity, Nicolas, Jude, Andrew, Tomball Lions Club President Robert “Bubba” Hardee and Tomball Lions Club Treasurer Al Gerhardt. Family members Michael and Robert are not shown in the photo. Photo provided by Lion Al Gerhardt. 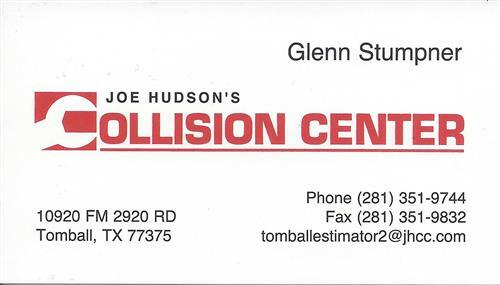 Tomball Lion Treasurer Al Gerhardt Presented a Fund Assistance Check to the Tomball Lone Star College. 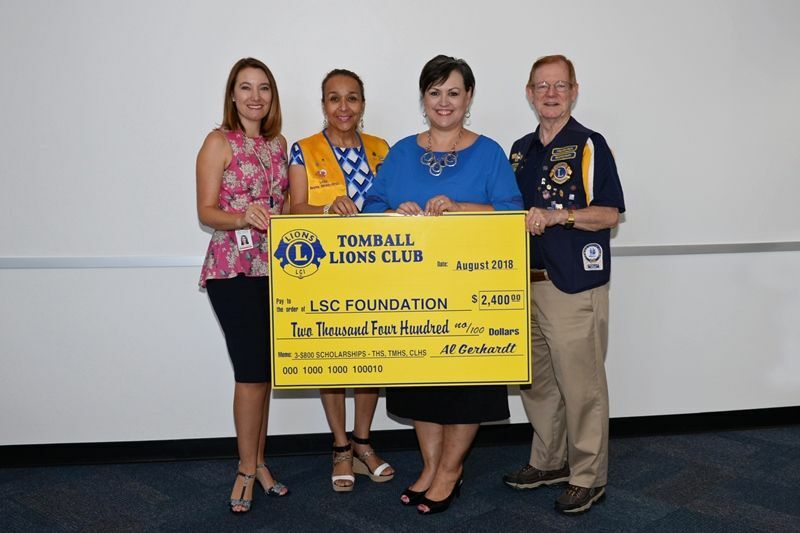 Pictured from Left to Right are: Lion Reyna L. Sirias-Ortiz, Lone Star College (LSC) – Tomball Professor, Ms. Robinson Gautier, LSC Foundation, Tomball Lions Club Treasurer Al Gerhardt and Dr. Lee Ann Nutt LSC-Tomball President. Photos provided by Lion Al Gerhardt. 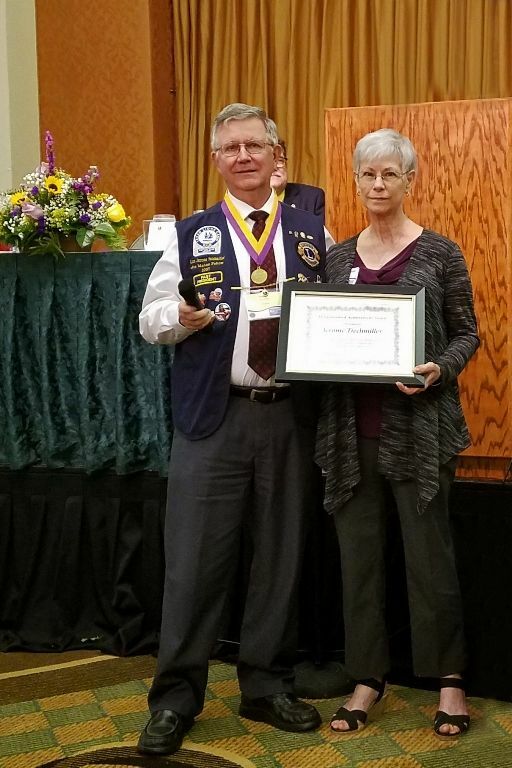 Texas Lions District 2-S2 and the Tomball Lions Club presented two Memorials to Vera Zitterich and the family of Daniel Lee Zitterich respectively known as “Danny Zee” or “Z”. 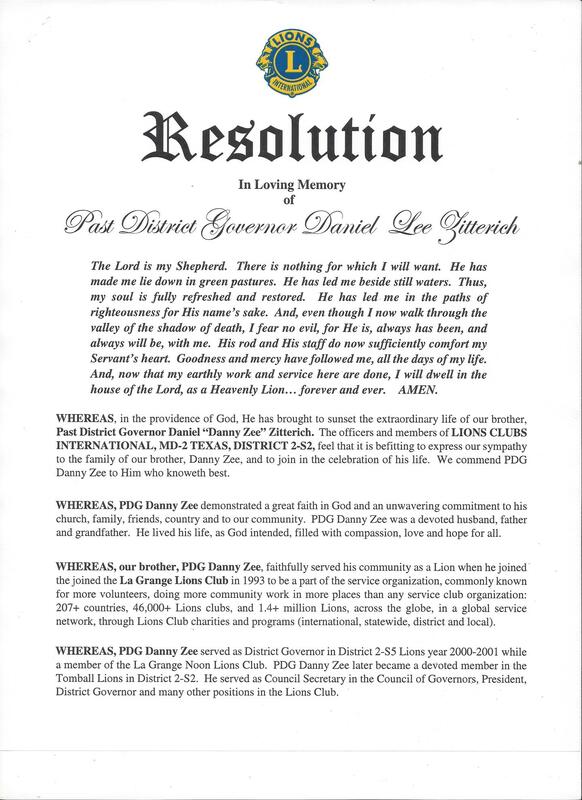 The Texas Lions District 2-S2 presented a special Resolution in Loving Memory of “Daniel Lee Zitterich”. Today the Tomball Lions Club lost a “Great Lion”. He was Past District Governor (PDG) Daniel Zitterich (Danny Z) and he will be missed! Pictured above from left to right are Vera & Daniel Zitterich (Danny Z). Photo provided by Lion Al Gerhardt. Tomball Lion Treasurer Al Gerhardt Presented a Fund Assistance Check to the Tomball – Magnolia – Waller (TOMAGWA) Health Care Ministries. Pictured from left to right are: Reverend Steven Lightfoot – Senior Development Director, Executive Director Lee Ann Kroon, Tomball Lions Club Treasurer Al Gerhardt, Deanna Lowenstein - Patient Access Management and Tami Sabey – Administrative Assistant to Lee Ann Kroon. Photo provided by Lion Al Gerhardt. Tomball Lion Treasurer Al Gerhardt Presented a Fund Assistance Check to the City of Tomball Police & Fire Department for Christmas Aid in the Tomball Community. Pictured L-R City of Tomball Chief of Police Billy Tidwell, Tomball Lion Treasurer Al Gerhardt, Tomball Mayor Gretchen Fagan, and the City of Tomball Fire Chief Randy Parr. Photo provided by Lion Al Gerhardt. Lion President Hardee introduced guest speaker, Camille Hamilton, a Committee Member with Families Feeding Families. 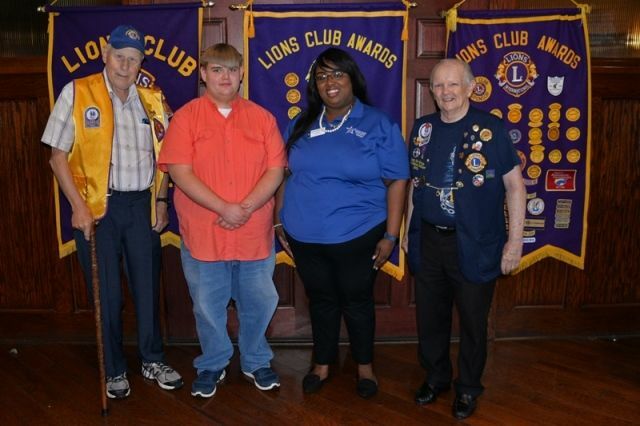 Lion & guests pictured from left to right are, Lion Jerome Teichmiller, Speaker Camille Hamilton and President Bubba Hardee. Photo provided by Lion Al Gerhardt. 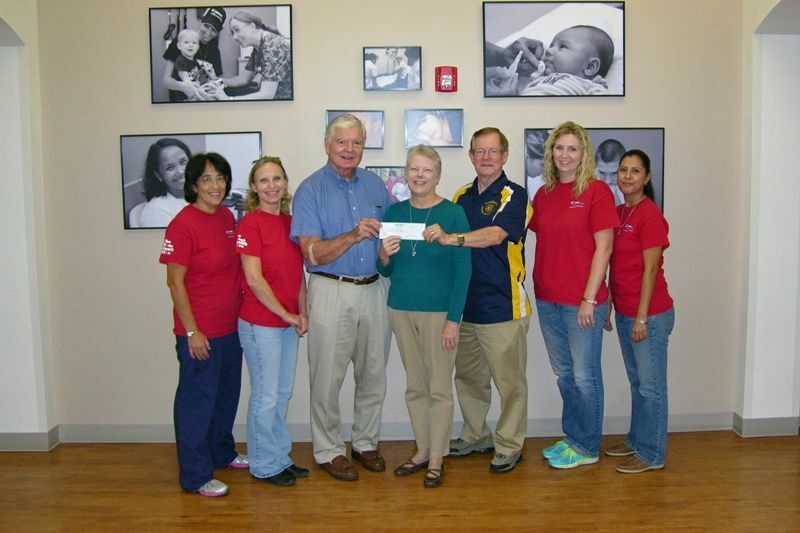 Tomball Lion Treasurer Al Gerhardt Presented a Fund Assistance Check to the Tomball Families Feeding Families. Pictured from left to right are: Families Feeding Families Director Camille Hamilton and Tomball Lion Treasurer Al Gerhardt. Photo provided by Lion Al Gerhardt. 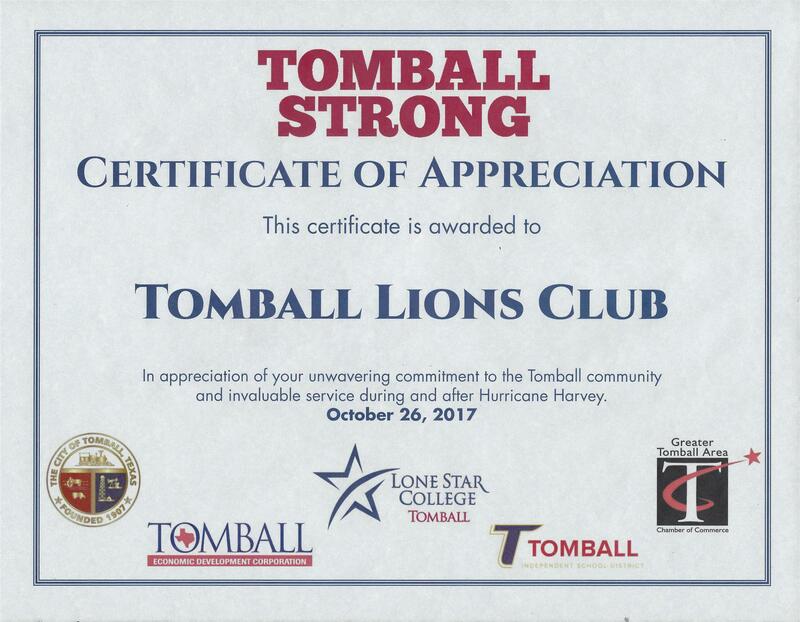 The Tomball Chamber of Commerce and Salem Lutheran Church recognized the Tomball Lions Club for all of the Hurricane Harvey Relief to the Tomball Community. The photo above is of that Certificate of Appreciation. 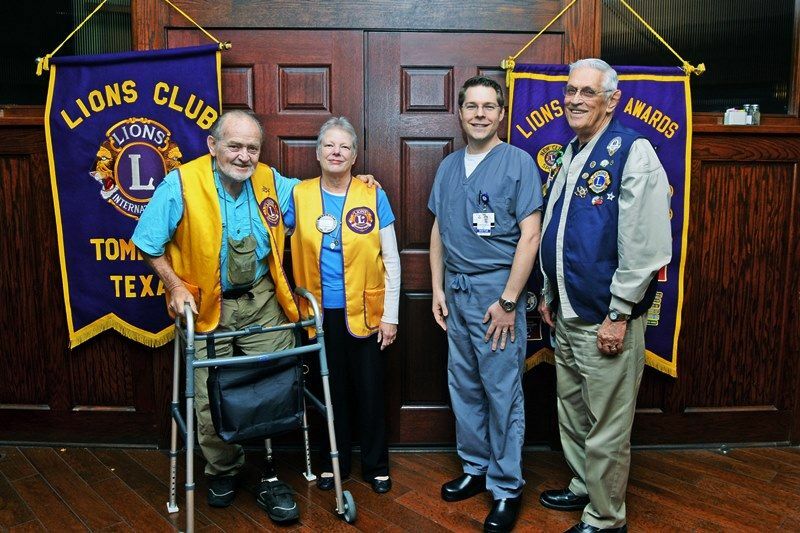 Lion Al Gerhardt introduced guest speaker Brett Kinman, Interim CEO and Chief Operating Officer of Tomball Regional Medical Center (TRMC) and Tomball Lions Club member. 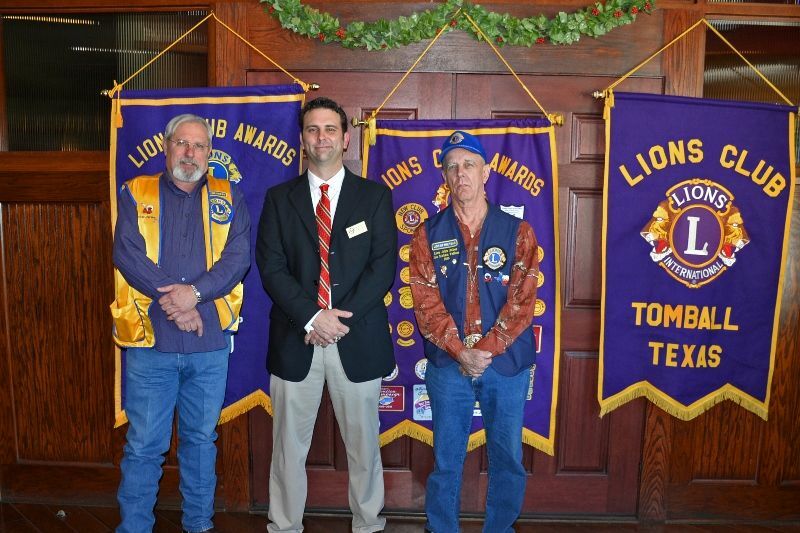 Lion & guests pictured from left to right are: Lion Secretary Mike Halbach, Lion & CEO Brett Kinman, and Lion George Shackelford. Photo provided by Lion Al Gerhardt. Tomball Lions Club Treasurer Al Gerhardt presented Mrs. Christy Lieder a second check for $700 from the Lions Club International Foundation for food to aid families affected by the Hurricane Harvey Disaster. 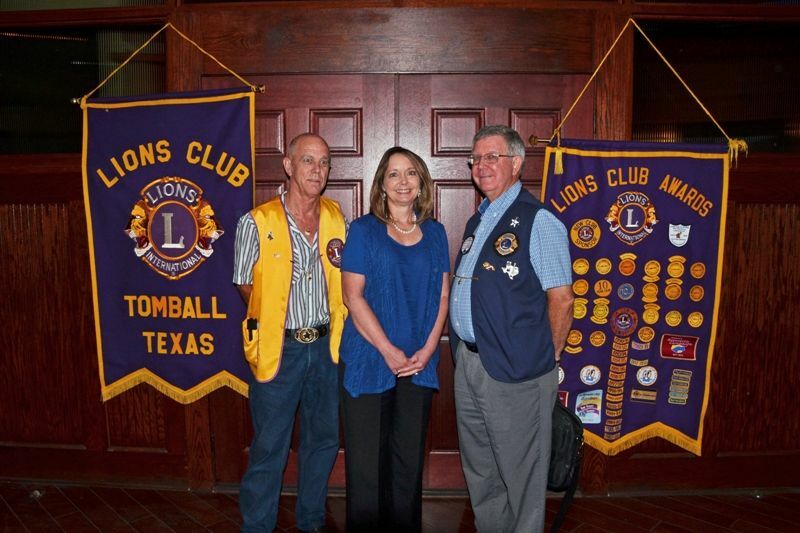 Pictured from left to right middle are: Mrs. Christy Lieder and Tomball Lions Club Treasurer Al Gerhardt. Photo provided by Lion Al Gerhardt. 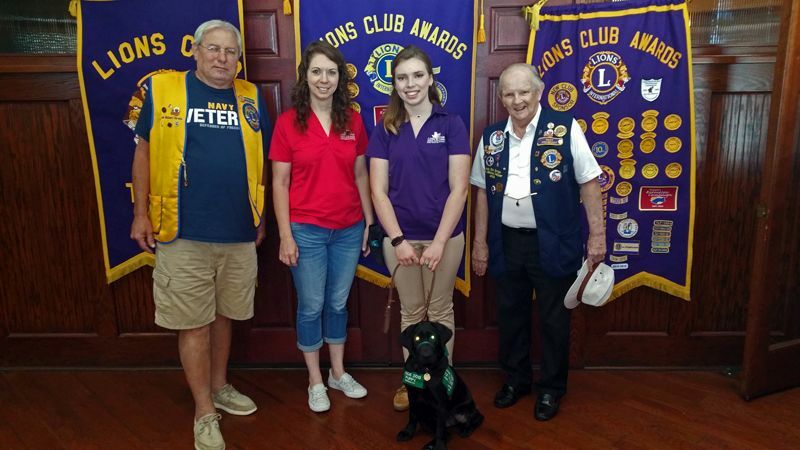 Lion President Hardee introduced guest speaker, Lion Dale McCarty, who gave a very interesting presentation on the Lions Leader Dog for the Blind Facility in Rochester Hills, Michigan, where he visited and toured this past summer. 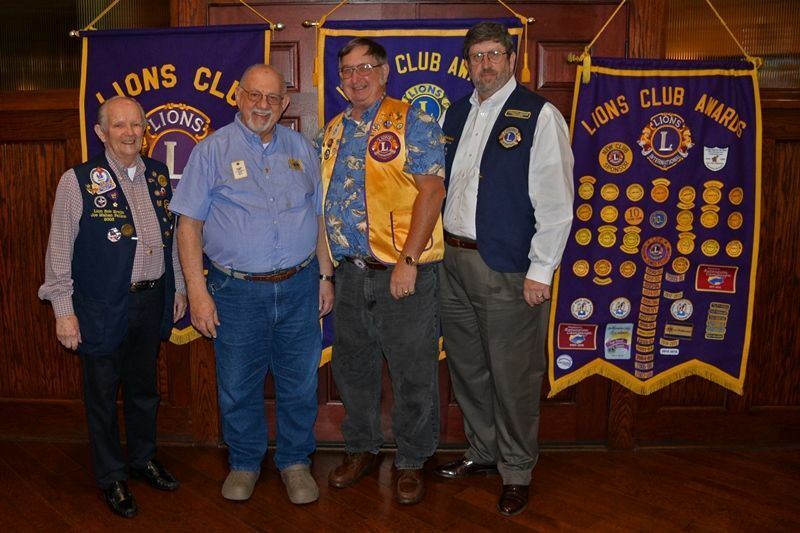 Lion & guests pictured left-right are: Lion President Bubba Hardee, Lion Dale McCarty, and Lion Vice-President John Pettigrew. Photo provided by Lion Al Gerhardt. Tomball Lion Treasurer Al Gerhardt Presented a Hurricane Harvey Disaster Relief check to Tomball Emergency Assistance Ministries (T.E.A.M.). Pictured from left to right are: Tomball Lion Dale McCarty, TEAM Executive Director Becky Loving, Tomball Lion Treasurer Al Gerhardt, Tomball Mayor Gretchen Fagan, and Tomball Lion Director Karen Halbach. Photo provided by Lion Al Gerhardt. 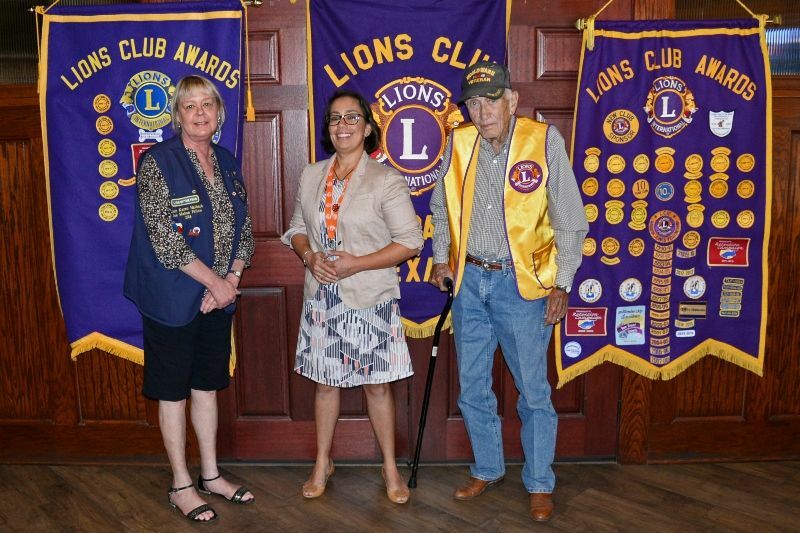 Lion President Hardee introduced the first guest speaker, Dr. Martha Salazar-Zamora, Superintendent of Schools for the Tomball Independent School District (TISD) and then introduced the second guest speaker, Candice Baines, Treasurer of Tomball VFW Post 2427 Auxiliary. 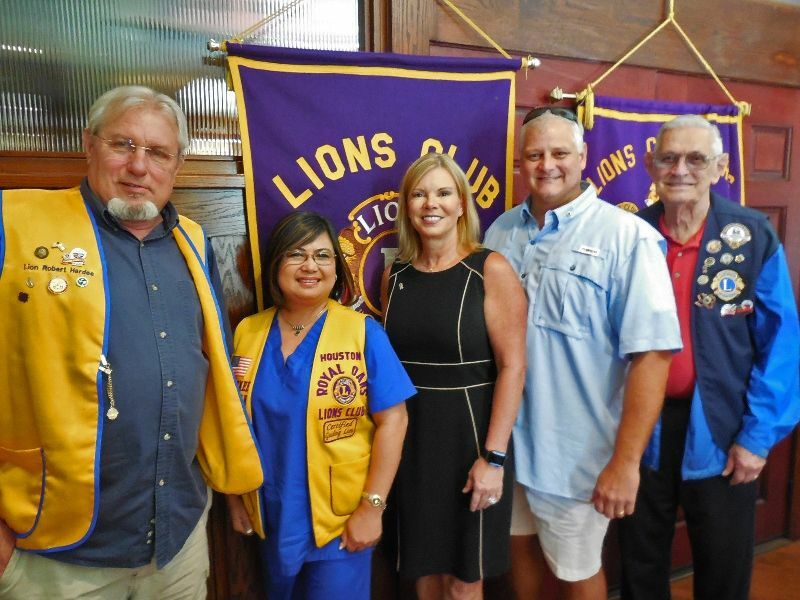 Lions & guests pictured left-right are: Lion Past President Bob Ervin, Guest Speaker Candice Baines & Dr. Martha Salazar-Zamora, and Lion President Bubba Hardee. Photo provided by Lion Al Gerhardt. Tomball Lions Club President Bubba Hardee and Treasurer Al Gerhardt presented Mrs. Christy Lieder’s group a check for $2,000 from the Texas Lions Foundation for food to aid families affected by the Hurricane Harvey Disaster. 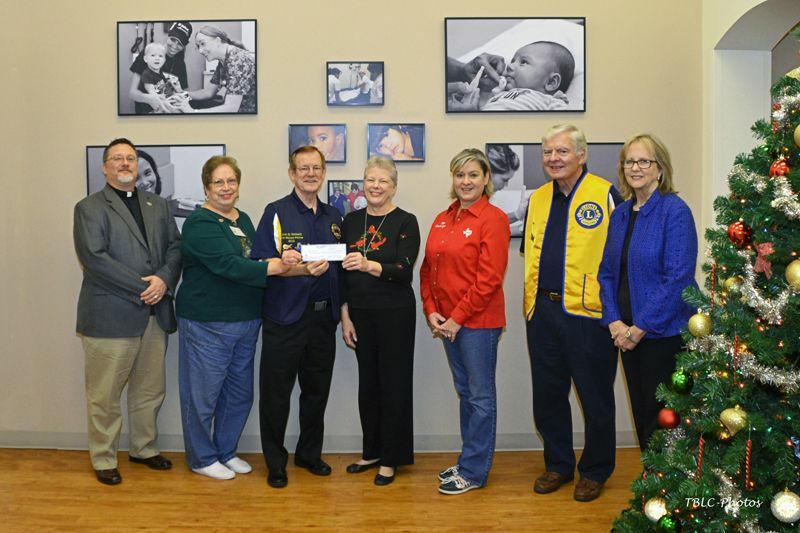 Pictured left to right, Lisa Stetler, Eva Gerhardt, Kimberly Gerhardt, Phyllis Behrend, Tomball Lions Club President Bubba Hardee, Pam Mintari, Tomball Lions Club Treasurer Al Gerhardt, Stephen McNeely, Karol Rover, and Patty McNeely. Photo provided by Lion Al Gerhardt. Tomball Lions Club Treasurer Al Gerhardt presented Mrs. Christy Lieder a check for $750 from the Lions Club International Foundation for food to aid families affected by the Hurricane Harvey Disaster. 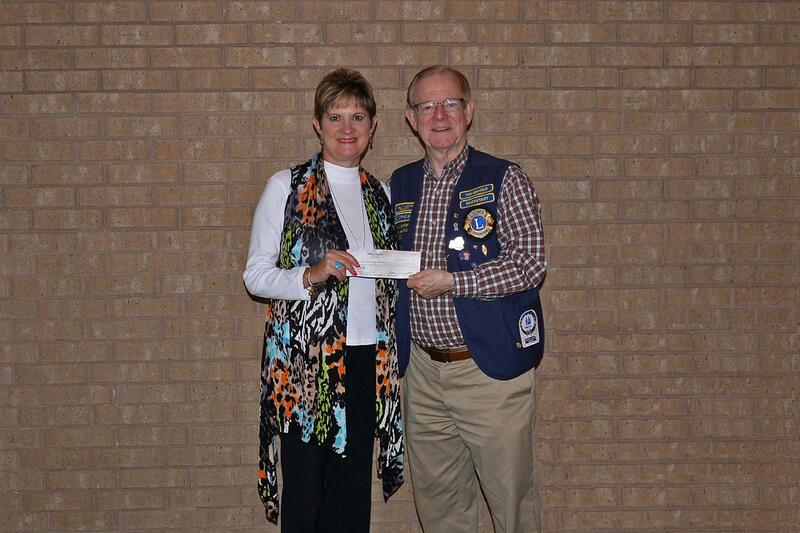 Pictured from left to right are Mrs. Christy Lieder and Tomball Lions Club Treasurer Al Gerhardt. Photo provided by Lion Al Gerhardt. 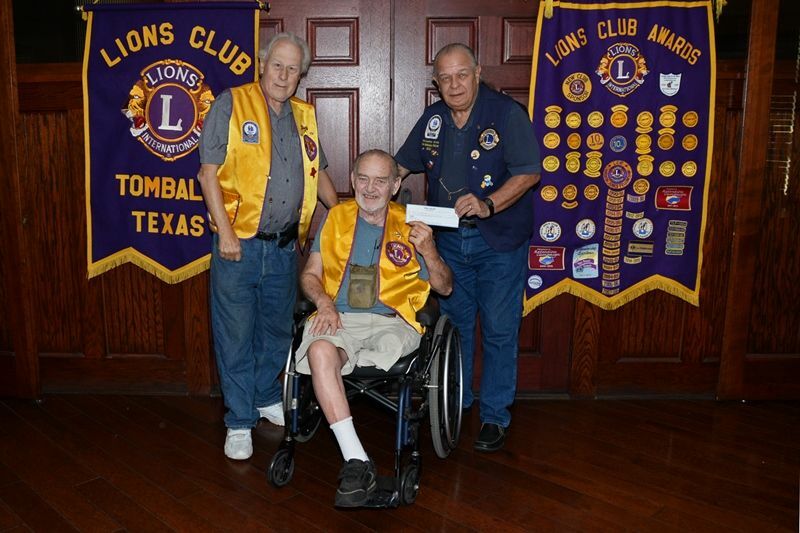 Lion John Seber showed the above appreciation letter and the Dog Bone that was received from the Leader Dogs for the Blind group for the $100 donation made by the Tomball Lions Club. 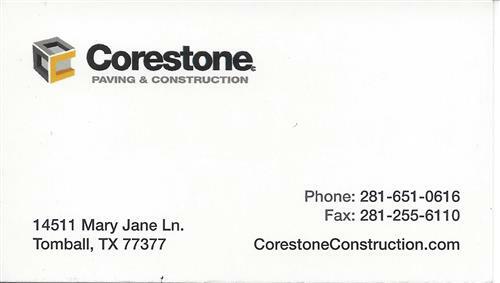 The appreciation letter image was provided by Lion Al Gerhardt. Lion Treasurer Al Gerhardt introduced guest speaker, Megan Gerhardt (his granddaughter), who recently returned from a month long mission trip to Cuba with ten other young men and women coordinated by the Experience Mission organization. 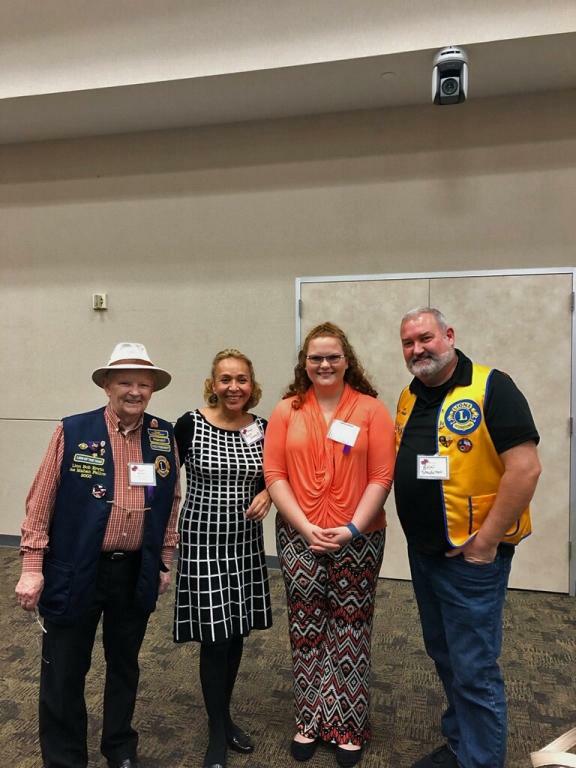 Pictured from left to right are: Lion Board Member Karen Halbach, Guest Speaker Megan Gerhardt, Lion Treasurer Al Gerhardt and Lion Membership Chairperson Dale McCarty. Photo provided by Lion Al Gerhardt. Lion President Hardee introduced the first guest speaker Paula Whitaker representing the Cross of Tomball in Memory of her son Ryan Paul Whitaker. 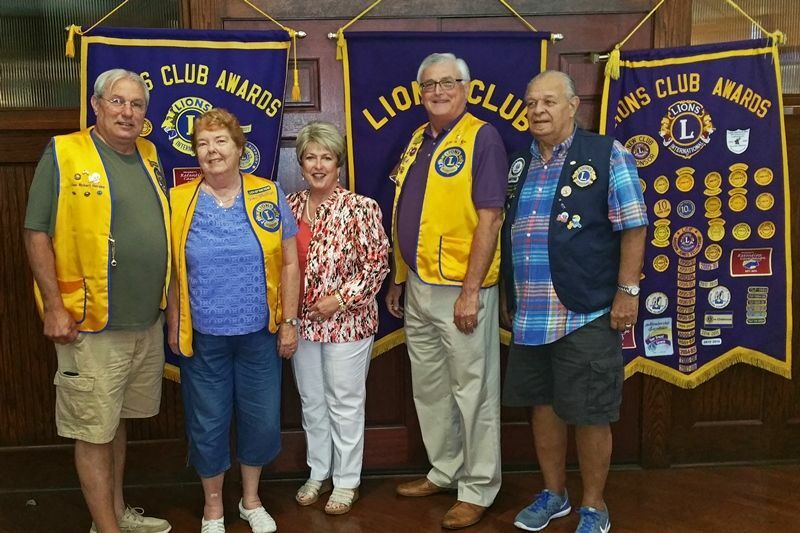 Lion & guests pictured from left to right are: Lion President Bubba Hardee, Lion Joan Phillips, Guest Speaker Paula Whitaker, Lion District 2-S2 Zone 01 Chairman Paul Moore and Lion Larry Grotts. Photo provided by Lion Al Gerhardt. 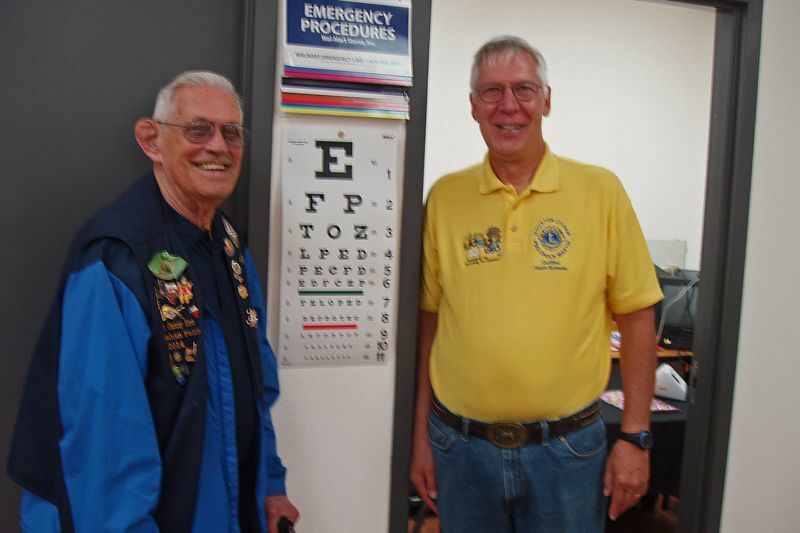 The Tomball Lions Club did a Free Vision screening for kids 6 months and up at the Tomball Walmart Vision Center located at 27650 Tomball Parkway, Tomball, Texas. The Club members President Bubba Hardee and PDG Danny Zee, certified to do vision screening, were there from 11AM - 3PM on Saturday 7/29/2017. They do these screenings as a community service project. 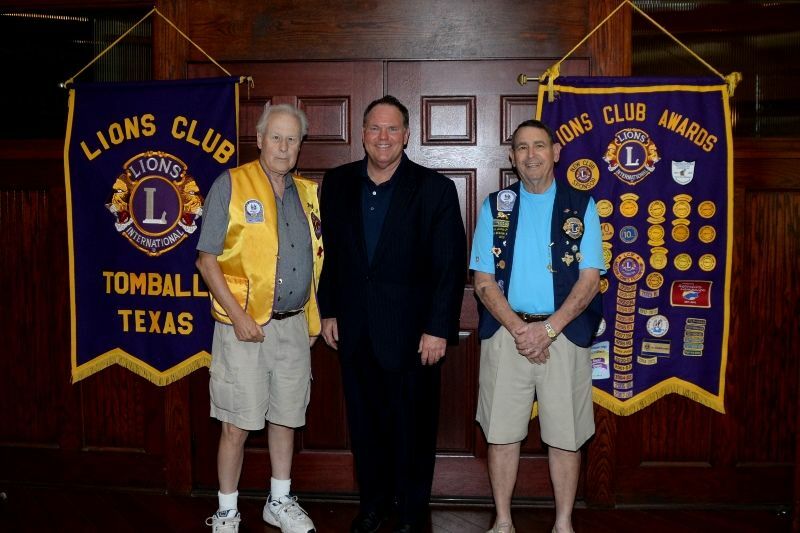 Lions & guests pictured from left to right are: Tomball Lions Club PDG Danny Zee and PDG Chuck Martin from Cy-Fair Lions Club. Lion Bubba Hardee provided the Web Site and FB page with the photo. Lion President Hardee introduced the first guest speaker Molly Meyer from the Girl Scout Gold Award Project. Lion & guests pictured from left to right are: Lion President Hardee, Katy (Mother and Scout Leader), Molly Meyer (Girl Scout), and Lion Past President Bob Ervin. Lion Al Gerhardt provided the Web Site with the photo. Lion President Hardee introduced guest speaker Richard Binkley and his wife Barbara from Katy, TX. 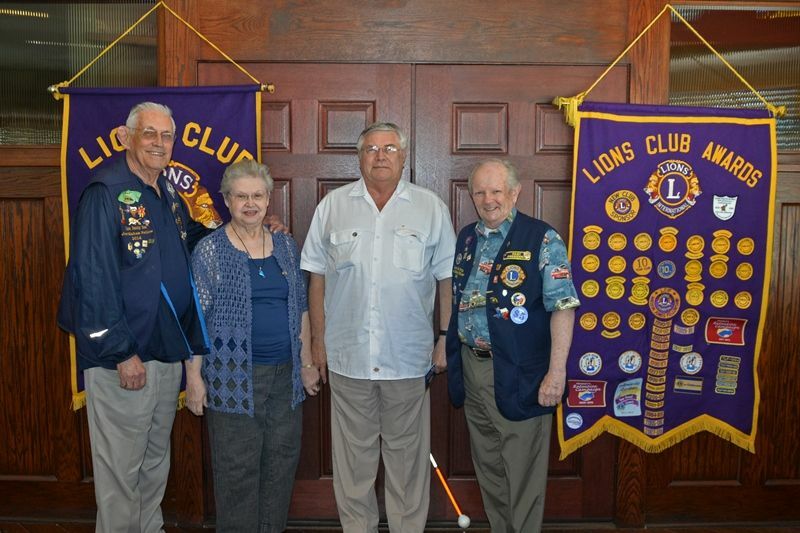 Pictured left to right are: Lion Past President Bob Ervin, Guest Speaker Wife Barbara Binkley, Guest Speaker Richard Binkley, and Lion Tamer John Seber. 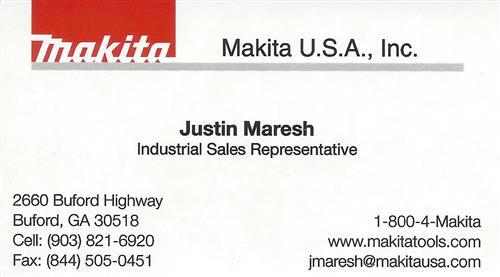 Lion Secretary Mike Halbach provided the Web Site with the photo. Lion President Hardee introduced special guests District Camp Directors Lisa Free-Martin and Emee Nisnisan. 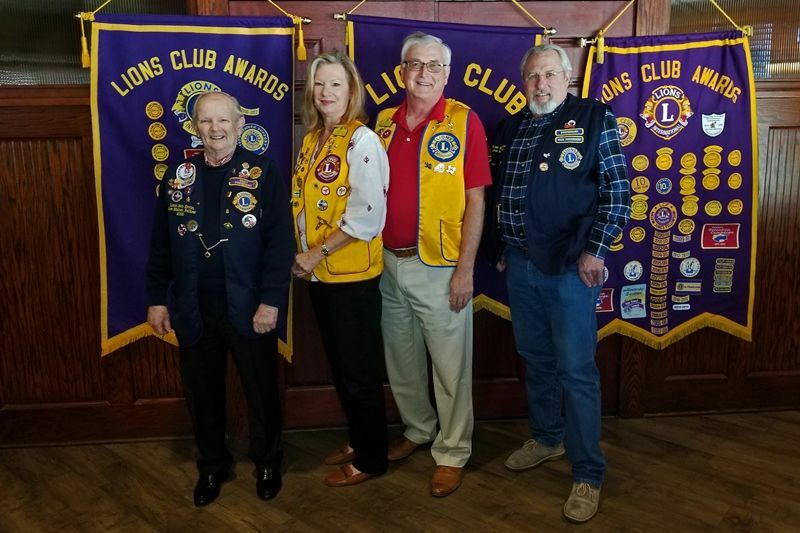 Pictured from left to right are Lion President Robert “Bubba” Hardee, Houston Royal Oaks Lions Club Emee Nisnisan, Magnolia Lions Club Camp Director Lisa Free-Martin, Conroe Noon Lions Club and PDG 2-S2 Scott Perry, and the TBLC PDG Danny Zee. Photo provided by Lion Secretary Mike Halbach. The Texas Lions Camp held the Awards Week from 06/17/17 – 06/23/17 Scholarship Awards. The Tomball Lions Club presented three $1,000 Scholarships to the Camp Counselors' Recipients. The photo shows the recipients. From left to right, they are: James Faulkenbury, Kristen Ekholm, Aaron Stevenson and Tomball Lions Club presenter Lion John Phillips. Photo provided by Lion Al Gerhardt. 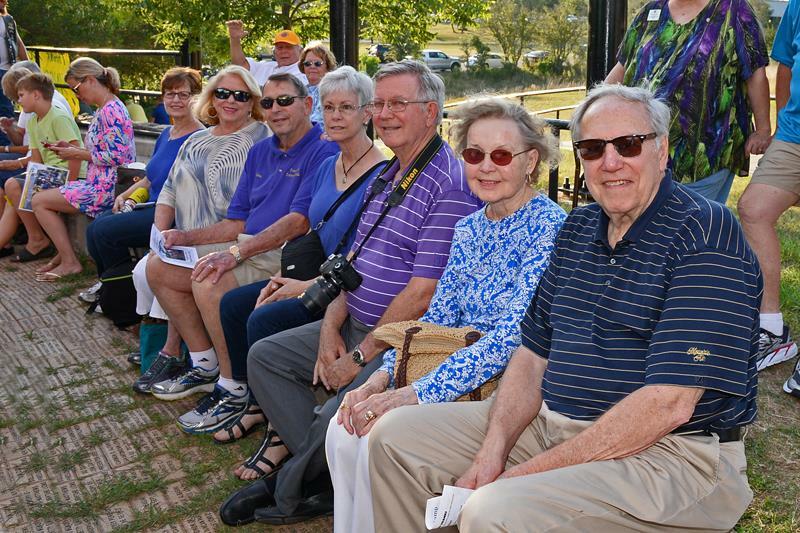 The Tomball Lions Club Members in Attendance are from left-Right, Back Row Joe & Barbara Sebesta, Front Row Lady in Blue Eva Gerhardt, Eleanor & John Phillips, Kathy & Jerome Teichmiller, Mary Lu & William Dillion. Lion Al Gerhardt is taking the photo. 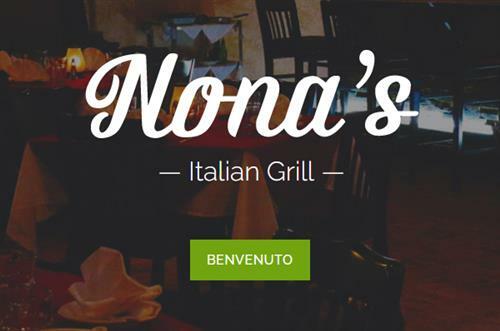 2017-2018 Installation Banquet was held at Nona's Italian Grill in Tomball, Texas on June 21, 2017.. 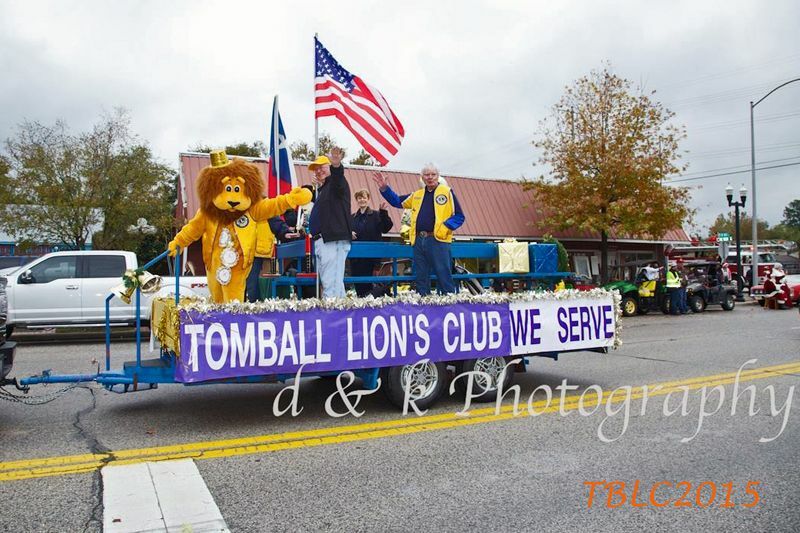 The Tomball Lions Club Board Members. Left - Right. Director Jerome Teichmiller, Lion Tamer John Seber, Director Karen Halbach, Secretary Mike Halbach, Guest Speaker PDG Eddie Risha, Past President Bob Ervin, Treasurer Al Gerhardt, President Robert "Bubba" Hardee, LCIF CoOrdinator Danny Zitterich, Tail Twister John Phillips, 1st Vice President Bill Dillon, 2nd Vice President John Pettigrew and Membership Chairman Dale McCarty. Lion Secretary Mike Halbach introduced guest speaker Dr. Waqar Khan with Lone Star Heart and Vascular Center in Tomball and his associate, Ms. Melialoha Bartlett, Coordinator/Consultant. 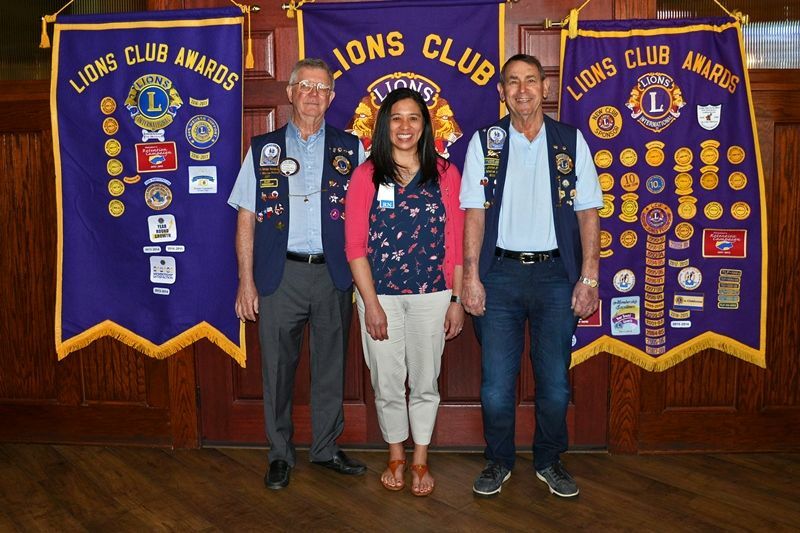 Lion & guests pictured left to right are: Lion President Bob Ervin, Ms. Melialoha Bartlett, Dr. Waqar Khan, and Lion Reyna Sirias-Ortiz. Photo provided by Lion Al Gerhardt. President Bob Ervin introduced Director Donielle Miller from the Tomball Lone Star College. 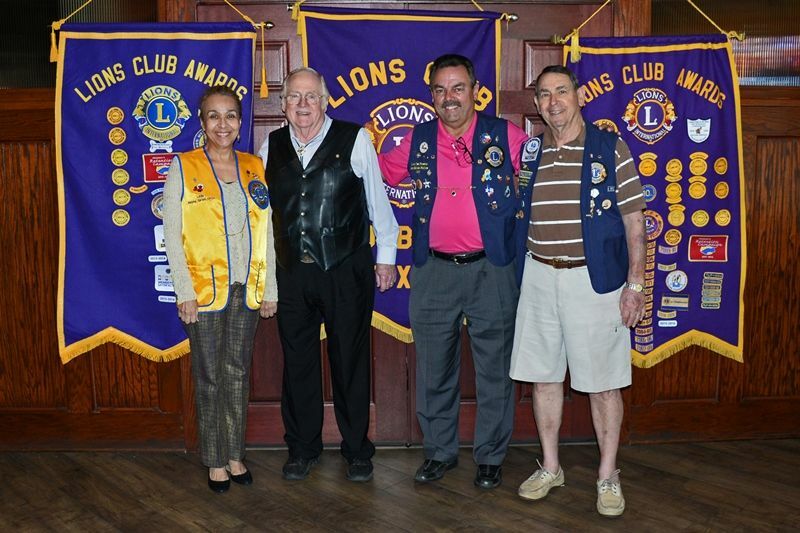 Lions & guests pictured from left to right are: Lion Allen Eckhardt, Student Douglas Baily, Director Donielle Miller and Lion President Bob Ervin. Photo provided by Lion Al Gerhardt. Lion President Ervin introduced guest speaker, Bruce Hillegeist, President of the Greater Tomball Area Chamber of Commerce. 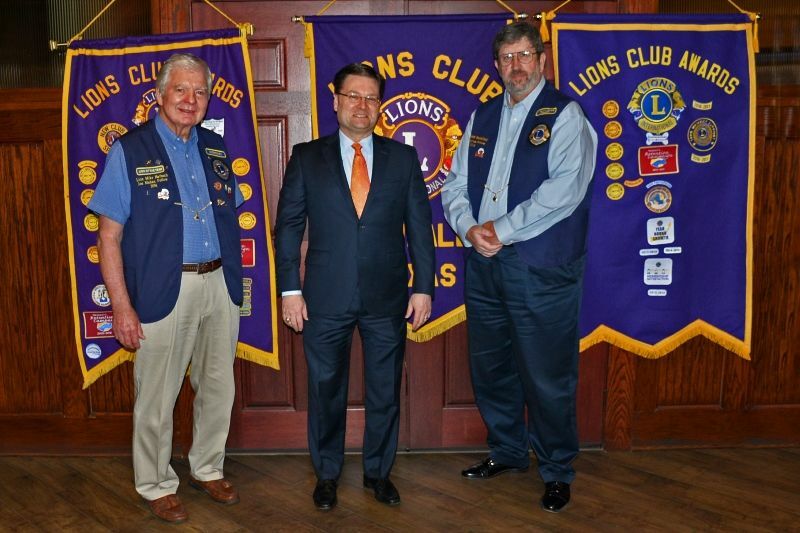 Pictured from left-right are: Lion David McClinton, President Bruce Hillegeist and Lion George Shackelford. Photo provided by Lion Al Gerhardt. 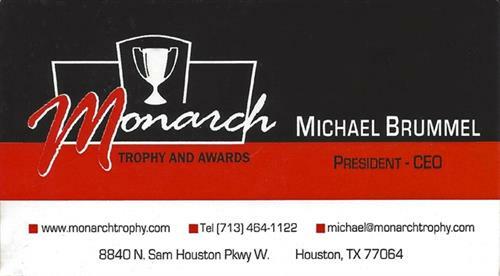 Lion Mike Halbach presented trophies to the top 30 places and the Mayors Trophy at the 23rd Annual Car Show at the Lone Star College in Tomball, Texas on Saturday April 29, 2017. Pictured is the Mayor’s Trophy – Brett Peabody 1937 Sea Grave J Model Pumper, First Place Trophy – Lou Ann Whitworth 1955 Chevy Belair, and Second Place Trophy – Billy Etheredge 1969 Camaro SS (Super Sport). Photo provided by Lion Al Gerhardt. Past District President (PDG) Danny Zee presented the District 2-S2 Past District Governors Distinguished Achievement Award to Past President Robert Jerome Teichmiller. 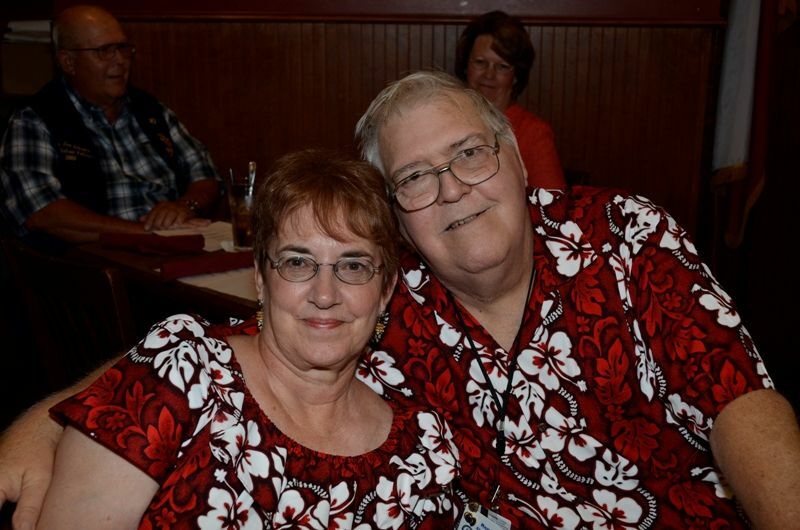 Pictured left to right are Lion Past District President Robert Jerome Teichmiller and his wife Kathy. Lion President Ervin then introduced guest speaker, Director David McClinton, Jr. from the Tomball Health Coalition. Pictured left-right. Lion Secretary Mike Halbach, Director and Lion David McClinton, Jr, and Lion George Shackelford. Photo provided by Lion Al Gerhardt. 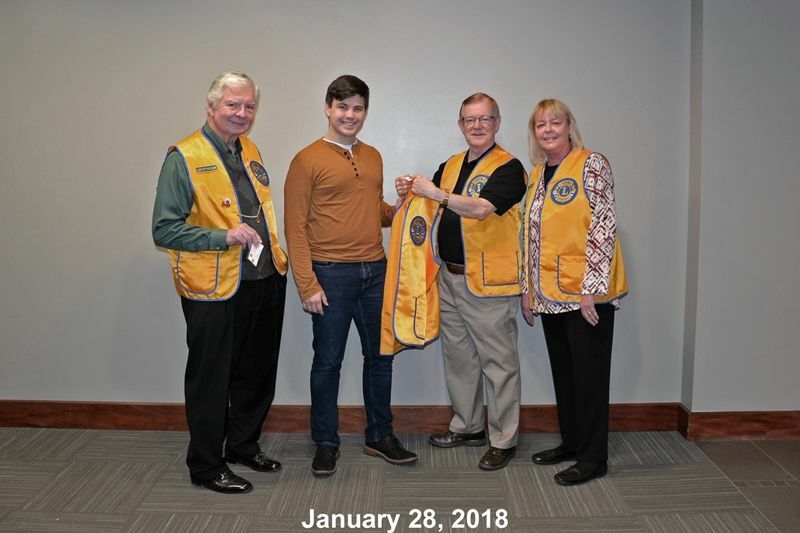 President Bob Ervin introduced Daniel Berry, Sales Representative for R-B Instruments, Inc., and member of the Houston Cy-Fair Lions Club. Pictured left to right are Lion Karen Halbach, Lion Vice President Bubba Hardee, Lion Reyna Siras, Sales Rep. Daniel Berry, PDG Danny Zee and Lion Dale McCarty. Photo provided by Lion Al Gerhardt. Lion Mike Halbach introduced guest speaker, PDG Eddie Risha, District 2-S2 LCI Foundation Coordinator from the Conroe Noon Lions Club. Pictured left-right are: Lion Vice President Bubba Hardee, PDG Eddie Risha, and PDG Danny Zee. Photo provided by Lion Al Gerhardt. 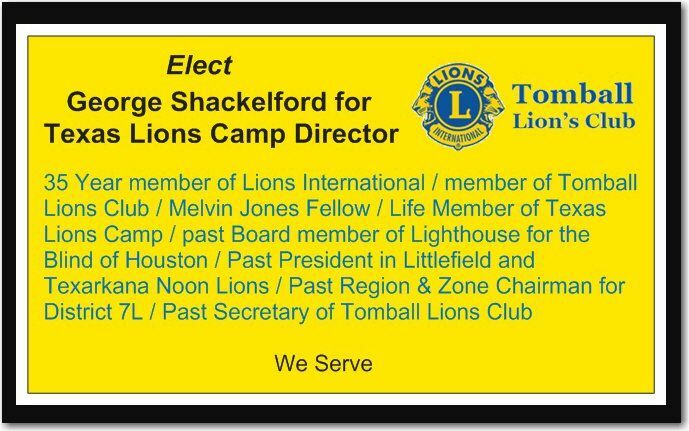 As Treasurer of the Tomball Lions Club, I would like any Lion Representative attending the District 2-S2 Convention to consider voting for the Tomball Lions Club Past Secretary George Shackelford for the position of Texas Lions Camp Director. 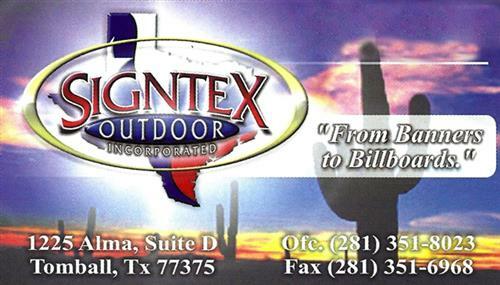 The convention is being held on April 28-29, 2017 at the Hilton Houston North, 12400 Greenspoint Drive, Houston, TX 77060. If you are a Lion in District 2-S2, I would like you to please share this for me. Your vote will help George spread the word of the power of the Texas Lions Camp and the joy of giving to the camp. Lion President Ervin introduced guest speaker and Past District Governor Noah Speer who proceeded to introduce guest Past District Governor Eddie Risha. 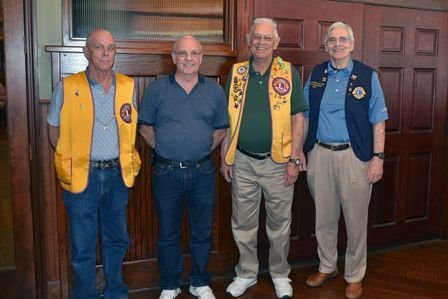 Pictured left-right are Lion President Bob Ervin, PDG Eddie Risha, PDG Noah Speer, and Lion George Shackelford. Photo provided by Lion Al Gerhardt. Lion George Shackelford introduced guest speaker Billy Tidwell, the Chief of Police for the Tomball Police Department (TPD). Pictured left-right are Lion David McClinton, Lion George Shackelford, Tomball Police Chief Billy Tidwell and PDG Danny Zee. Photo provided by Lion Al Gerhardt. Lion Secretary Mike Halbach introduced Guest Speaker Wayne Bergeron, District 2-S2 Alert Chairman and Gulf Coast Regional Coordinator for the Community Action Task Force. Pictured from left to right are Lion Karen Halbach, Community Action Team Board Member Hugh Jones, Wayne Bergeron who is the District 2-S2 Alert Chairman and Gulf Coast Regional Coordinator for the Community Action Task Force and Lion Secretary Mike Halbach. Photo provided by Lion Al Gerhardt. Lion Treasurer Al Gerhardt introduced guest speaker Dr. Penner Schraudenbach, an Urologist with Texas Urology Specialists, with offices in Tomball and the Willowbrook area. 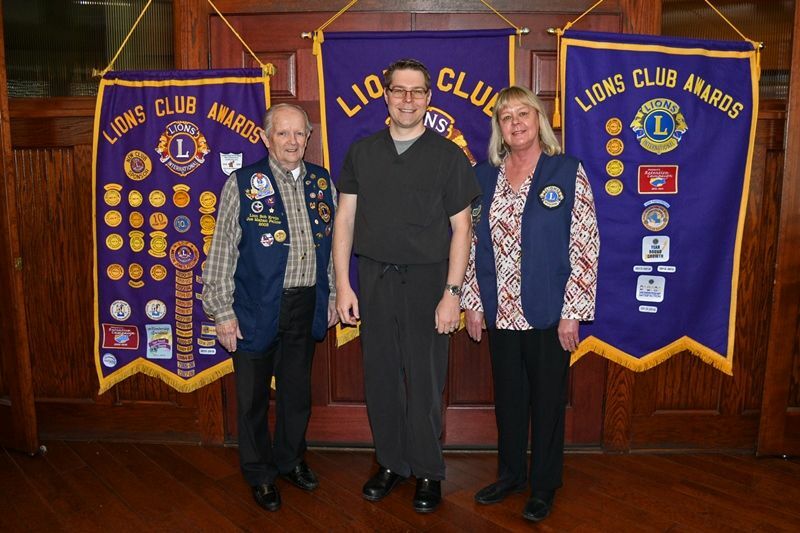 Pictured from left to right are Lion President Bob Ervin, Dr. Penner Schraudenbach, and Lion Karen Halbach. Photo provided by Lion Al Gerhardt. 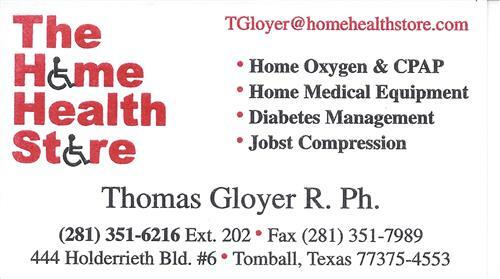 Lion President Ervin introduced Lion Dale McCarty representing Tomball Emergency Assistance Ministries (TEAM). 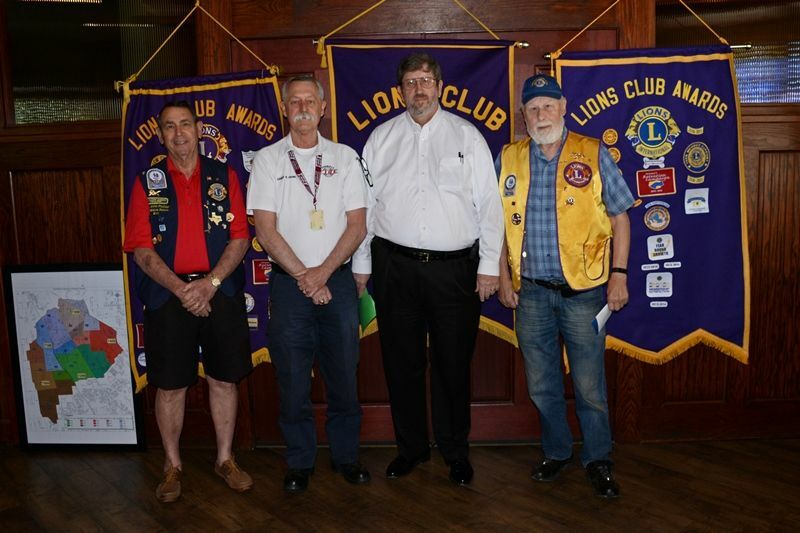 Pictured from left-right are Lion John Seber, Lion Vice President Bubba Hardee, Lion Dale McCarty (TEAM Speaker) and Lion President Bob Ervin. Photo provided by Lion Al Gerhardt. Lion Secretary Halbach introduced guest speaker Scott Perry, District 2-S2 Director Representative for the Texas Lions Camp in Kerrville, Texas. 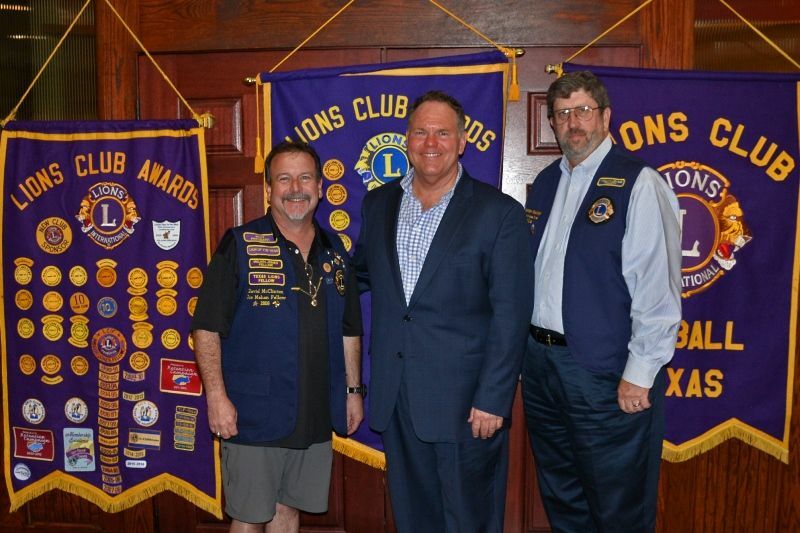 Pictured left-right are Lion John Pettigrew, District 2-S2 Director Representative Scott Perry and Lion Larry Grotts. Photo provided by Lion Al Gerhardt. 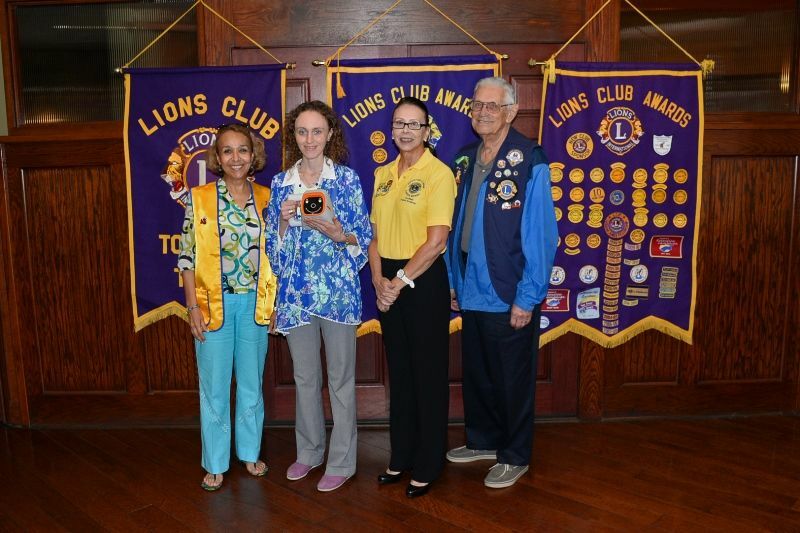 Lion President Ervin introduced our guest speaker Landon Reed, Community Aide for Harris County Precinct 4 Community Assistance Department (CAD). Pictured left-right are Lion Vice President Bubba Hardee, Community Assistance Department Aide Landon Reed, and John Seber. Photo provided by Lion Al Gerhardt. 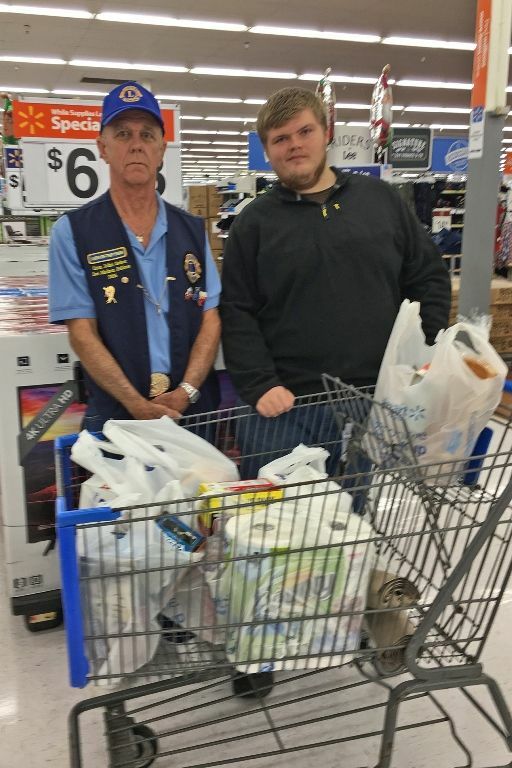 The Tomball Lions Club presented Food Aid for the Thanksgiving Holiday so that Zachary Johnson will be able to have a very Happy & Blessed Thanksgiving. Pictured left to right are Lion Financial Aid Director John Seber and Food Aid recipient Zachary Johnson. Photo provided by Lion Al Gerhardt. The Tomball Lions Club presented Food Aid for the Thanksgiving Holiday so that Nathaniel Jackson will be able to have a very Happy & Blessed Thanksgiving. Pictured from left to right are Lion Financial Aid Director John Seber and Food Aid recipient Nathaniel Jackson. Photo provided by Lion Al Gerhardt. The Tomball Lions Club Community Out-Reach presented Christmas Funding to the Tomball Fire and Police Departments Family Assistance Program. Pictured from left to right are Lion Secretary Mike Halbach, Tomball Fire Chief Randy Parr, Tomball Mayor Gretchen Fagan, Lion Treasurer Al Gerhardt, Tomball Police Chief Billy Tidwell, Tomball City Manager/Lion George Shackelford. Lion Al Gerhardt provided the Web Site with the photo. On Novenber 19, 2016, the city of Tomball held its annual "Holiday Parade". Pictured above is this year's TBLC Float with TBLC members riding on it. Lion President Ervin introduced our guest speaker Amanda J. Seymour who is an international speaker, author and music artist. 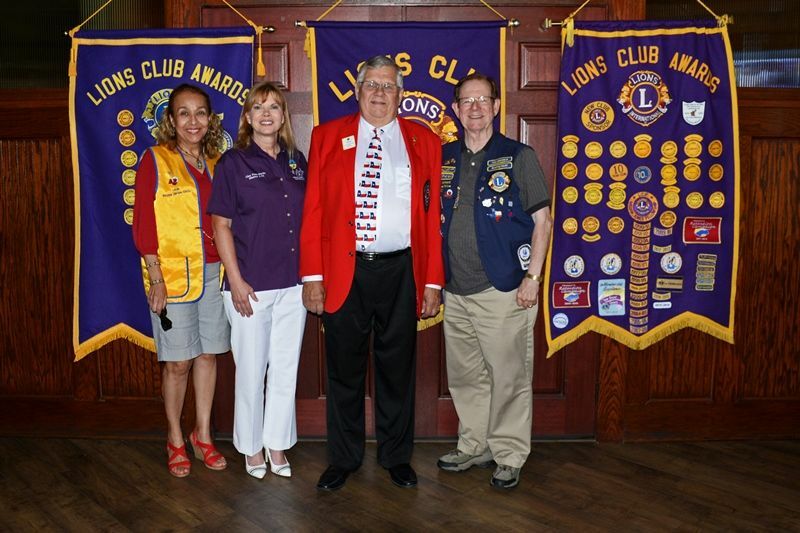 Pictured from left to right are: Lion John Phillips, Lion Reyna-Sirias, speaker Amanda J. Seymour, and Lion Larry Grotts. Photo provided by Lion Mike Halbach. Lion President Ervin introduced our guest speaker Lion District 2-S2 Governor Mark Roth who later introduced First Vice District Governor Betty Ezell. 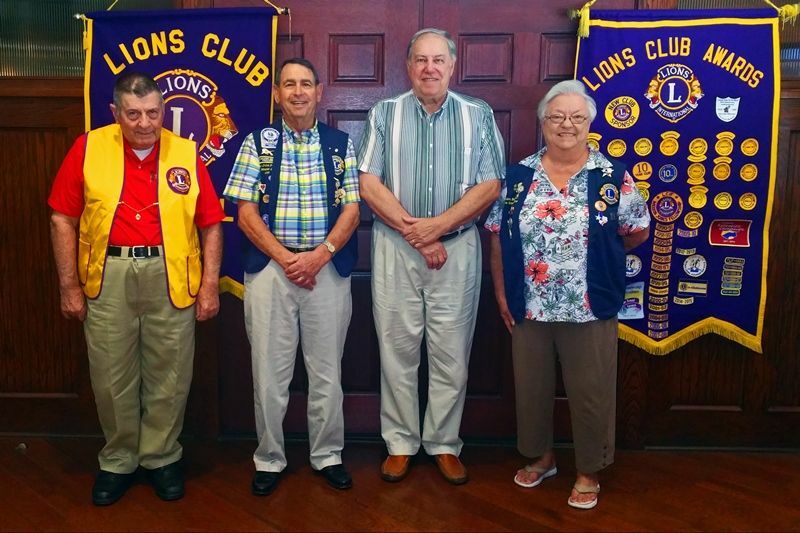 Pictured from left to right are: Lion President Bob Ervin, District 2-S2 Governor Mark Roth, First Vice District Governor Betty Ezell, and Lion Terry Kitchen. Photo provided by Lion Al Gerhardt. 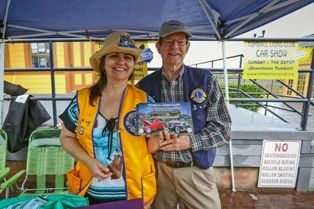 The Tomball Lions Club participated in the annual Tomball Beetles, Brew & BBQ Festival at the Historic Tomball Depot on Saturday, September 24th. 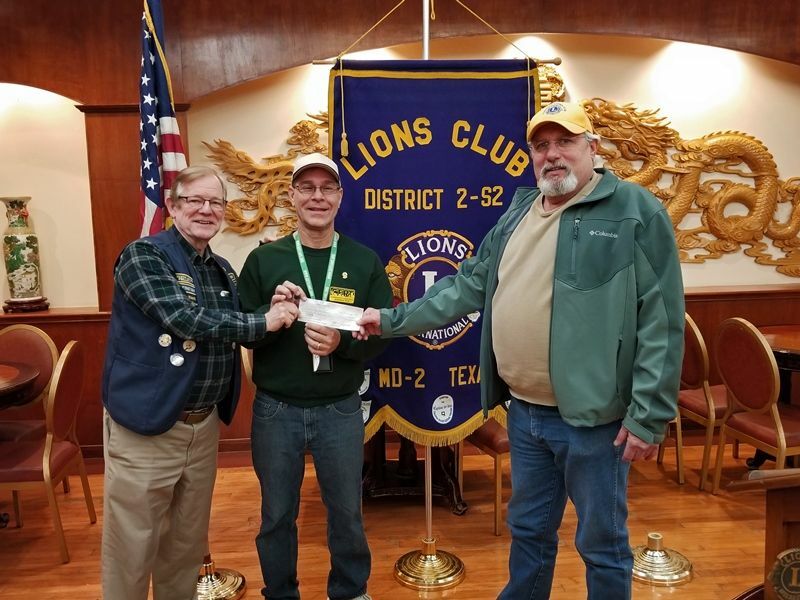 Pictured from left-right are Lion Assistant Treasurer Karen Halbach, TBLC Lion Mascot Alex, and Lion Secretary Mike Halbach. Photo provided by Lion Mike Halbach. Lion Mike Halbach introduced guest speaker Dr. Lee Ann Nutt, President of Lone Star College – Tomball Campus. Pictured from left to right are Lion Ed Mitchell, Dr. Lee Ann Nutt, and Lion Bill Dillon. Photo provided by Lion Mike Halbach. 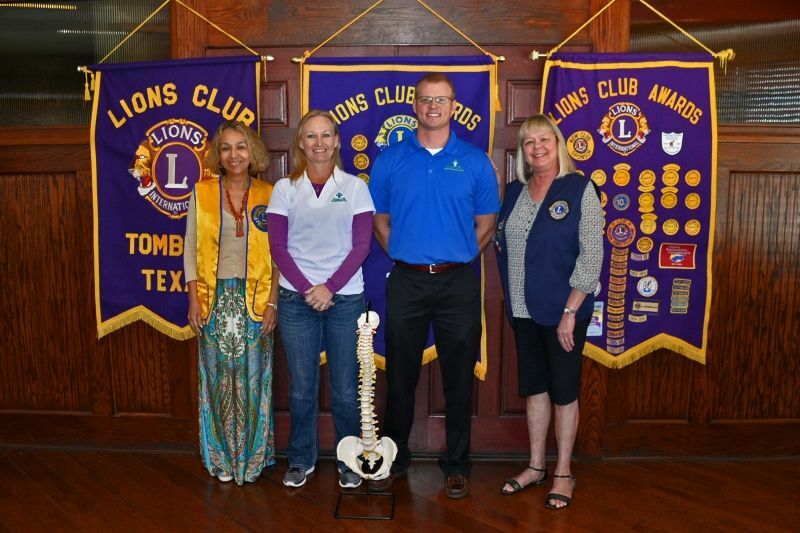 Lion President Bob Ervin introduced guest speaker Dr. Tabor Smith and his Assistant Jenna Glover from Pure Life Chiropractic - Tomball. Pictured from left-right are Lion Reyna Sirias, Dr. Tabor Smith Assistant Jenna Glover, Dr. Tabor Smith, and Lion Assistant Treasurer Karen Halbach. Story provided by Lion Al Gerhardt. 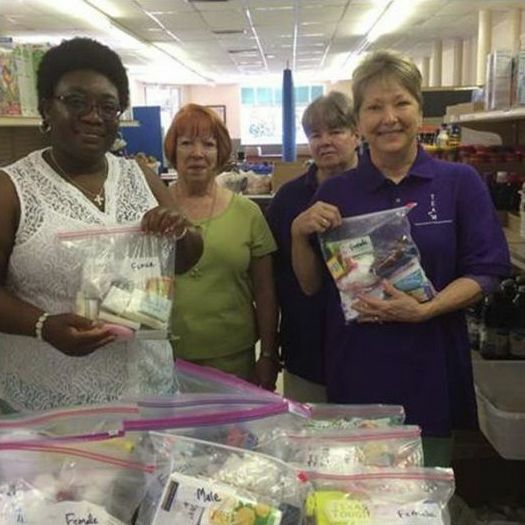 On 8/25/2016, TBLC worked hand in hand with members of Tomball Emergency Assistance Ministries (TEAM). Pictured from the left are TBLC Board Member Dale McCarty, Center TEAM Director Becky Loving, Right TEAM Board President Debbie Miles, and TEAM Workers in the background. Lion President Bob Ervin introduced guest speaker Tomball Mayor Gretchen Fagan. 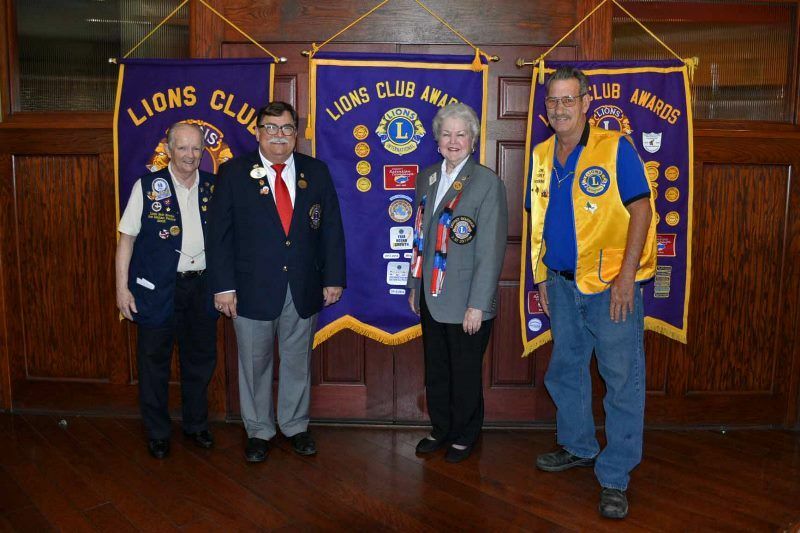 Pictured from left to right are Lion John Phillips, Lion Vice-President Bubba Hardee, Tomball Mayor Gretchen Fagan, Karen Halbach, and Lions President Bob Ervin. Photo provided by Lion Al Gerhardt. Lion President Bob Ervin introduced guest speaker Tomball Mayor Gretchen Fagan. 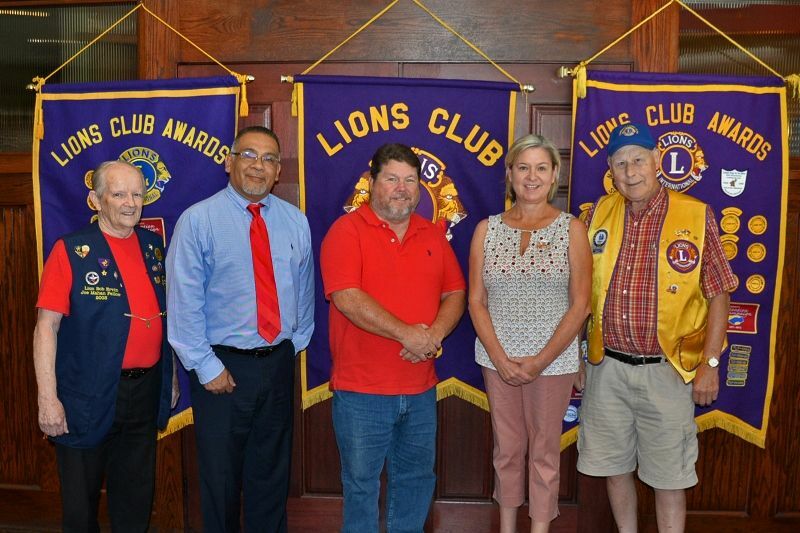 Pictured from left to right are Lion President Bob Ervin & guest Javier Serrato, Lion Allen Eckhardt's guest David Cochran, Tomball Mayor Gretchen Fagan and Lion Allen Eckhardt. Photo provided by Lion Al Gerhardt. 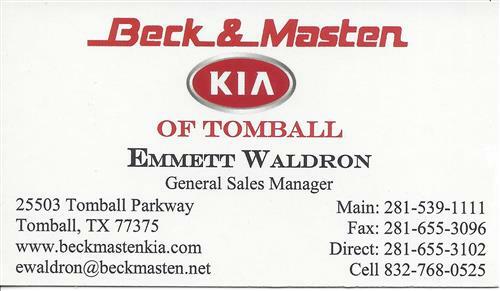 Here is the Tomball Lions Club working hand and hand with T.E.A.M. in Tomball helping the families in need in the Tomball Community. 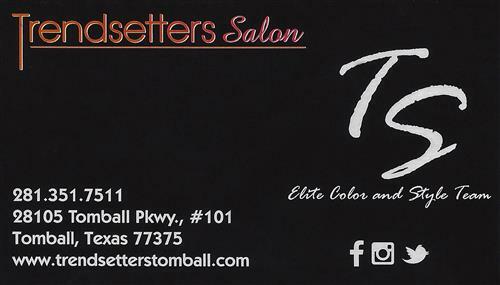 For more information, see the TEAM web site at http://www.teamtomball.com/. Lion President Bob Ervin introduced guest speaker Lion Sam Thomas, District 2-S2 Global Membership Team Coordinator. 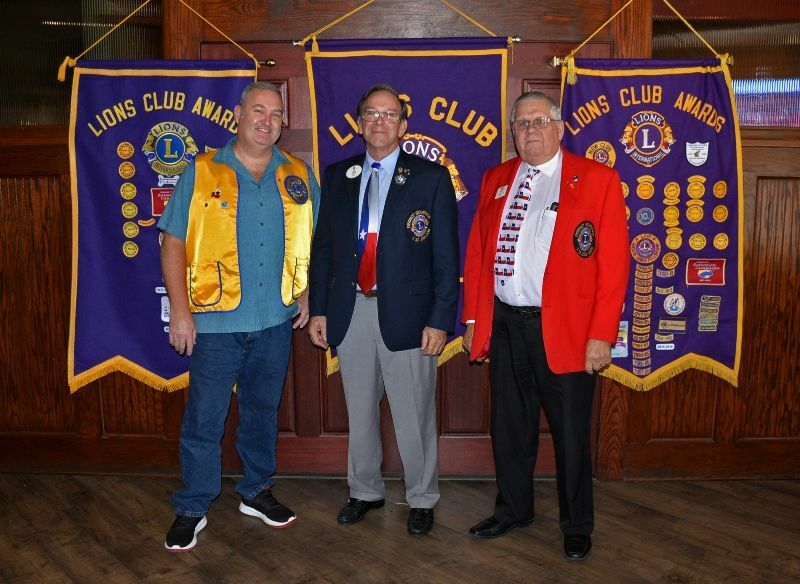 Pictured left-right Lion Mike Halbach, District 2-S2 Global Membership Team Coordinator Lion Sam Thomas, and Lions President Bob Ervin. Photo provided by Lion Al Gerhardt. The Tomball Lions Club (TBLC) participated in the Annual Tomball Chamber of Commerce Tomball Night on the first Friday of August (08/05/16). 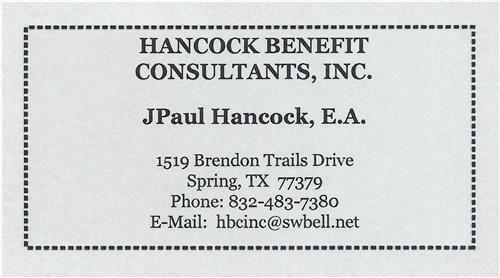 The TBLC sells BBQ from our Pit and also sells Raffle Tickets to raise funds for families in great need in the Tomball Area. Pictured left-right Lion Bubba Hardee, Lion Ron Luedke, Lion John Seber, Lion Ken Walters, Lion George Shackelford, and Lion Bob Ervin. Photo provided by Lion Al Gerhardt. Tomball Chamber President Bruce Hillegeist congratulated TOMAGWA (Tomball, Magnolia, & Waller Medical Clinic) Director Lion Judy Deyo who served as Director of TOMAGWA since it started 21 years ago. 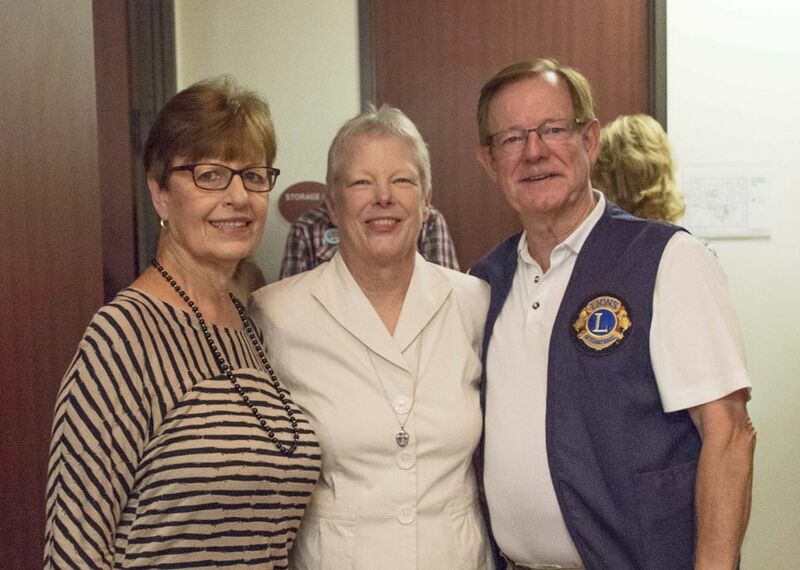 Pictured left-right are Lion Al Gerhardt's wife Eva Gerhardt, Lion Judy Deyo, and Lion Treasurer Al Gerhardt. Photo provided by Lion Al Gerhardt. Lion President Bob Ervin introduced guest speakers Wayne Bergeron & Hugh Jones of District 2-S2 Community Action Force. 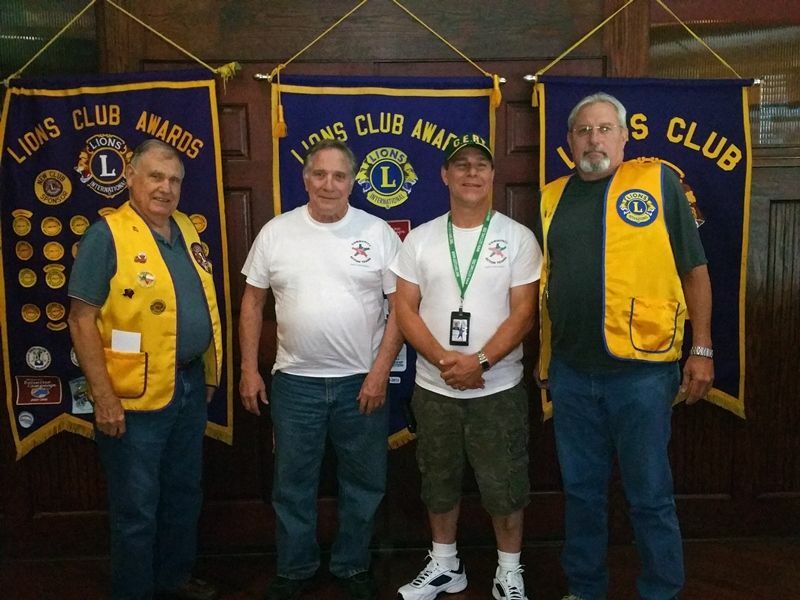 Pictured left-right are Lion John Pettigrew, Community Action Force Coordinators Wayne Bergeron & Hugh Jones, Lions Vice President Bubba Hardee. Photo provided by Lion Al Gerhardt. Lion Bob Ervin introduced Karen Berry and Christy Rudolph of Lions Kid Sight. 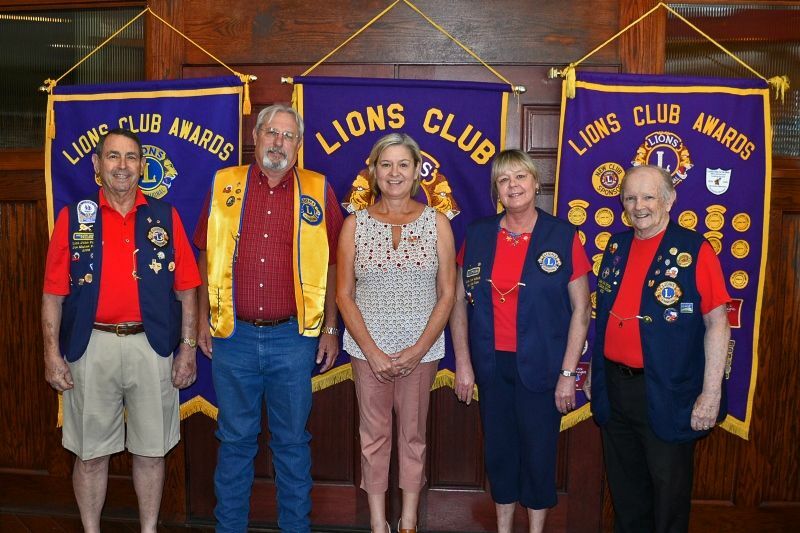 Pictured left-right are Lion Reyna Siras, Lion Kid Sight Rep. Christy Rudolph & Speaker Karen Berry, and Past District Governor Danny Zitterich (Zee). Photo provided by Lion Al Gerhardt. The Tomball Lions Club is so blessed to be able to presents three $1,000 Scholarships to the camp counselors chosen by the Texas Lions Camp Staff each year. The scholarships are made to the college of their choice and their family. This ensures that the scholarship will only be used for college tuition. 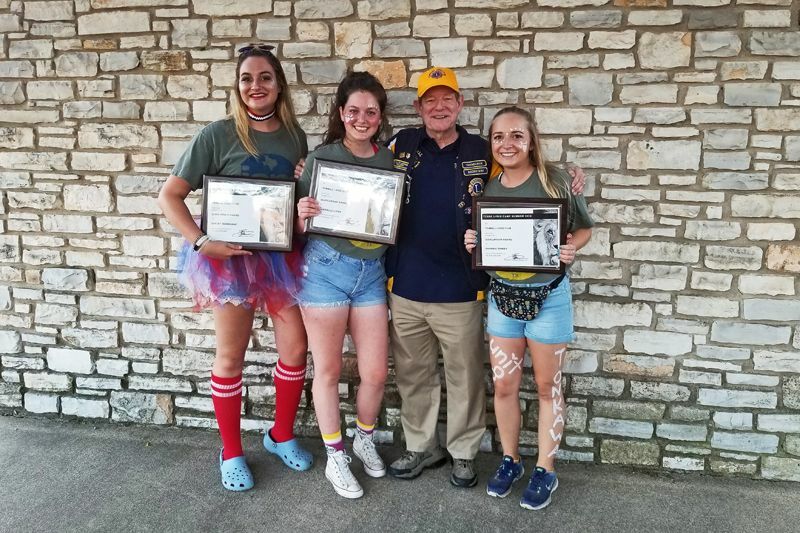 Pictured left-right are TBLC Lion John Phillips, Texas Lions Camp Counselors Ashley Long, Autumn Castro, and Ali Hamlin. Lion Photographer Al Gerhardt provided the photo. 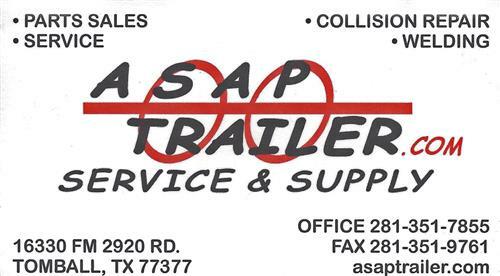 The Tomball Lions Club is so blessed to have the Tomball Town Center Vison Works assisting them in gathering glasses to be recycled in the Tomball area. 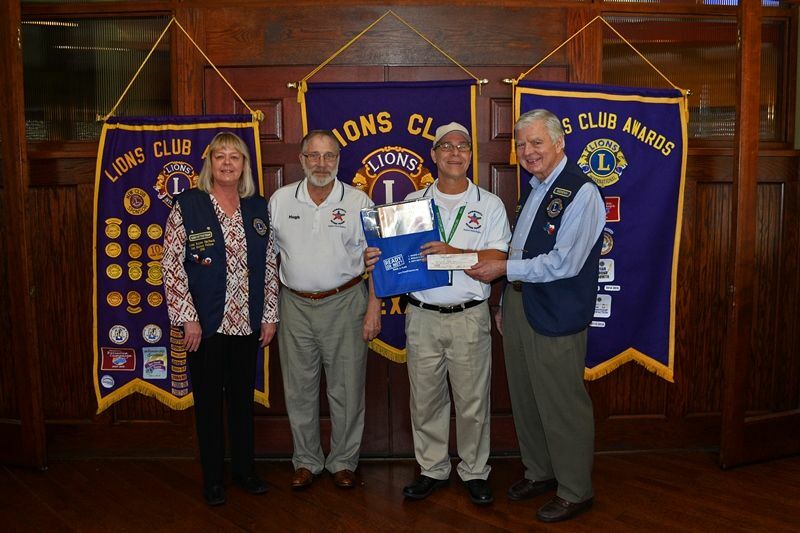 The Tomball Lions Club presented a plaque to the Tomball Vision Works Center in appreciation of their participation in the Lions Recycle Eye Glass Program. 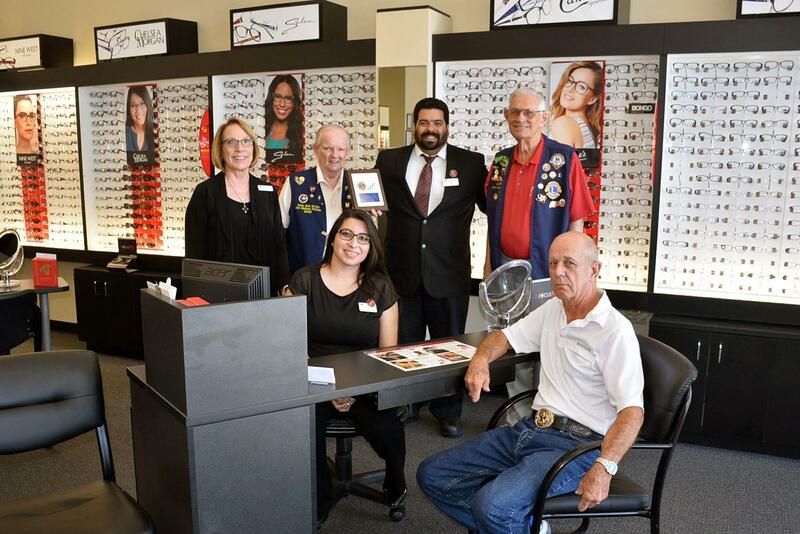 Pictured left-right are Vison Work Staff Eye Glass Specialist Sally Griffith, Lion President Bob Ervin, Vison Work Staff Eye Glass Specialist Lillian Ruiz, Vison Work Manager Jose Palermo, Lion Past District Governor Daniel Zitterich, and Lion John Seber. Photo provided by Lion Photographer Al Gerhardt. Lion President Jerome Teichmiller introduced District 2-S2 Mark Roth to install the 2016-2017 Officers, Directors and New Members. Pictured left-right Speaker Lion Sam Thomas, Dist. 2-S2 Governor Mark Roth, TBLC Lions Bob Ervin, John Pettigrew, Bill Dillion, Al Gerhardt, John Phillips, Bubba Hardee, PDG Danny Zee, John Seber, and Mike Halbach. Photo provided by Lion Al Gerhardt. Lion Bob Ervin then introduced Bill Willets, Editor and Past President of the Gulf Coast Chapter of the National Railway Historical Society, Inc. Pictured left-right Lion Bill Dillion, Speaker Bill Willets, Editor and Past President of the Gulf Coast Chapter of the National Railway Historical Society, Inc., and Lion Bubba Hardee. Photo provided by Lion Al Gerhardt. 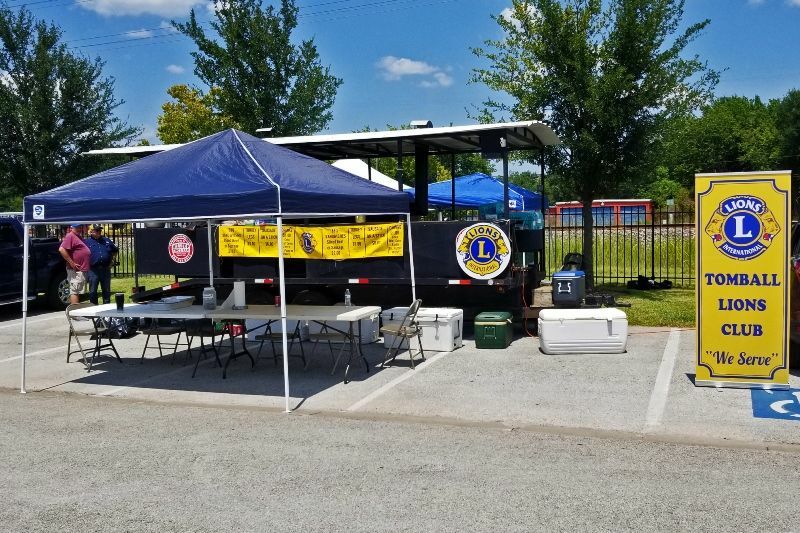 The Tomball Lions Club is so blessed to have couples like Brian & Judy Sabin who helped perform the necessary repairs on the Tomball Lions Club Barbeque Pit. 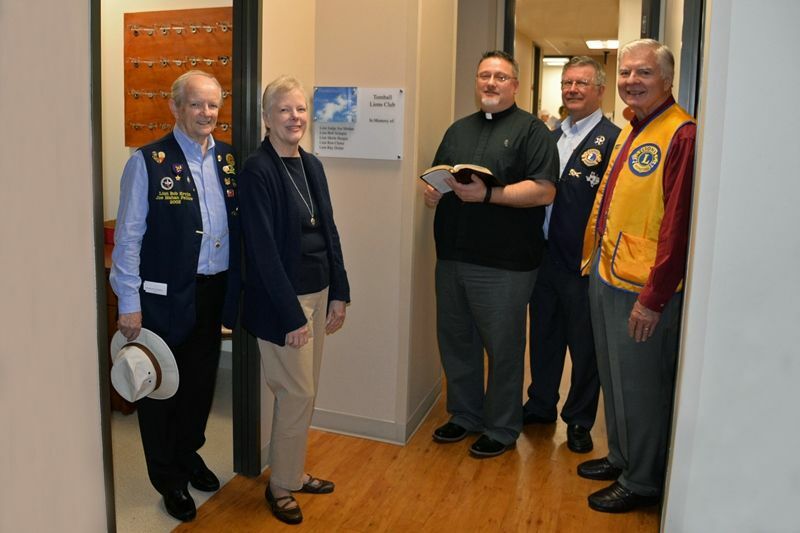 Executive Director & Lion Judy Deyo welcomed the Tomball Lions Club members to the Vision Care Clinic for the dedication for deceased lion members. Pictured left to right are Lions Vice-President Robert “Bob” Ervin, Executive Director & Lion Judy Deyo-Rn, Senior Development Director Rev. Steven G. Lightfoot – Pastor, Lion President Jerome Teichmiller, and Lion Secretary Elect Mike Halbach. Photo provided by Lion Al Gerhardt. TBLC Treasurer Al Gerhardt and Lion John Seber purchased clothing, medical needs, and foods on 05/16/16 for the Nyoka Rosignon family. Her losses came from the flooding of Greens Bayou into her home and cars. 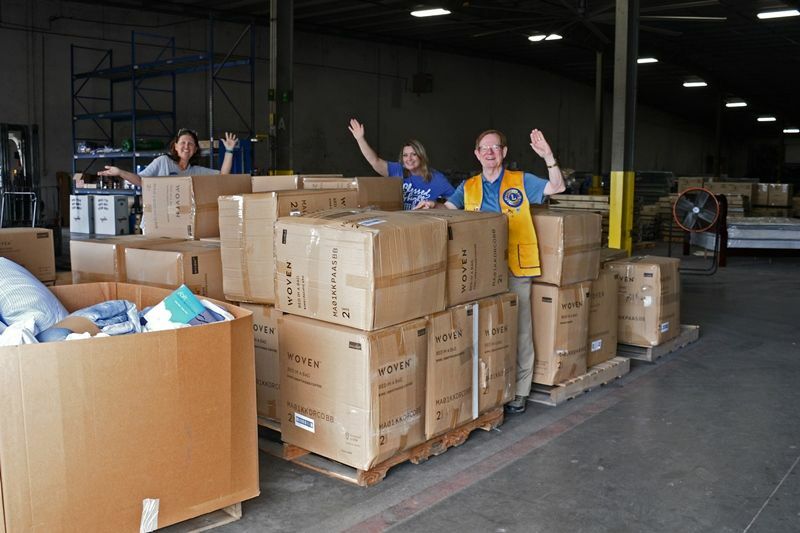 The items were purchased using the Flood/Tornado Disaster Grant funds to District 2-S2 from the LCIF – Lions Club International Foundation Humanitarian Relief Fund. Pictured from left to right are Lion John Seber, Susan Michlik (who brought Nickii to the TBLC), Nyoka Rosignon, Walmart Mgr. Kimberly O'Riley, and Lions Treasurer Al Gerhardt. Photo by Al Gerhardt. 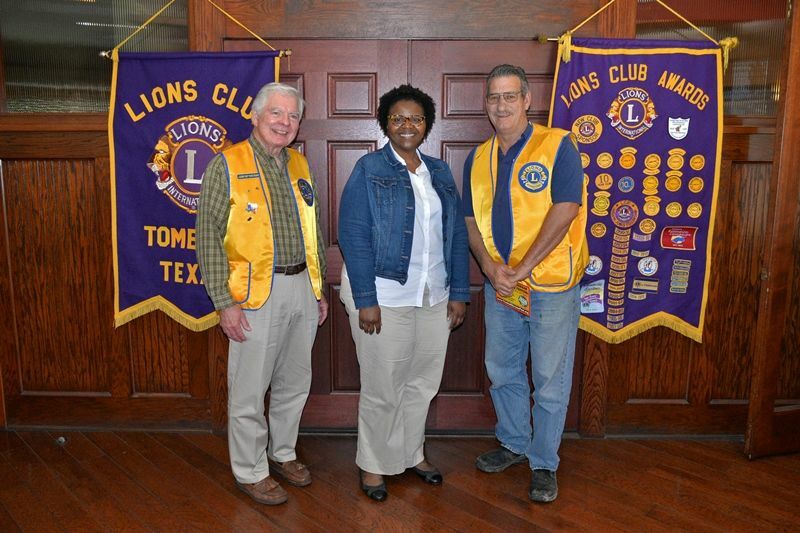 TBLC Lion President Teichmiller welcomed new TBLC members Dale A. McCarty and Edward W. Mitchell. 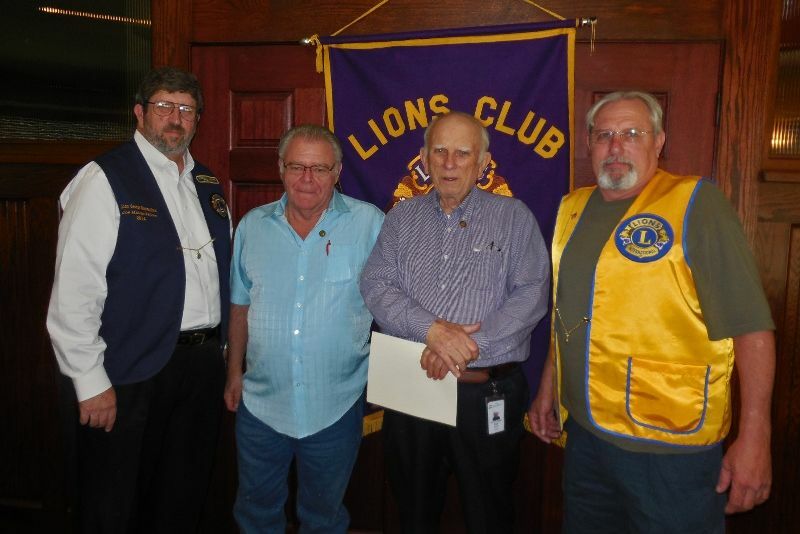 Pictured left-right are Secretary George Shackelford, New Lions Member Edward “Ed” W. Mitchell & Dale A. McCarty, and Lion Robert “Bubba” Hardee. Photo provided by Lion Al Gerhardt. 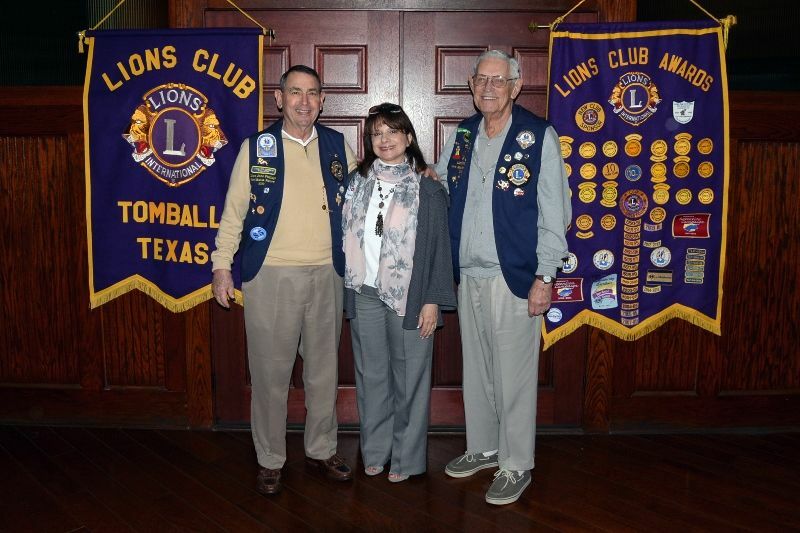 TBLC Lion Mike Halbach introduced Janisue Rigel, President, and Davena Liepman, Chaplain, with the United States Daughters of 1812, Texas Society, Thomas Bay Chapter who gave recognition and special thanks to Tomball Lions Club members who served in the military during the Vietnam War Era. 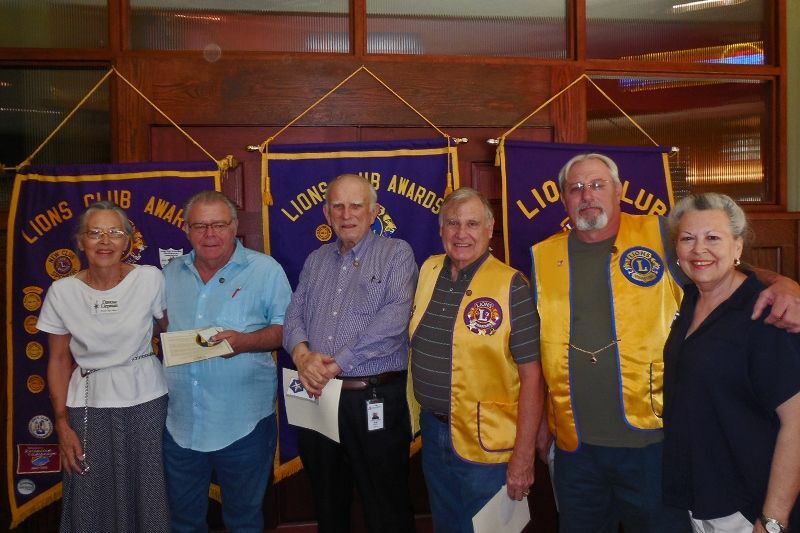 Pictured left-right Chaplain Davena Liepman, New Lion Members Edward (Ed) & Dale McCarty, Lions John Pettigrew & Robert “Bubba” Hardee, and President Janisue Rigel. Photo provided by Lion Al Gerhardt. 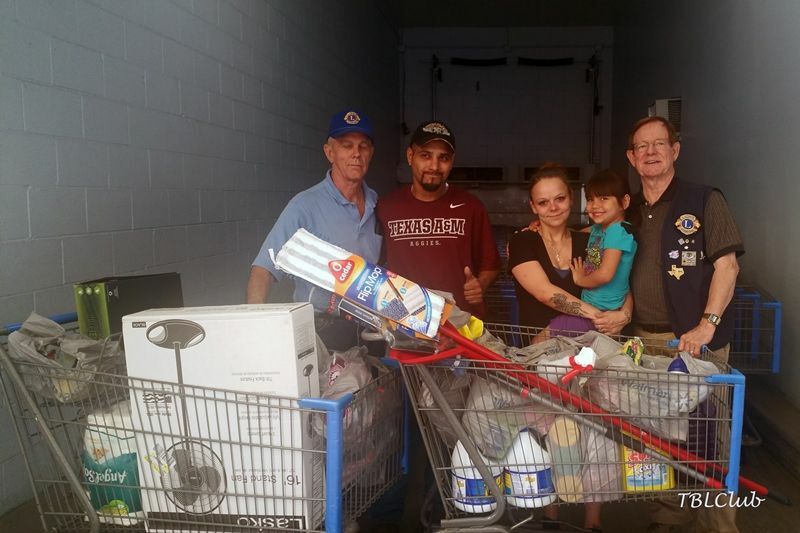 TBLC Treasurer Al Gerhardt and Lion John Seber purchased cleaning supplies, medical needs, clothing and baby supplies for Jesse, Tabatha, and daughter Alexis Delira on 05/03/16. 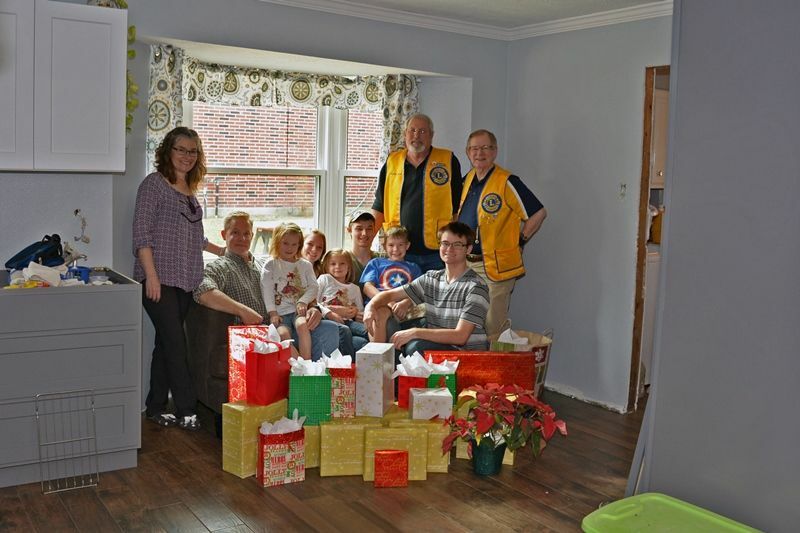 The items were purchased using the Flood/Tornado Disaster Grant funds to District 2-S2 from the LCIF – Lions Club International Foundation Humanitarian Relief Fund. Pictured left-right Lion John Seber, Jesse, Tabatha, Alexis Delira, and Treasurer Al Gerhardt. Photo provided by Lion Al Gerhardt. 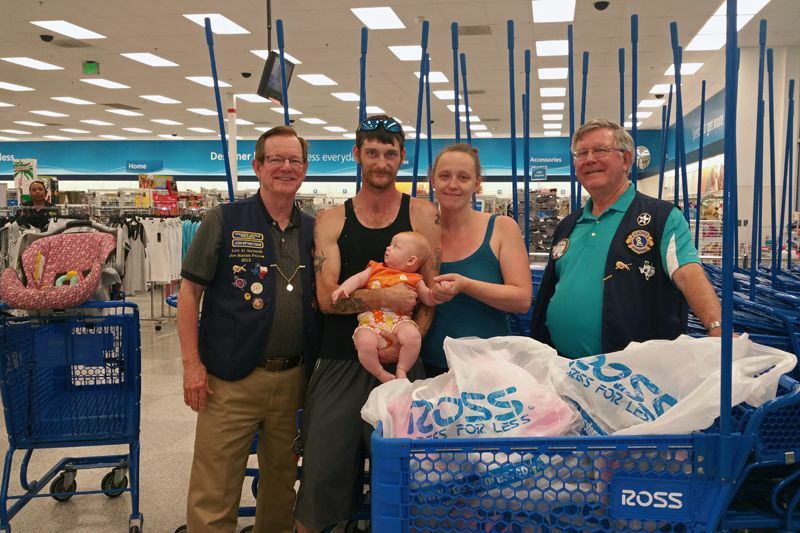 TBLC President Jerome Teichmiller and Treasurer Al Gerhardt purchased clothing and baby supplies for the Van Richardson & Destiny Edmondson Family. 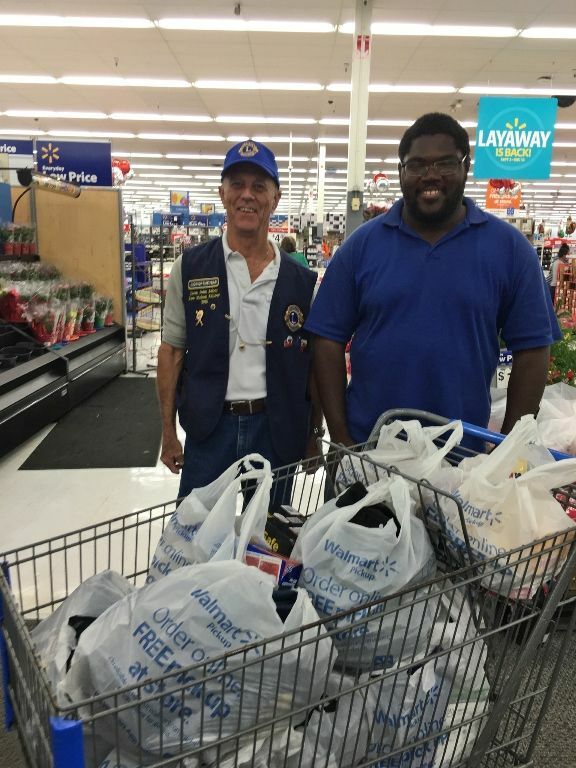 The items were purchased using the District 2-S2 Flood/Tornado Disaster Grant funds from the LCIF – Lions Club International Foundation Humanitarian Relief Fund. Pictured left-right are Lion Treasurer Al Gerhardt, Van Richardson, Baby, Destiny Edmondson, and Lion President Jerome Teichmiller. Photo provided by Lion Al Gerhardt. 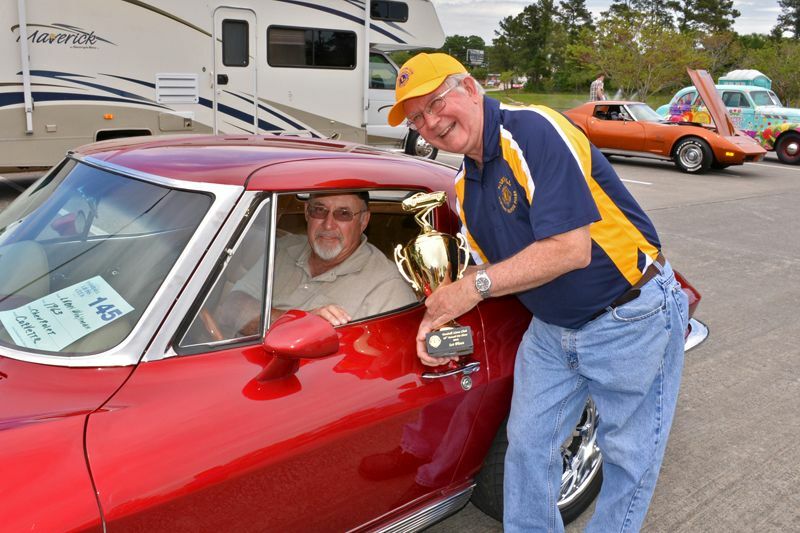 On April 9, 2016, TBLC Lion President Jerome Teichmiller did the trophy presentation to the 1st place winner Leon Wehltman at the Tomball Lions Club 2016 22nd Annual Car Show. 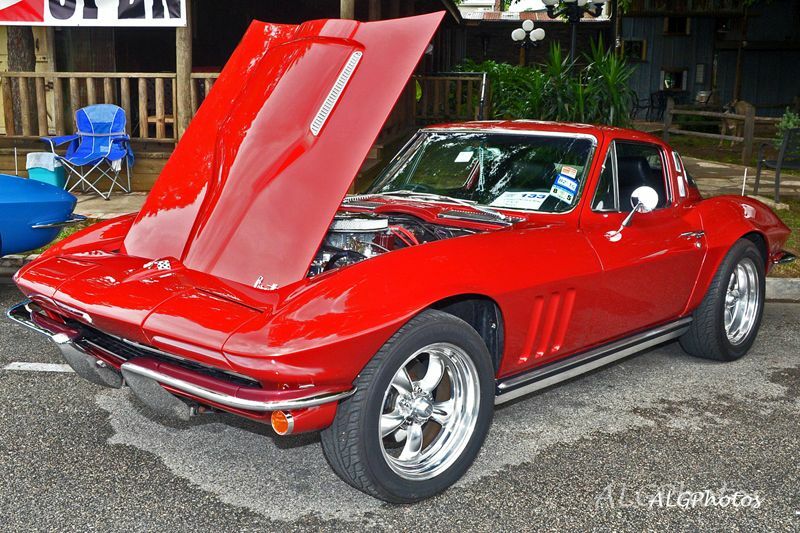 His entry was a 1963 Red Corvette. 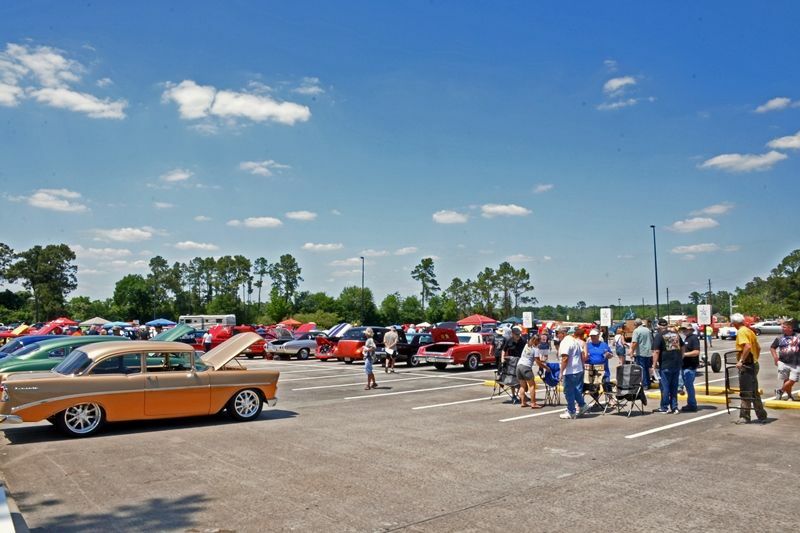 The Car Show was a huge success with 120 entries and approximately 1,000 people in attendance. Pictured left-right are 1st Place winner – Leon Wehltman and Lion President Jerome Teichmiller. Photo provided by Lion Al Gerhardt. TBLC Lion Mike Halbach introduced guest speakers Darleane Warren, Community Relations Coordinator, for the Lions Eye Bank of Texas at Baylor College of Medicine. 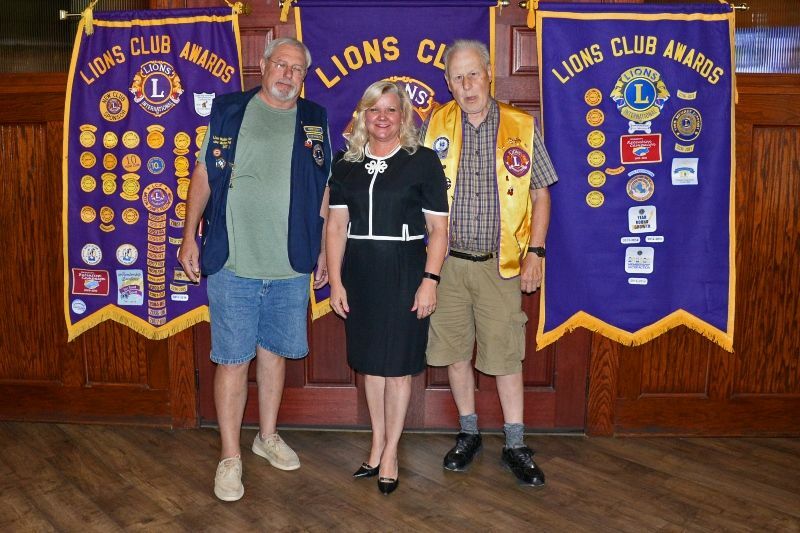 Pictured left-right are Lion Mike Halbach, Speakers Relations Coordinator Darleane Warren, and Lion Terry Kitchens. Photo provided by Lion Al Gerhardt. TBLC Lion Mike Halbach introduced guest speakers Becky Loving, Director and Shirley Leigh, Board Member with Tomball Emergency Assistance Ministries (TEAM). 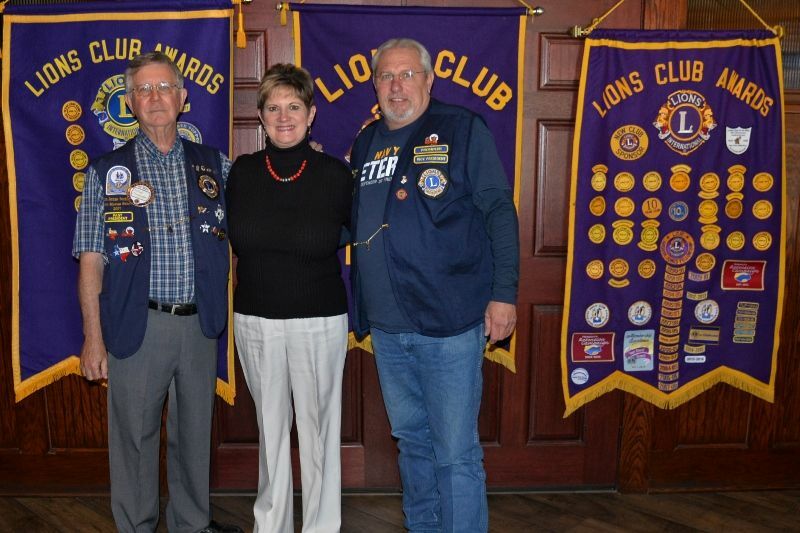 Pictured left-right Lion Larry Grotts, Speakers Director Becky Loving, Board Member Shirley Leigh, and Lion President Jerome Teichmiller. Photo provided by Lion Al Gerhardt. TBLC Lion Vice President Bob Ervin welcomed guest speakers Richard Gatewood and Camille Hamilton who are Committee Members for Families Feeding Families. 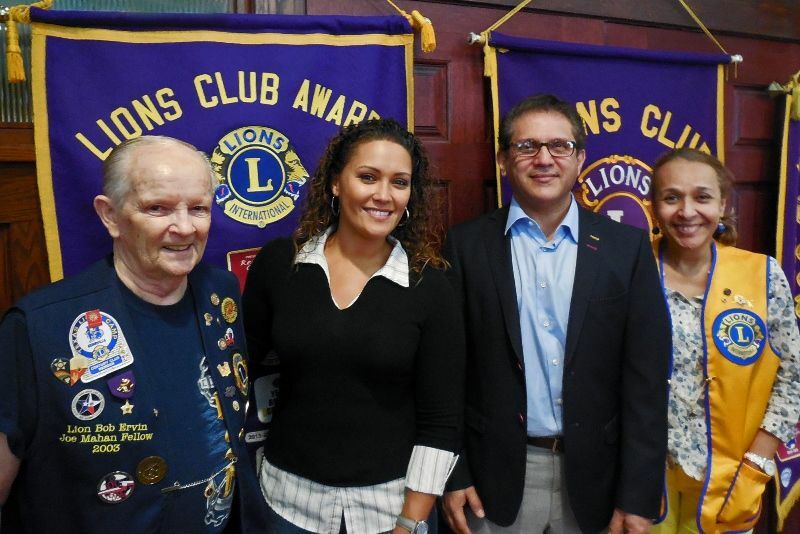 Pictured left-right are speakers Richard Gatewood and Camille Hamilton from Families Feeding Families, Corrine Rodriquez of the Houston Chronicle, Noah Speer – Lions District 2S-2 Governor, and Lion VP Bob Ervin. Photo provided by Lion Al Gerhardt. TBLC Lion Mike Halbach welcomed guest speaker Mr. Pat Kotal concerning Type 1 Diabetes. Pictured left-right are Lion Jerome Teichmiller, speaker Pat Kotal, and Lion Terry Kitchens. Photo provided by Lion Al Gerhardt. 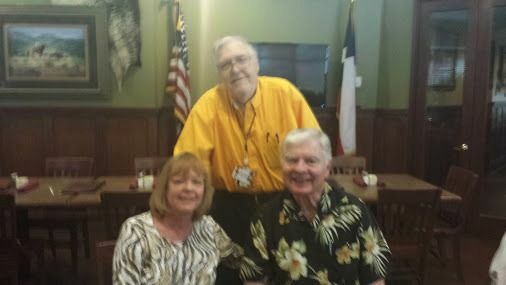 TBLC Lion Vice-President Bob Ervin welcomed guest speaker Ms. Carol Brace to the 2nd Friday meeting at Pecos Grilling Company. Pictured left-right are Lion John Phillips, UHD Carol Brace, and Lion Danny Zee. Photo provided by Lion Al Gerhardt. TBLC Lion President Jerome Teichmiller welcomed guest Lion Neil MacDonald, Christmas Cheer Project Chairperson to the 2nd Friday meeting at Pecos Grilling Company. Pictured from left to right are Lion Allen Eckhardt, Lion Neil MacDonald, and Lion Larry Grotts. Photo provided by Lion Al Gerhardt. TBLC Lion Treasurer Al Gerhardt and Lion John Seber met with Tomagwa HealthCare Ministries President Judy Deyo and her staff. 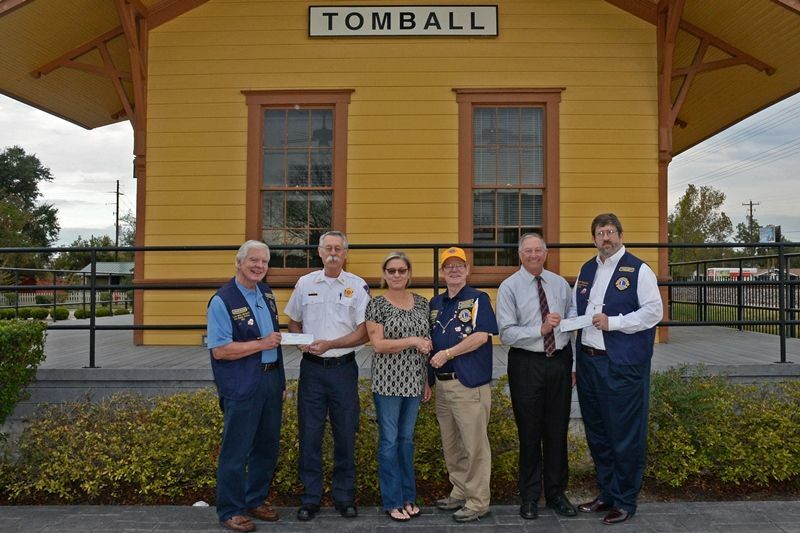 The Tomball Lions Club made their annual support presentation of $1500 to Tomagwa. Pictured left-right are Tomagwa staff Robert Bernardini, Lilly Hinojosa, Lion John Seber, Tomagwa President Judy Deyo, Lion Treasurer Al Gerhardt, Tomagwa Tami Sabey, Yessica Avila and Lorie Johns. Photo provided by Lion Al Gerhardt. TBLC Lion President Jerome Teichmiller welcomed guest Tomball Fire Chief Randy Parr to the 2nd Friday meeting at Pecos Grilling Company. Pictured left-right are Lion Debbie Gray, Fire Chief Randy Parr, and Lion David Paulson. Photo provided by Lion Al Gerhardt. 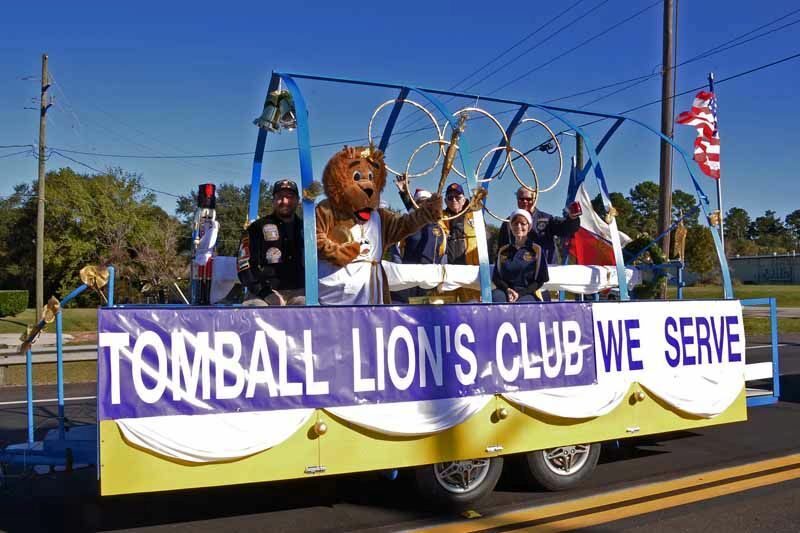 The Tomball Lions Club participated in the 50 Annual Tomball Chamber Parade on November 21, 2015. Our float shows our Message & Motto "WE SERVE". Pictured on the float from left to right are: Lion (Theresa Ross), Pastor Jerome Teichmiller, Eva Gerhardt and Mike Halbach. TBLC Lion President Jerome Teichmiller welcomed guest Lion Sheila Roush, Zone Chairperson for District 2-S2 Zone L-2 and current membership chair at the Klein Lions Club to the 2nd Friday meeting at Pecos Grilling Company. 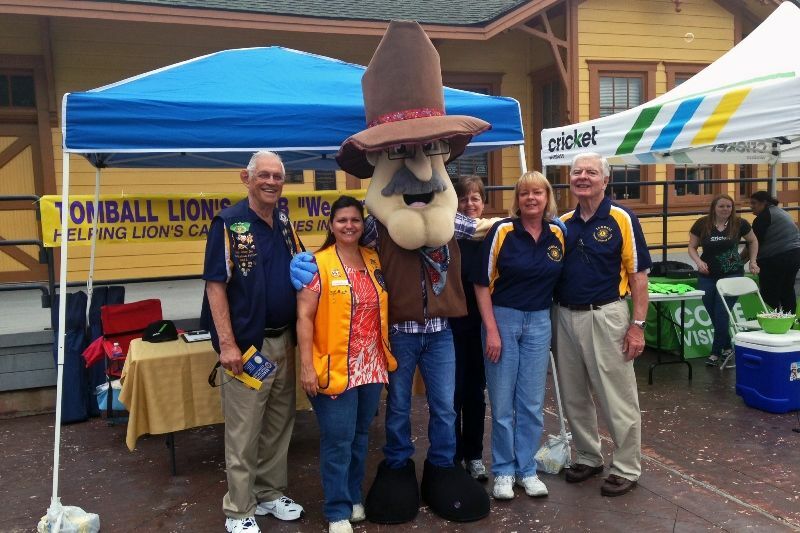 Pictured left-right are: Lion PDG Danny Zee, Lion Zone Chairperson Sheila Roush, Lion John Seber and Lion Bob Ervin. Photo provided by Lion Al Gerhardt. TBLC Lion President Jerome Teichmiller welcomed guest Terry Kitchens to the 2nd Friday meeting at Pecos Grilling Company. Pictured left-right are: Guest Terry Kitchens and Lion John Seber. Photo provided by Lion Al Gerhardt. TBLC Lion Vice President Bob Ervin welcomed guest speaker Bruce Hillegeist, President of the Greater Tomball Area Chamber of Commerce to the 2nd Friday meeting at Pecos Grilling Company. 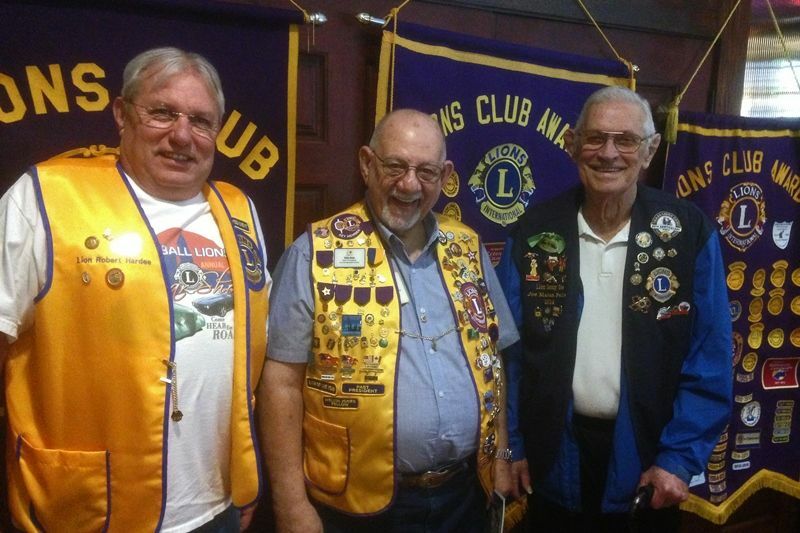 Pictured left-right are Lion Member Allen Eckhardt, Bruce Hillegeist, and Lion John Phillips. Photo provided by Lion Al Gerhardt. The TBLC Lion John Phillips introduced guest speaker Dr. William Dillon, whose wife was a Donated Cornea Transplant recipient from the Texas Lions Eye Bank. 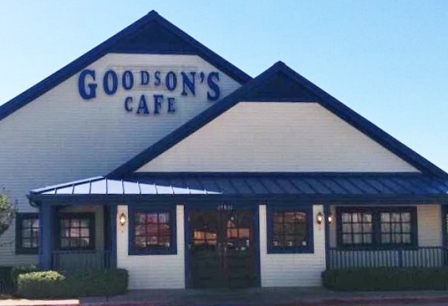 Dr. Dillon told his wife's story at the 4th Friday meeting at Pecos Grilling Company. Dr. Dillon said the transplant was performed by the Baylor College of Medicine. Pictured left to right are Lion Bob Boscarato, Lion John Phillips, Dr. William Dillon, and Lion Naomi Kleb. Photo provided by Club Treasurer, Al Gerhardt. The TBLC Treasurer Al Gerhardt introduced guest speaker Dr. Lee Ann Nutt, President of Lone Star College Tomball to the 4th Friday meeting at Pecos Grilling Company. Dr. Nutt described the breadth of Lone Star College's impact on the Houston Region and specifically some of the programs and projects unique to the Tomball campus. Pictured left to right are Lion Jim Nutt, Speaker Dr. Lee Ann Nutt, and Lion Karen Halbach. Photo provided by Lion Al Gerhardt. 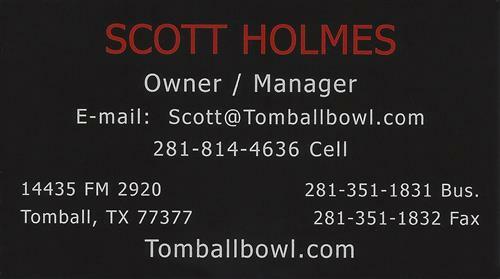 The Tomball Lions Club sponsored Eric Light at the Texas Lions Camp in Kerrville, Texas this year. He spent a week with other diabetic children at the Camp where children from all over Texas attend. He and his mother Jeanice Light were asked to give an update to the Tomball Lions Club. Pictured left-right are Jeanice and Eric Light. Photo provided by Lion John Phillips. The TBLC Lion Mike Halback introduced guest speaker Dr. Penner Schraudenbach, M.D., Adult and Pediatric Urologist of the Texas Urology Specialists and a TOMAGWA volunteer, who was assisted by TOMAGWA President and Lion Judy Deyo at the 2nd Friday meeting at Pecos Grilling Company. Pictured left-right are Lion Judy Deyo, Dr. Penner Schraudenbach, M.D. and Lion Vice President Bob Ervin. Photo provided by Lion Mike Halbach. 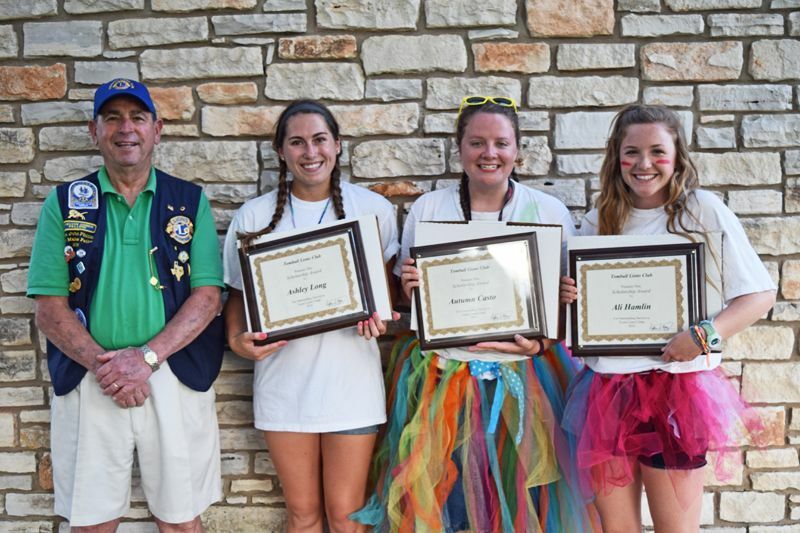 TBLC Lion Camp Representative John Phillips presented three (3) $1,000 Scholarships to 3 deserving Texas Lion’s Camp Counselors. 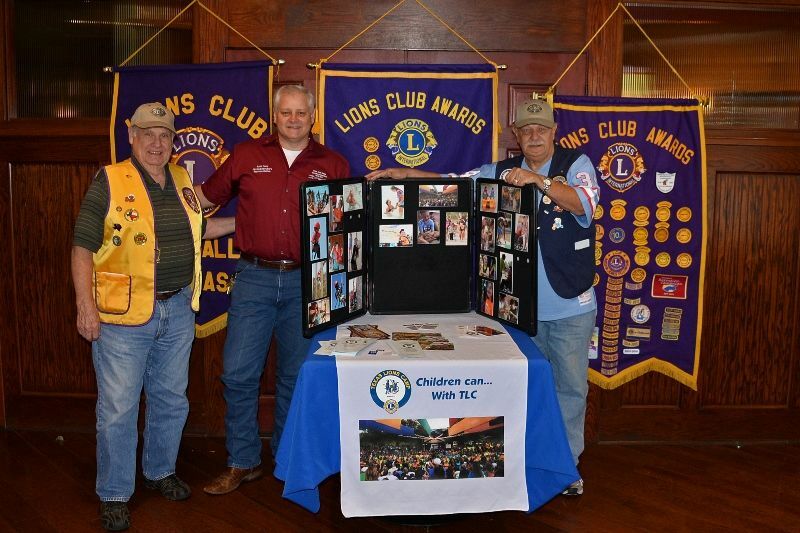 Pictured Left-Right are the 2015 Tomball Lions Club member and Texas Lions Camp Representative John Phillips, and Texas Lion Camp Director, Stephen Mabry. Photo provided by Lion Al Gerhardt. TBLC Lion President Jerome Teichmiller welcomed the members and guest speaker Betty Ezell, Eye Bank of Texas Representative to the 2015 Installation Banquet at Pecos Grilling Company. 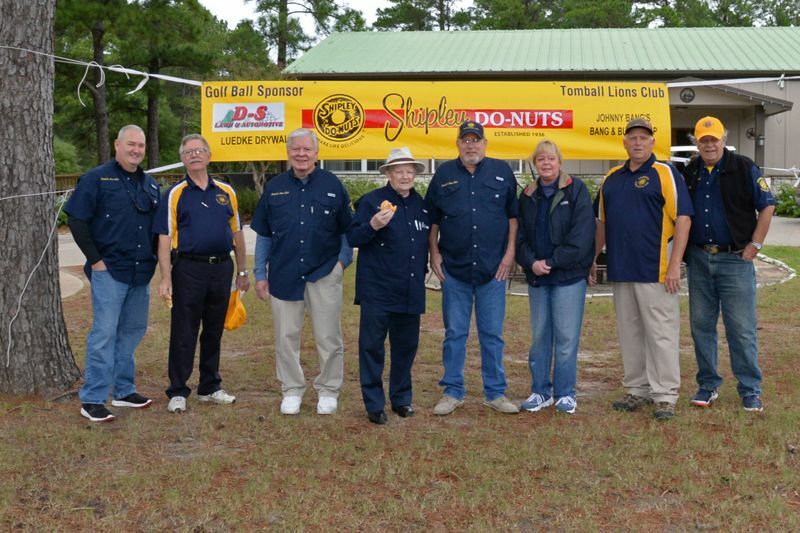 Pictured 2015-2016 Board Members left-right Treasure – Al Gerhardt, Vice President - Bob Ervin, Lion Tamer - John Seber, President - Jerome Teichmiller, Tail Twister - John Phillips, and Secretary - George Shackelford. Photo by Lion Al Gerhardt. TBLC Lion Vice President Bob Erwin welcomed guest speaker Bruce Hillegeist, President of the Greater Tomball Area Chamber of Commerce, to the 2nd Friday meeting at Pecos Grilling Company. 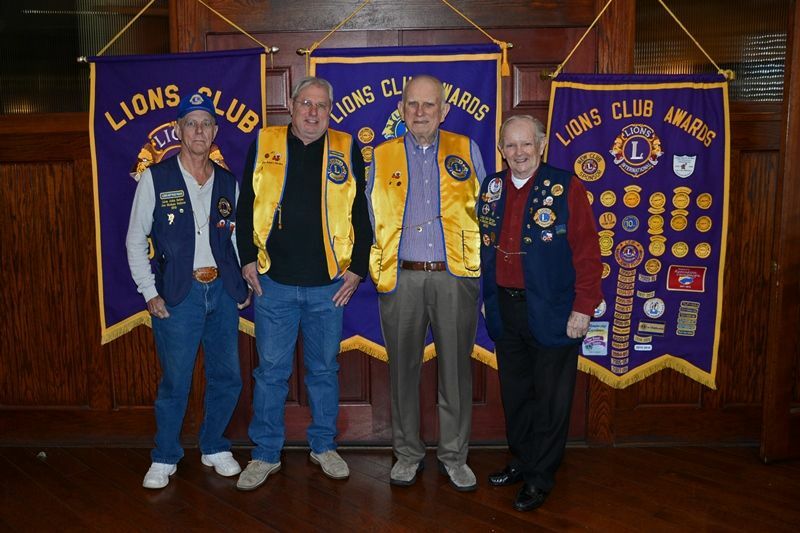 Pictured from left-right are Lion Member Allen Eckhardt, Bruce Hillegeist, Lion John Phillips, and Lion Member John Seber. Photo provided by Lion Al Gerhardt. 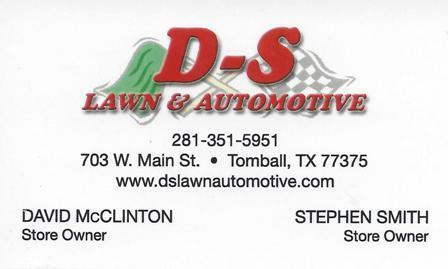 The Tomball Lions Club held its 21st Annual Car Show at the Depot in Tomball Texas. It was a huge success even with the rain. 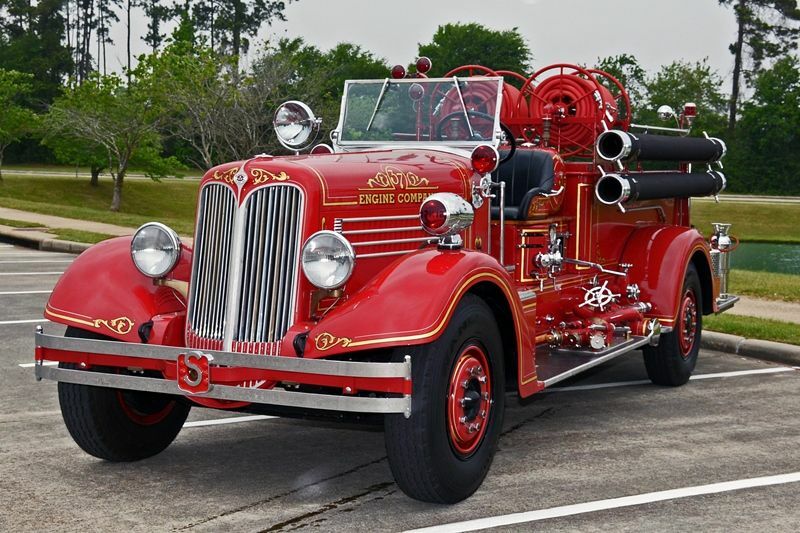 We want to thank all of the owners for bringing their antique vehicles and a special thank you to Tomball Mayor Gretchen Fagan for selecting the Mayors Trophy Award. A special thanks to all of the people that came and braved the rain to make the show a huge success. Pictured is the First Place Winner and the Mayor’s Choice Award. Photos provided by Lion Al Gerhardt. 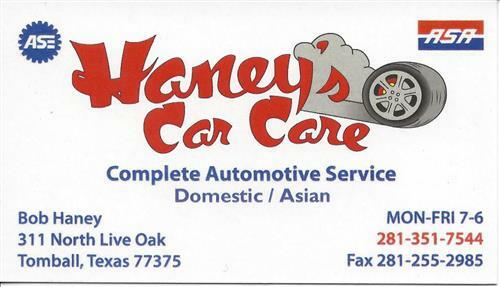 Car Show Still on for 5/17/2015! TBLC Lion President Jerome Teichmiller welcomed guest speaker Mike Baxter, Marketing Director for the City of Tomball, to the 2nd Friday meeting at Pecos Grilling Company. Pictured left-right are TBLC Treasurer Al Gerhardt and City Marketing Director Mike Baxter. Photo provided by Lion Al Gerhardt. President Jerome Teichmiller reminded members of the memorial service on Saturday, April 25th, from 2:00 PM to 2:45 PM for Lions Ron Chene and Ray Dolan. Photo by Lion Al Gerhardt. 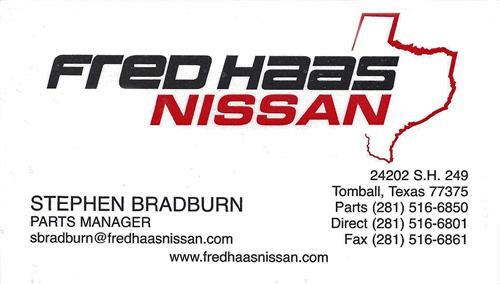 President Jerome Teichmiller reminded members of the District 2-S2 convention at the Radisson Park Inn at 500 N. Sam Houston Parkway East on Saturday, April 25th, from 2:00 PM to 2:45 PM. Photo by Lion Al Gerhardt. 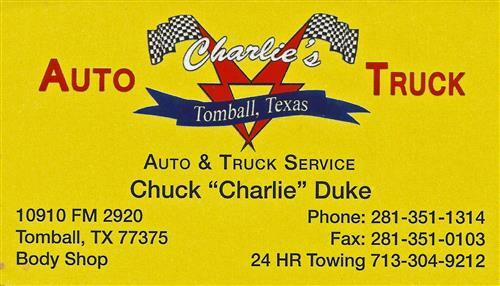 The TBLC participated in the Honky Tonk Festival held at the Depot in Tomball, Texas. Pictured left-right are Danny Zee, Theresa Ross, Rusty Rail, Eva Gerhardt, Karen Halbach, and Mike Halbach. Photo provided by Lion Al Gerhardt. 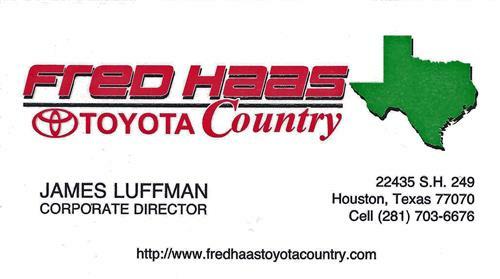 TBLC Lion President Jerome Teichmiller welcomed guest speakers Kent Clingerman with the Harris County Precinct 4 Community Assistance Department to the 2nd Friday meeting at Pecos Grilling Company. 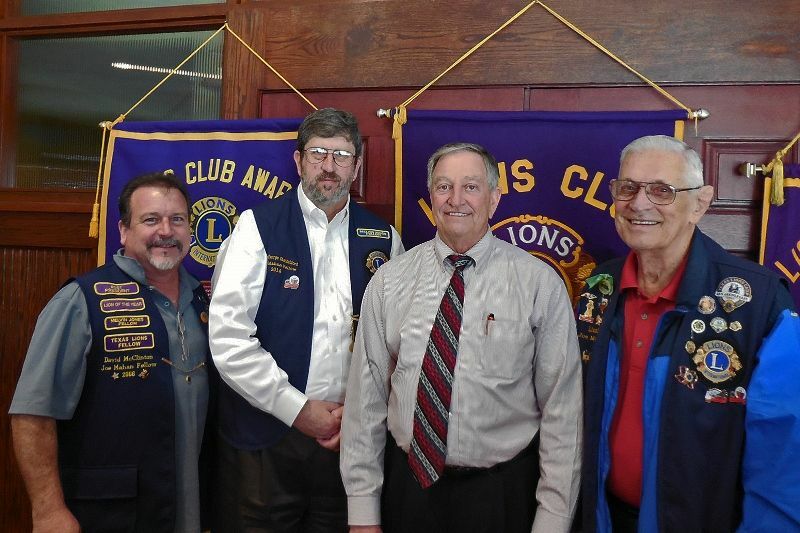 Pictured left-right are President Jerome Teichmiller, Kent Clingerman, and Lion Ken Walters. Photo provided by Lion Al Gerhardt. 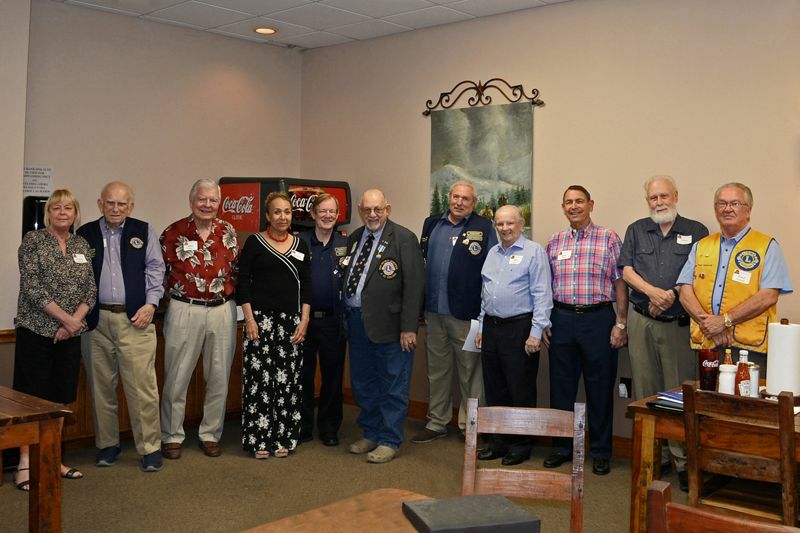 TBLC Lion President Jerome Teichmiller welcomed guest speakers Winnie Mae Eads with the Humanitarian Relief Fund and her husband Paul Eads with the Sight Program for Life to the 2nd Friday meeting at the Pecos Grilling Company. Pictured left-right are PDG Danny Zee, Winnie Mae Eads, PDG Paul Eads and TBLC Vice President Bob Erwin. Photo provided by Lion Al Gerhardt. The TBLC Treasurer Al Gerhardt introduced guest speaker Dr. Penner Schraudenbach, M.D., Adult and Pediatric Urologist, who was assisted by TOMAGWA President and Lion Judy Deyo to the 4th Friday meeting at Pecos Grilling Company. 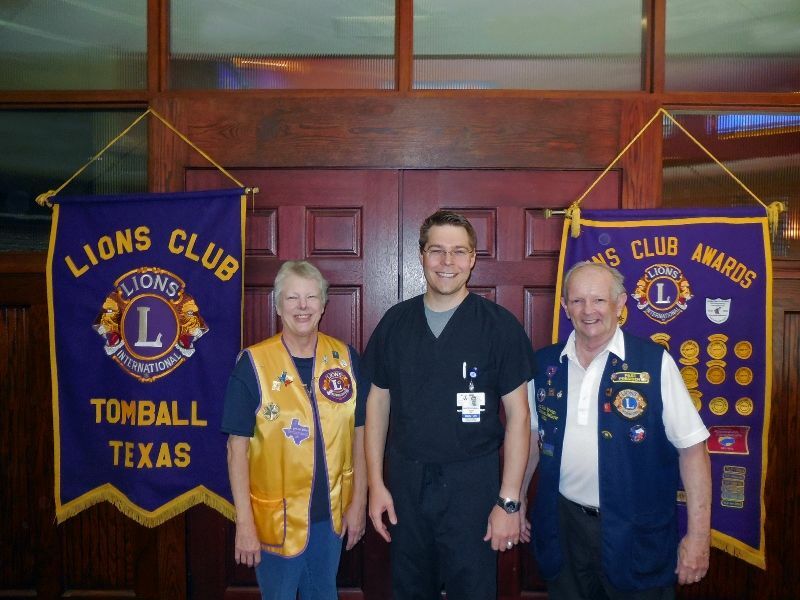 Pictured left-right Lion Neal McDonald, Lion Judy Deyo, Dr. Penner Schraudenbach, M.D. an Lion Danny Zee. Photo provide by Lion Al Gerhardt. The TBLC Treasurer Al Gerhardt and Member Mike Halback made a special gift presentation of $1000 to TOMAGWA Executive Director Judy Deyo for their support of families in need. This is the second check of $1000 making their total giving of $2000 for 2014. Pictured left-right TOMAGWA Senior Director of Development and Pastor Steven G. Lightfoot, TOMAGWA Board Member Phyllis Behrend, Lion Treasurer Al Gerhardt, TOMAGWA Executive Director Judy Deyo, City of Tomball Mayor Gretchen Fagen, Lion member Mike Halback, and TOMAGWA Board Member Deborah Petty. Photo provided by Lion Al Gerhardt. 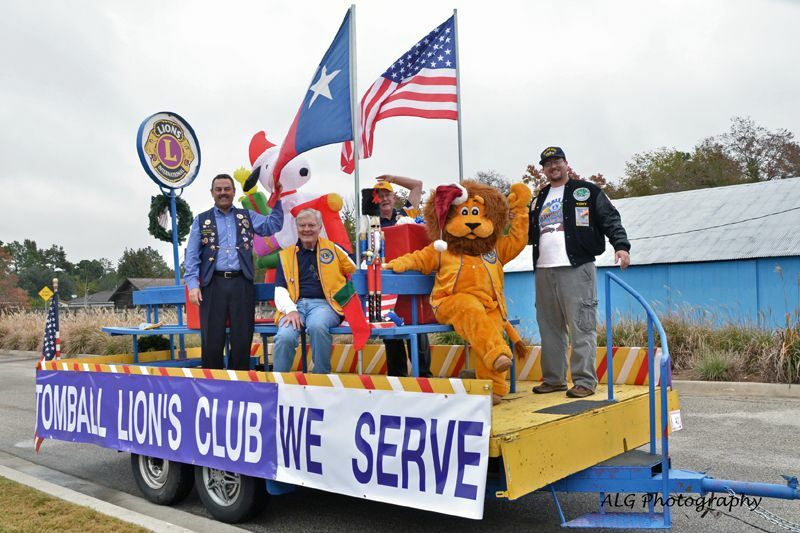 The Tomball Lions Club participated in the 49th Tomball Holiday Parade on November 22, 2014. Pictured from left to right are Tim Fowler, Mike Halbach, Jerome Teichmiller, Tomball Lion (Theresa Ross), and Anthony Ross. Photo by Al Gerhardt. The TBLC Treasurer Al Gerhardt and Lion Mike Halbach makes a special gift presentation of $1000 to TOMAGWA for their support of the needy families in the Tomball, Magnolia, and Waller area. Receiving the gift for Tomagwa was President and Lions Member Judy Deyo. 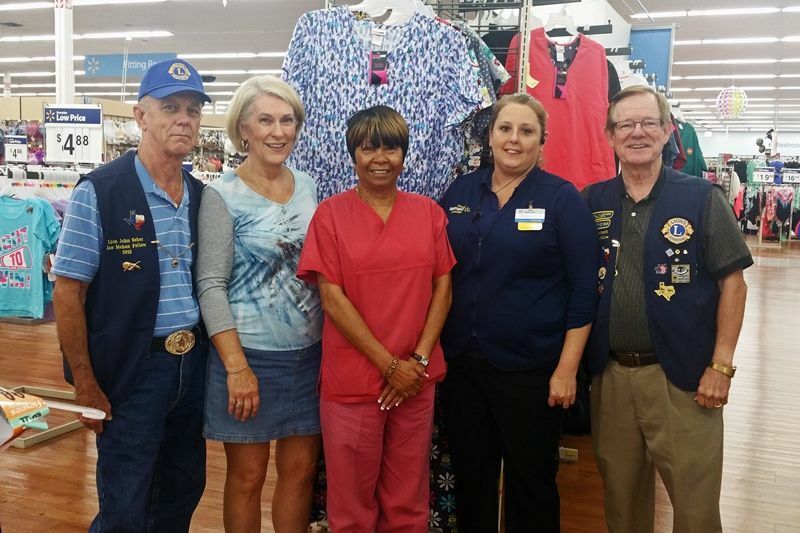 Pictured left-right Tomagwa aids Dottie Hardy and Lamra Grotte, Lions member Mike Halbach, Tomagwa President and Lion Member Judy Deyo, Lion Treasure Al Gerhardt, Tomagwa aids Larie Jones and Lilianna Hinjosa. Lion Al Gerhardt providing Web Site with photo. The TBLC Vice President Bob Erwin welcomed guest speaker Andrea French TAG (Transportation Advocacy Group) to the 4th Friday meeting at Pecos Grilling Company. 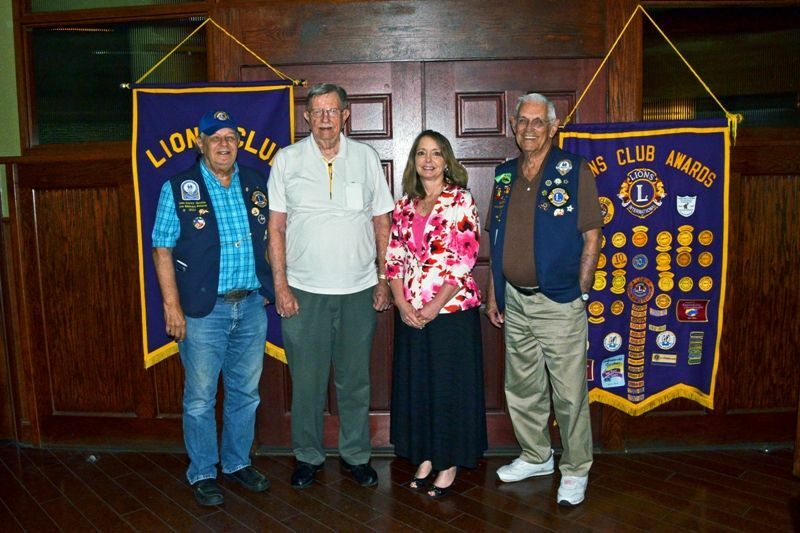 Pictured left-right Lion Vice President Bob Erwin, TAG speaker Andrea French and Lion Secretary George Shackelford. Photo provided by Lion Al Gerhardt. 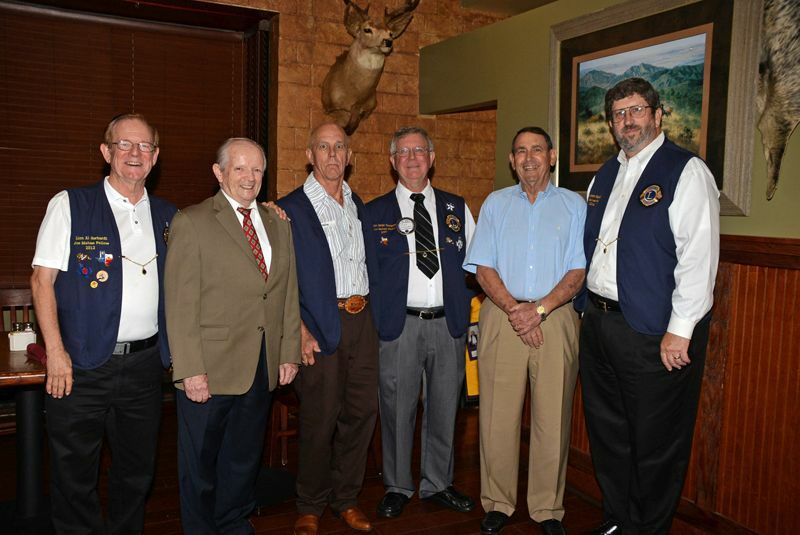 The TBLC President Jerome Teichmiller welcomed guest speakers District 2S2 Governor Chris Moorman to the 2th Friday meeting at Pecos Grilling Company. 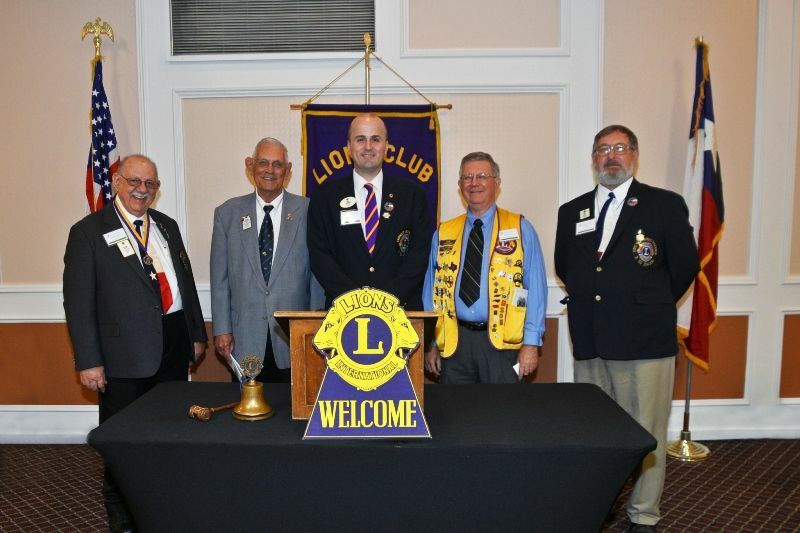 Pictured left-right Lion President Jerome Teichmiller, First Vice District Governor Noah Speer, District Governor Chris Moorman, Second Vice District Governor Mark Roth, and Lion Larry Grotts. Lion Al Gerhardt provided photo. 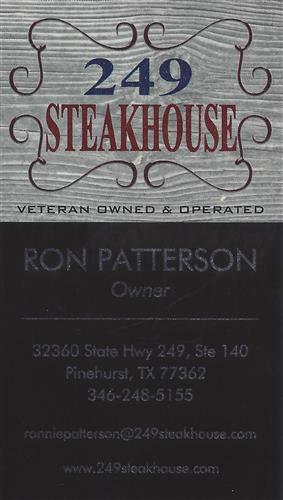 The Annual Bob Dowden Dinner was held at the Great Palace, The Woodlands Texas. Scott Chene and his family received the Jack Weich Fellow Award for his father Ron Chene. 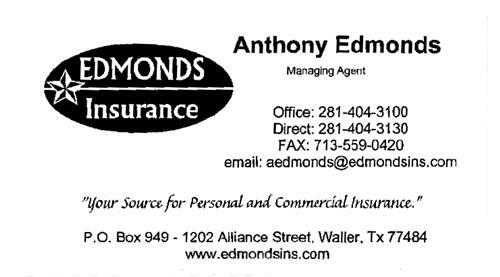 Ron was Past Director of the Texas Lions Camp before his death in August 2014. Pictured left-right Scott Chene, Lions Camp Rep. Trish Wilson, Shannon Chene, Micah Chene, Marissa Chene, and Lion Member John Phillips. Lion Al Gerhardt provided the photo. 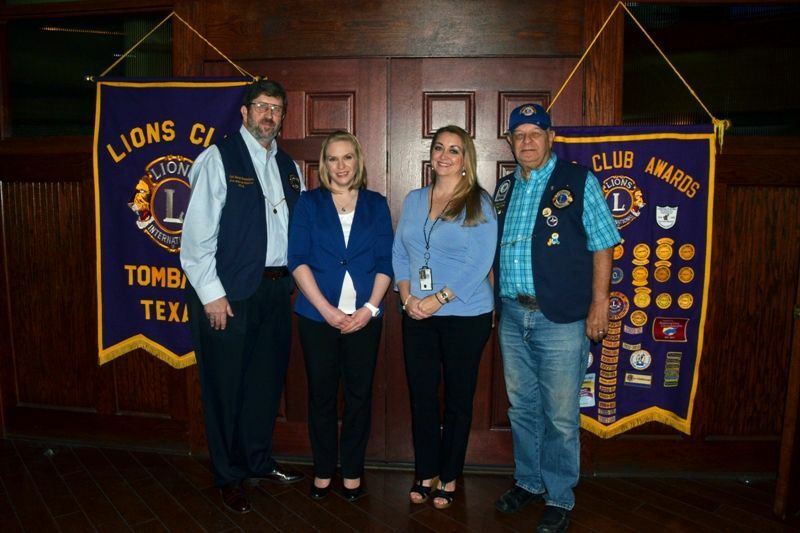 The TBLC President Jerome Teichmiller welcomed guest speakers Audrey M. Umhoefer and Martha Chandler - Tomball VA Clinic to the 4th Friday meeting at Pecos Grill. Pictured left-right Lion Secretary George Shackelford, VA Patient Reps. Audrey M. Umhoefer and Martha Chandler, and Lion Larry Grotts. Photo provided by Al Gerhardt. The TBLC Members Larry Grotts and Danny Zitterich helped welcomed guests David Paulson and Debbie Gray. 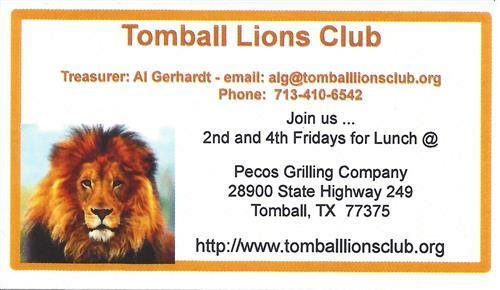 Treasurer Al Gerhardt invited both David Paulson Debbie Gray to the TBLC 4th Friday meeting at Pecos Grill. Pictured left-right. Larry Grotts, David Paulson, Debbie Gray, and Danny Zitterich. 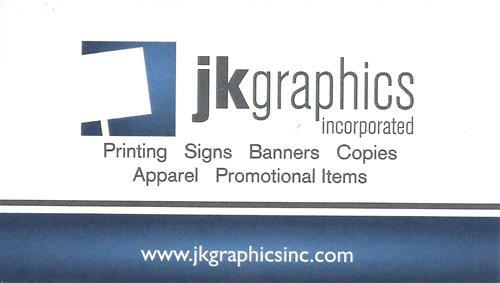 Club photographer Al Gerhardt provided the Web Site photo. The TBLC President Jerome Teichmiller and Board member John Seber helped welcomed guest Debbie Gray. Treasurer Al Gerhardt invited Debbie to the TBLC 2nd Friday meeting at Pecos Grill. Pictured left-right John Seber, Debbie Gray, and Jerome Teichmiller. Club photographer Al Gerhardt provided photo. 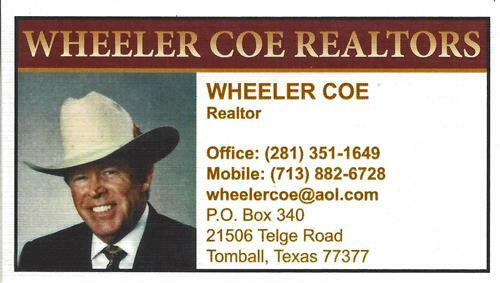 The TBLC President Jerome Teichmiller welcomed guest speakers PDG Noah Speer, Tomball Fire Chief Randy Parr, and Pct. 4 David Riddle Outreach Director to the 4th Friday meeting at Pecos Grill. Pictured left-right Lion John Seber, PDG Noah Speer, Fire Chief Randy Parr, David Riddle Pct. 4 Director, and Lion Larry Grotts. Lion Al Gerhardt providing Web Site with photo. The TBLC President Jerome Teichmiller welcomed guest speaker Brian Bayani - NWEMS to the 2nd Friday meeting at Pecos Grill. Pictured left-right President Jerome Teichmiller, NWEMS Chief Brian Bayani, and Member Larry Grotts. Photo courtesy of Al Gerhardt. 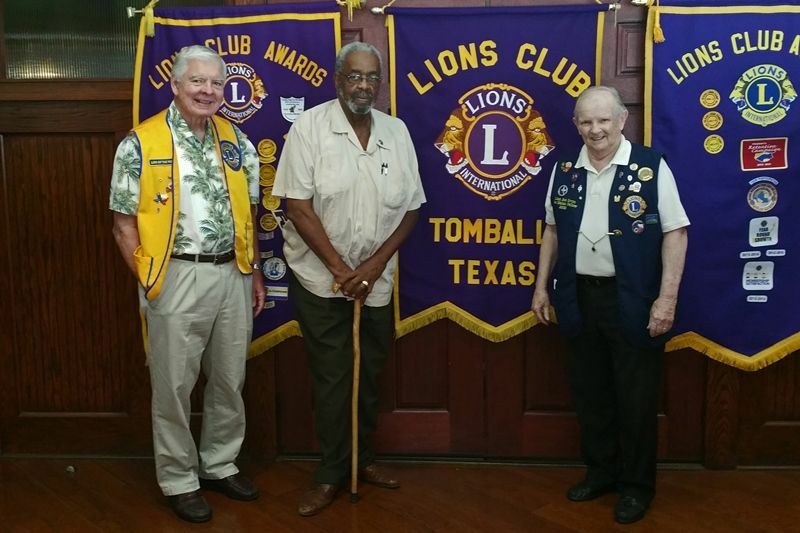 Ron Chene - 69 years old - Long time member of the Tomball Lions Club passed away on August 6, 2014 after a wonderful 5 day vacation with his wife Sue of 47 blessed years. 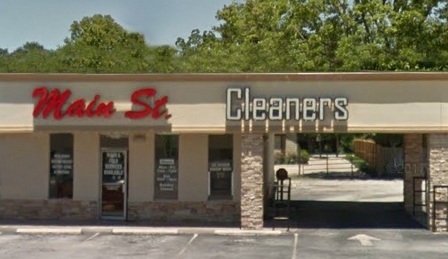 Ron's sharing service will be held at the Lord of Life Lutheran Church at 11am on Saturday August 16, 2014. 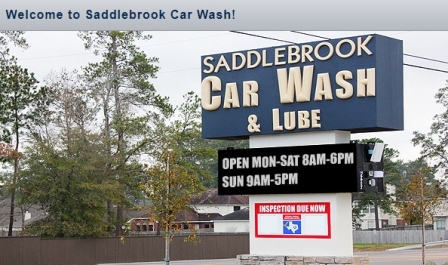 The church is located at 3801 S Panther Creek Dr., The Woodlands Texas 77381. Time will be available for anyone wishing to share a wonderful story about Ron. 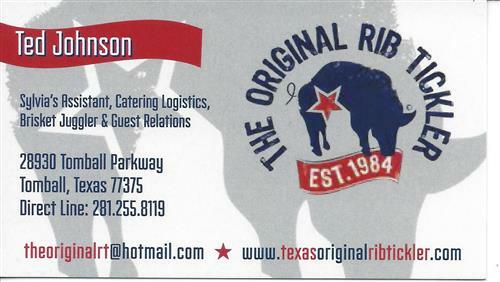 The Tomball Lions Club 2014-2015 Officers were installed on 06/24/14 at Pecos Grilling Company. Pictured left-right are George Shackelford, John Phillips, Naomi Kleb, Jerome Teichmiller, Joe Sebesta, and Al Gerhardt. Officers Bob Ervin and Mary Pat Trenkle are not pictured. 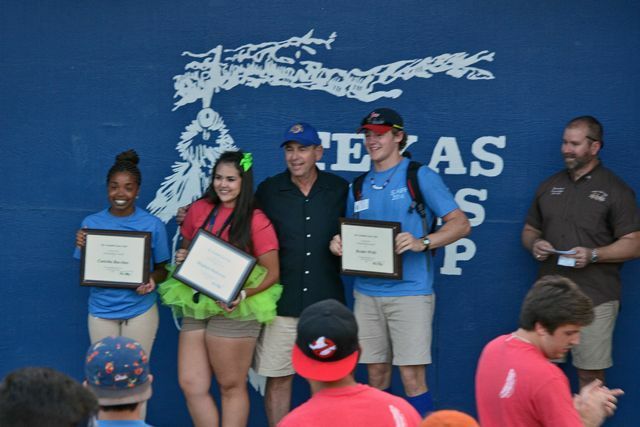 The TBLC Annual Texas Lions Camp Scholarship was presented to the Texas Lions Camp Counselors. 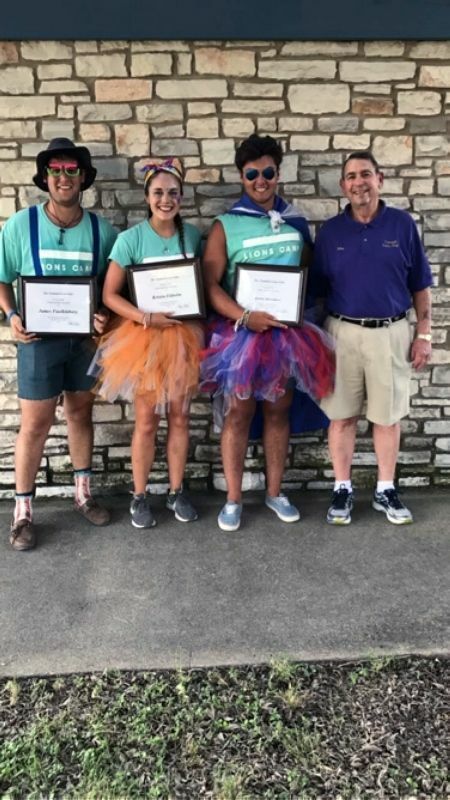 TBLC Camp Rep. John Phillips (3rd from left) and Texas Lions Camp Leader (far right) are pictured with the three Lions Camp $750 scholarship recipients. 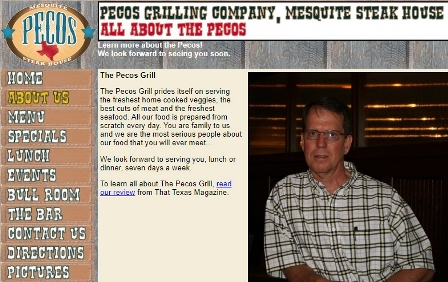 TBLC member Ron Chene welcomed guests to the 2nd Friday meeting at Pecos Grill. Pictured left-right Karen Halback, Ron Chene, and Mike Halback. Naomi Kleb providing Web Site with photo. 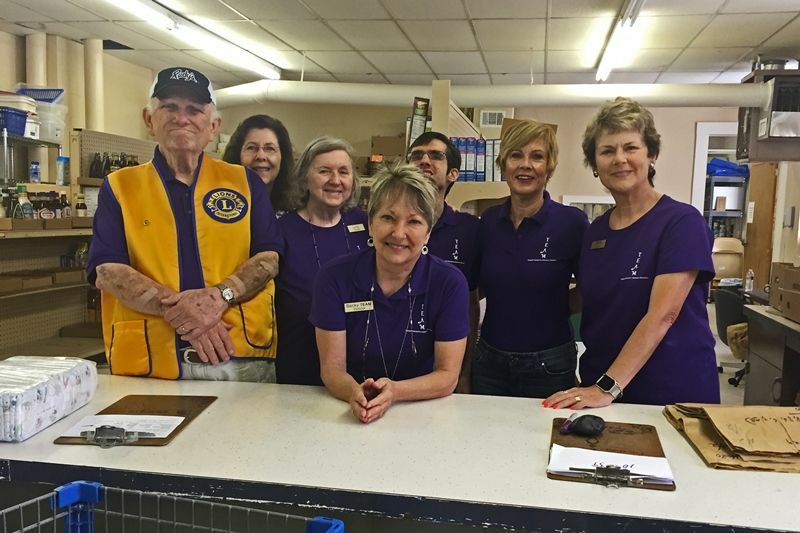 On May 7, 2014, the Tomball Lions Club members picked up donated eyeglasses to be delivered to Lions Club International for worldwide distribution. Pictured is Danny Zee. Photo taken by George Shackelford. 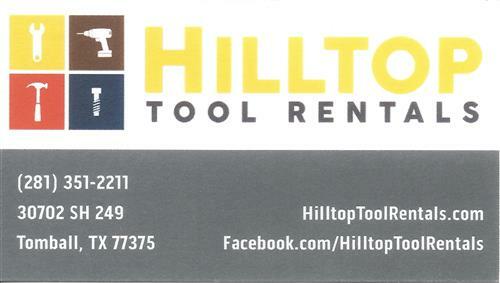 On May 3, 2014 the Lions Club 96th District 2S2 Convention was held at the Greens Point Hilton in Houston, Texas. Several members of the TBLC attended the Dist. 2S2 Convention as delegates. Pictured left to right are: Danny Zee, Noah Speer, Ron Chene, Eddie Risha, and Chris Moorman. Al Gerhardt took the photo. 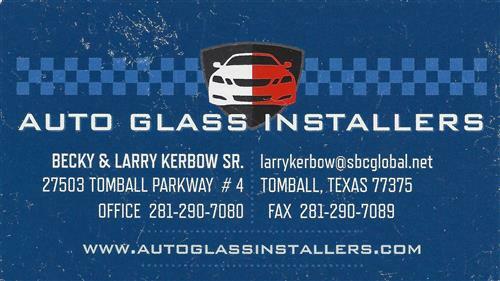 On April 27, 2014, the Tomball Lions Club held the 20th Annual Car Show at the Depot in Tomball, Texas. 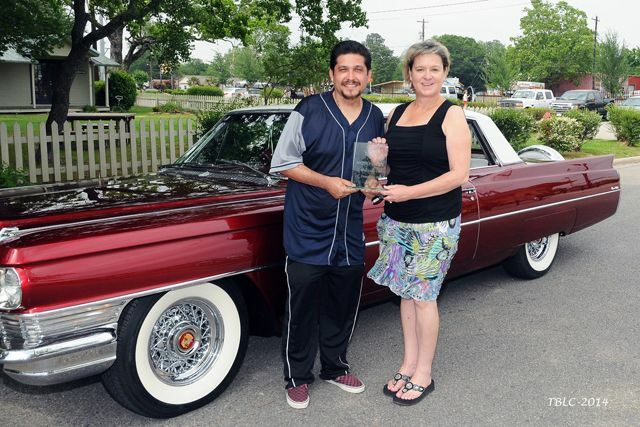 Pictured from left to right are Mayor Award Winner Gildardo Ortiz and Tomball Mayor Gretchen Fagan. 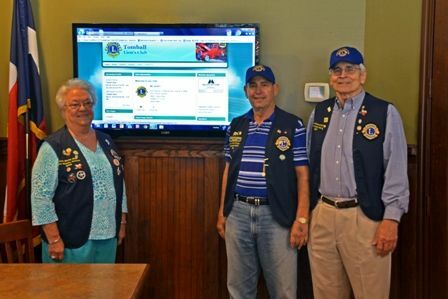 On 3/28/2014, Web Director Al Gerhardt made a presentation for the new Tomball Lions Club web site (www.tomballlionsclub.org). 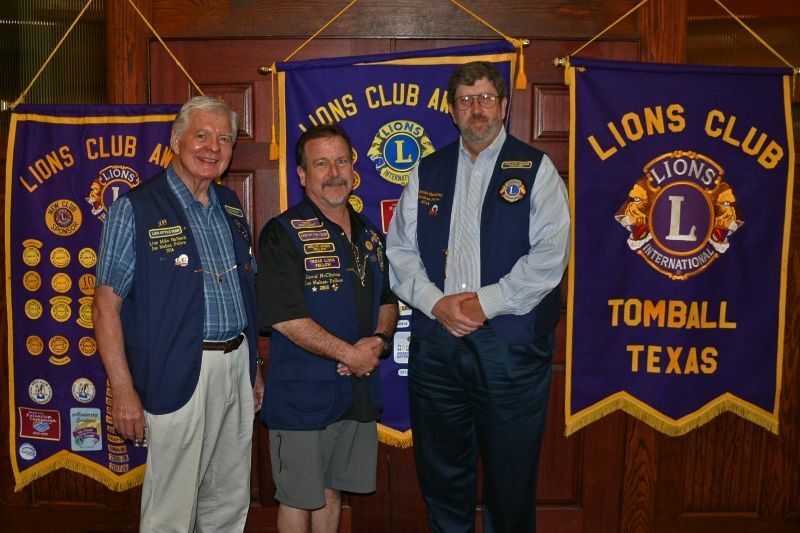 Pictured from left to right are Lion Members Naomi Kleb, John Phillips, and Glenn Graff. 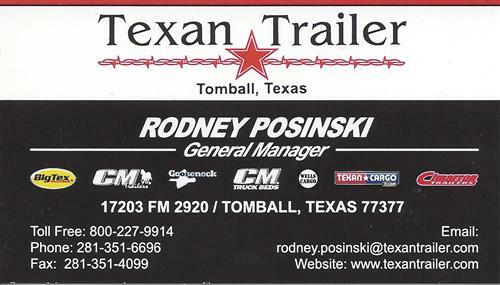 The Honky Tonk Festival was held at the Tomball Depot on March 15, 2014 from 11AM - 7PM. 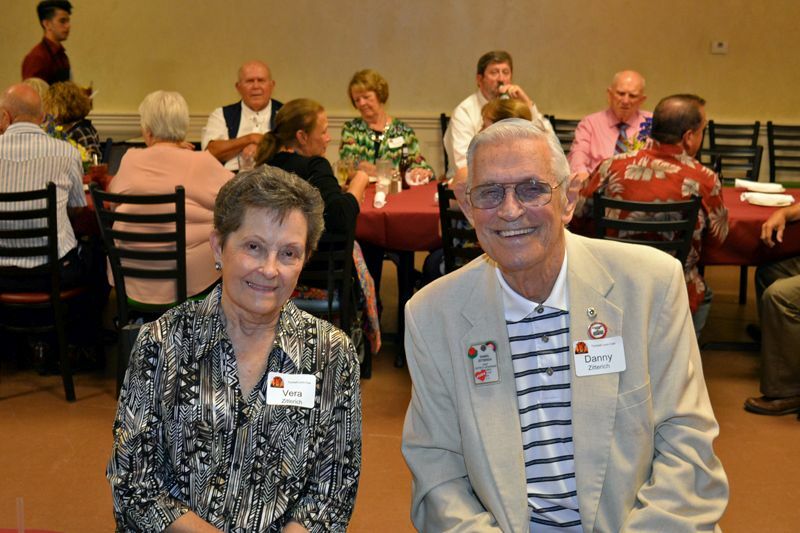 Pictured from left to right are Lion Membership Director Teresa Ross and Lion Treasurer Al Gerhardt. 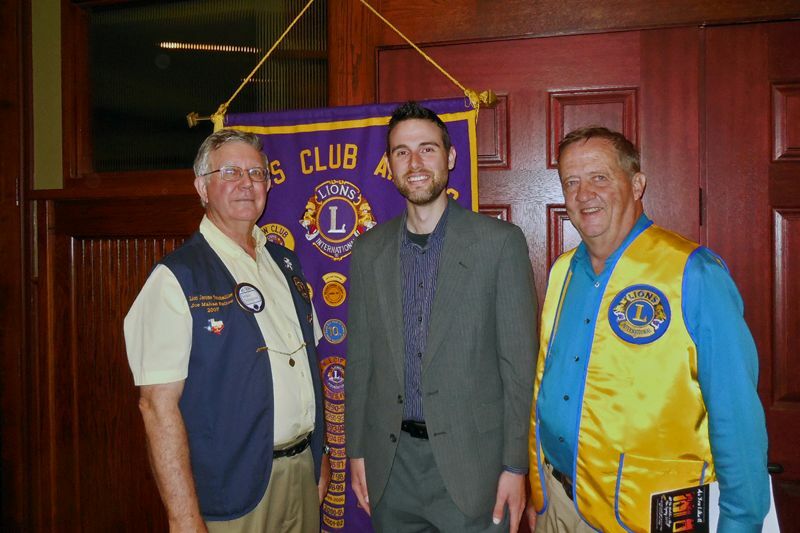 The speaker for the Tomball Lions Club 1st monthly meeting on March 14, 2014 was Carl Gerhardt, web master for Club Runner Web Sites. 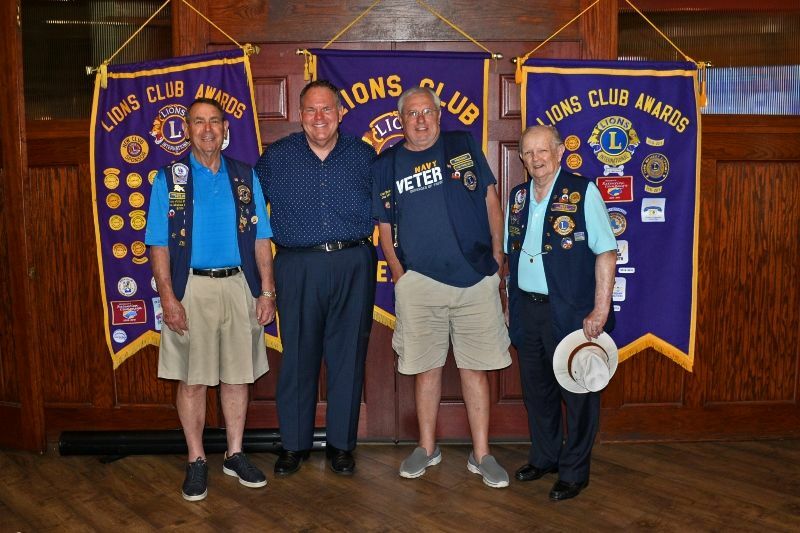 Pictured from left to right are Lion Member John Seber, Speaker Carl Gerhardt, President Danny Zitterich, and Lion Member Glenn Graff. We are all excited to see how ClubRunner will revolutionize the way we manage our day to day activities, as well as communicate more effectively. ClubRunner makes it easy to publish your eBulletin, and send to all your members and friends.